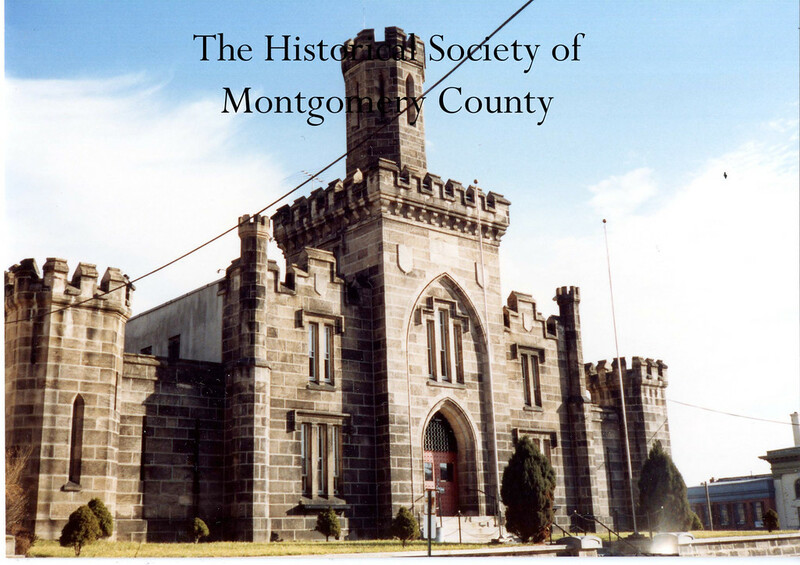 This photo from the Historical Society of Montgomery County shows the prison in Norristown in the 1980s. 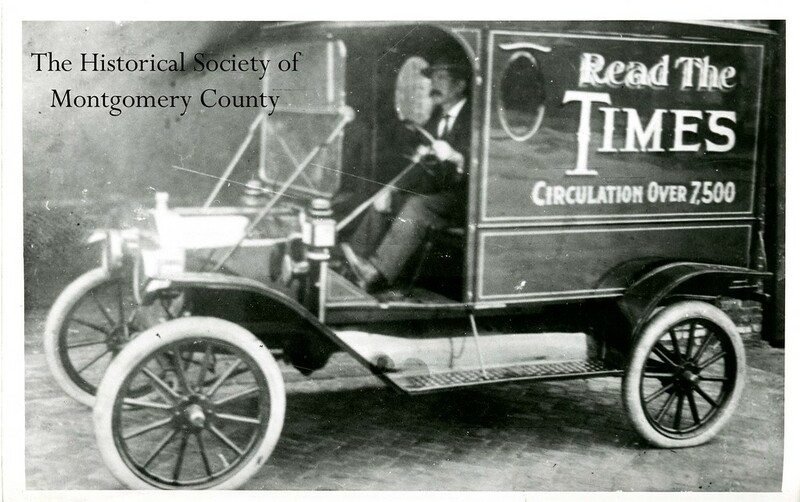 This photograph from the Historical Society of Montgomery County shows an old Times Herald delivery truck. This undated Times Herald file photo shows the construction of the Matsonford Bridge in Conshohocken. 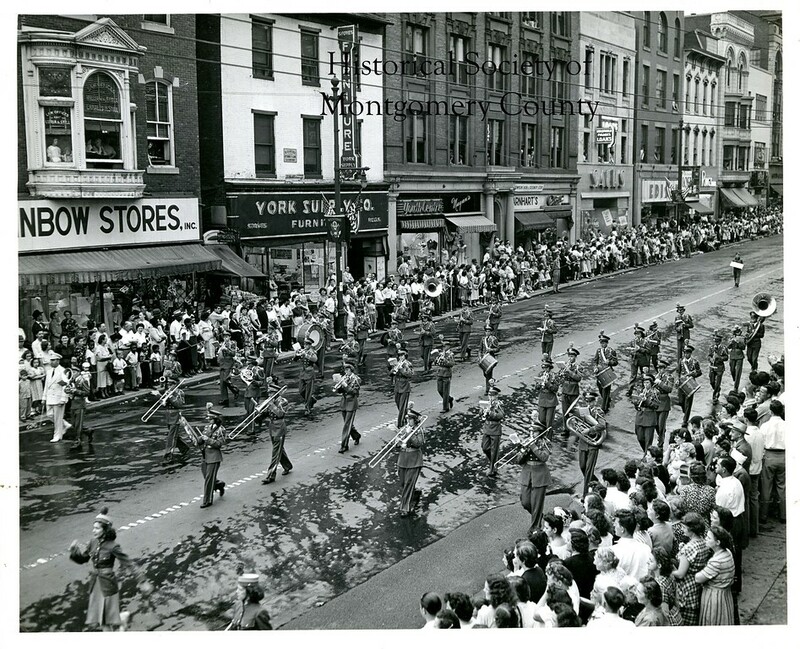 This photo from the Historical Society of Montgomery County shows the Upper Merion High School band marching in York, Pa. in 1949. 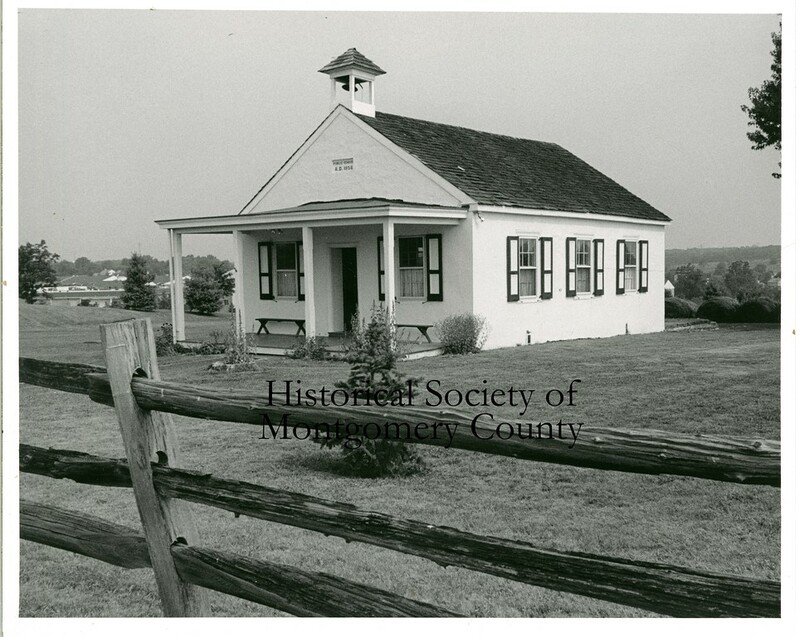 This photo from the Historical Society of Montgomery County shows the Franklinville School, a one room schoolhouse located at 1701 Morris Rd. in Blue Bell, in 1992. 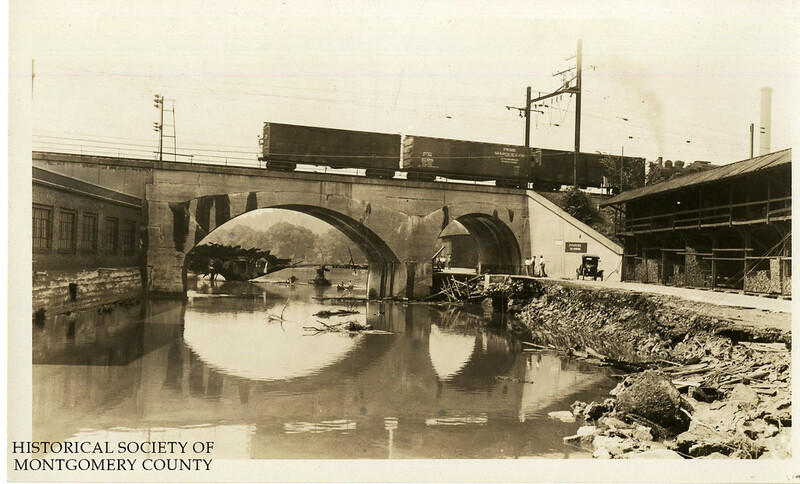 This is an undated photo of West Conshohocken from the Historical Society of Montgomery County. This undated photo from the Historical Society of Montgomery County shows a mill on Bethlehem Pike in Whitemarsh. 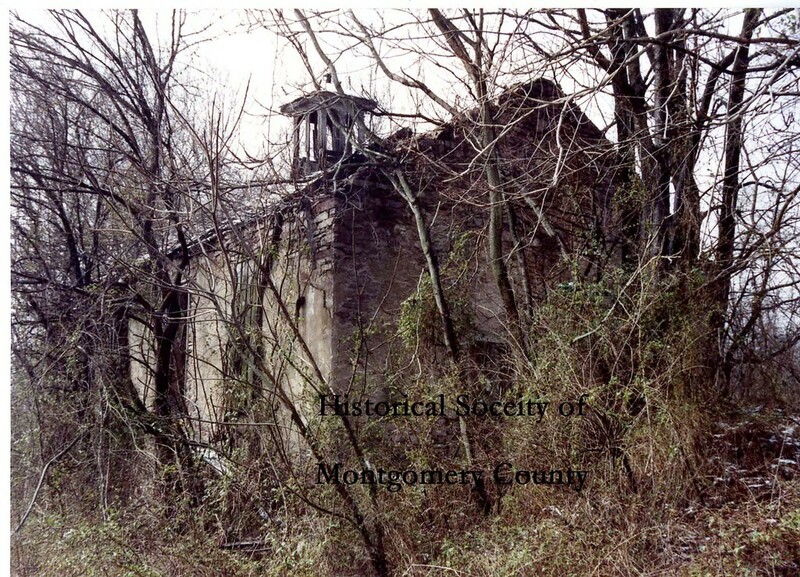 This photo from the Historical Society of Montgomery County shows the ruins of a school house that was located at Militia Hill Road and Stenton Avenue in Whitemarsh. The photo was taken in 1992. 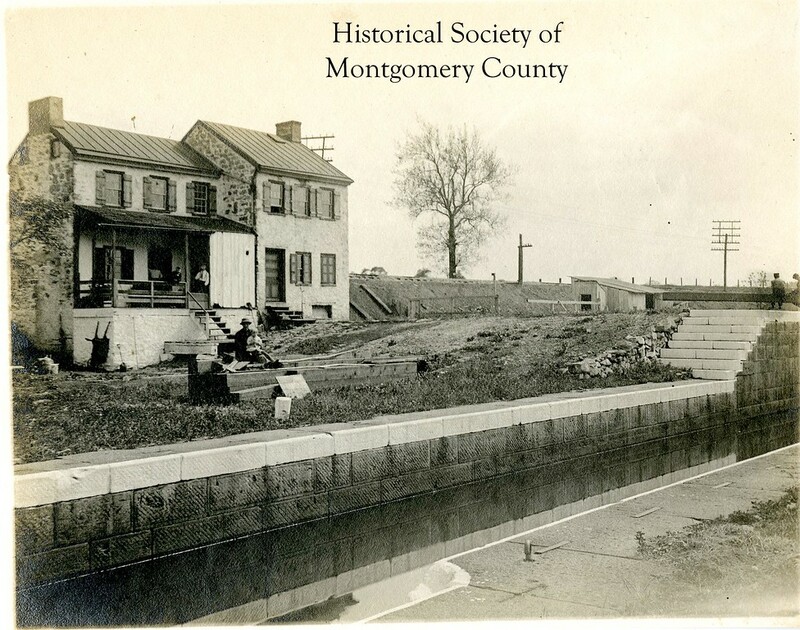 This undated photo from the Historical Society of Montgomery County shows the Catfish Dam in Upper Merion. 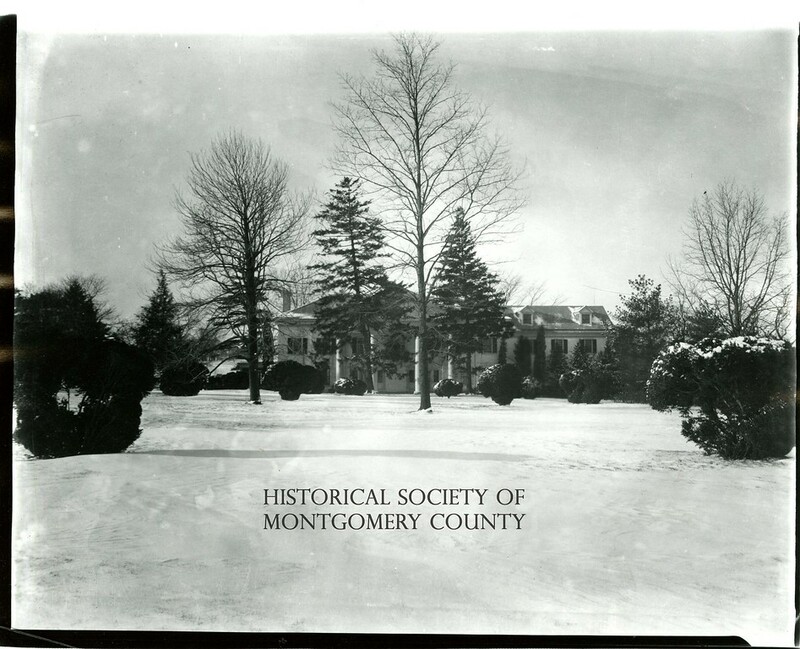 This undated photo from the Historical Society of Montgomery County shows the Collegiate Institute in Upper Merion. 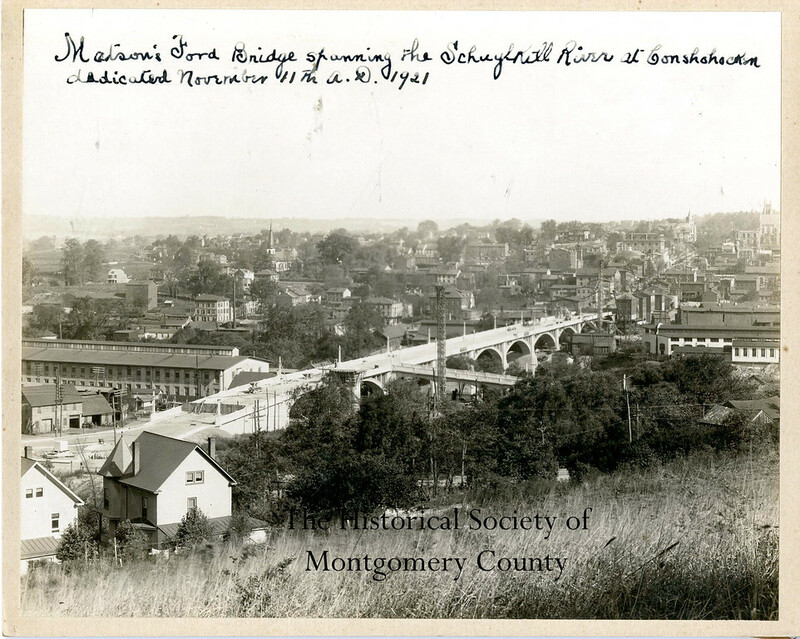 This photo from the Historical Society of Montgomery County shows Bubbling Spring Park, which was off Barren Hill Road in Spring Mill (Whitemarsh Township). This picture is from the 1920s. 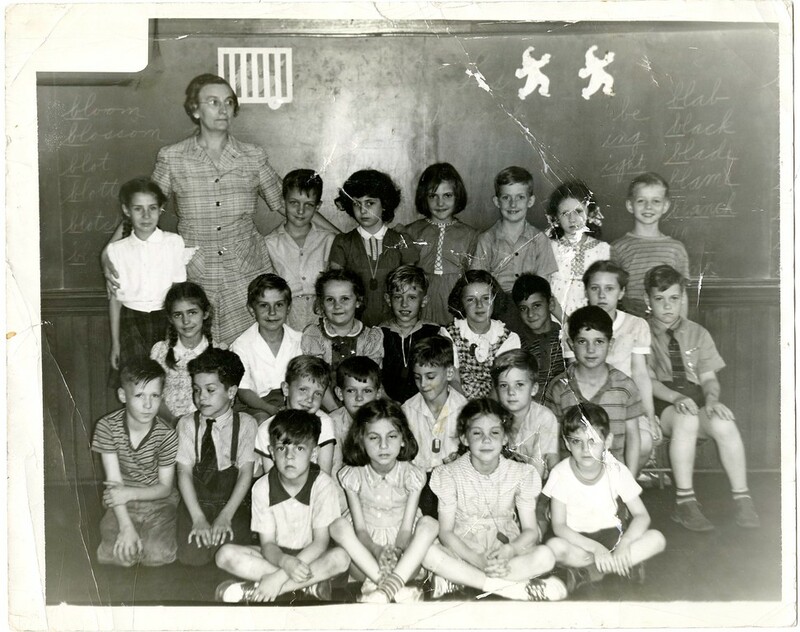 This undated photo from the Historical Society of Montgomery County shows the Port Kennedy School. It was built in 1912 and remained in use until 1960. This undated photo from the Historical Society of Montgomery County shows the Seven Stars Inn that was located on Ridge Pike in Plymouth. It was razed in 1969 and had been an inn since 1770. 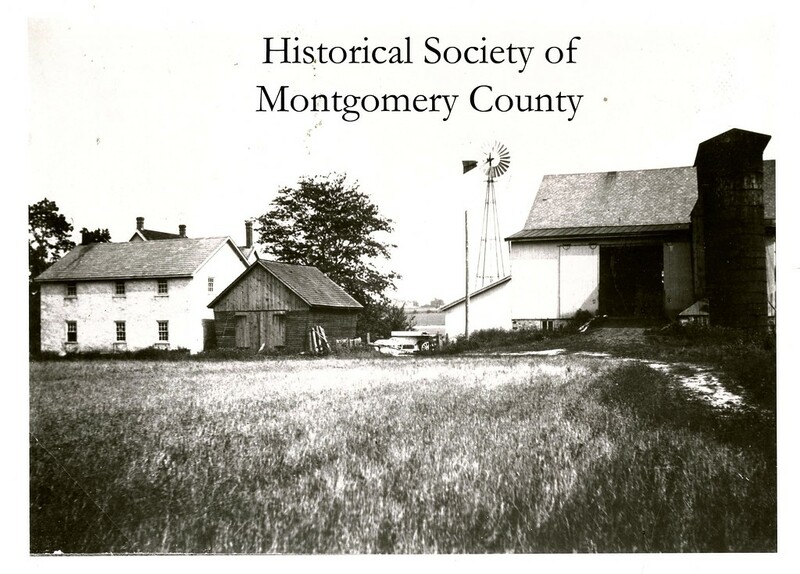 This photo from the Historical Society of Montgomery County shows Murphy Farm, which was on Yost Road in Whitpain, in 1925. 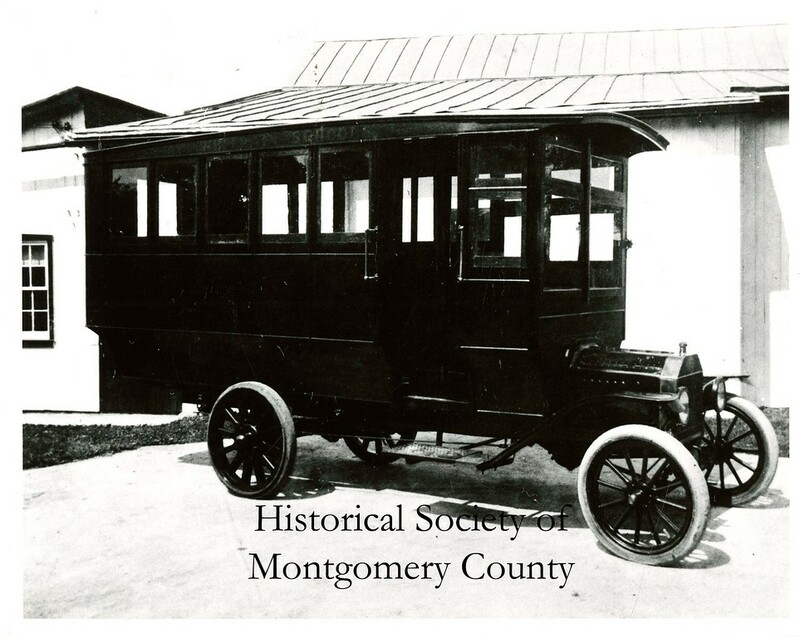 This photo from the Historical Society of Montgomery shows the first school bus in Whitpain in 1916. 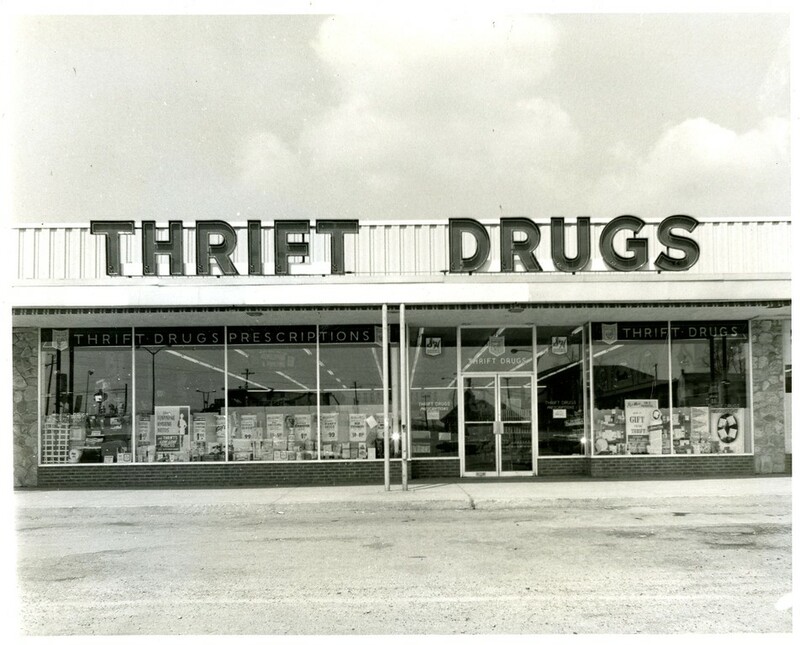 This photo from the Historical Society of Montgomery County shows Thrift Drugs in Logan Square (now Norristown Centre) in 1970. The photo was taken by Jules Marsella. 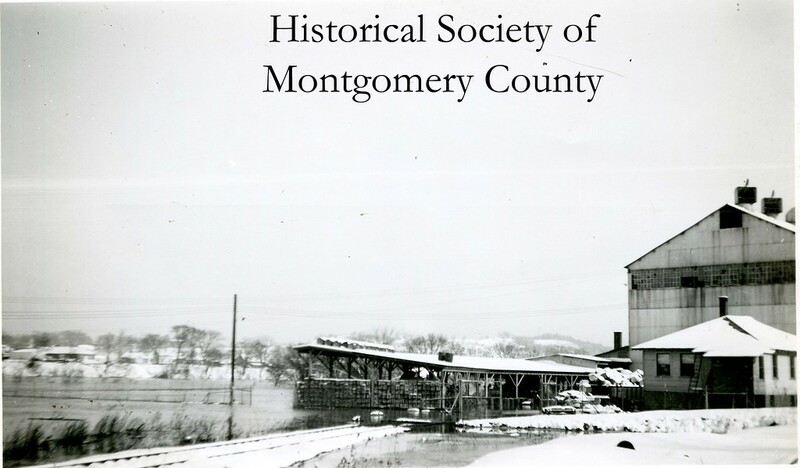 This photo from the Historical Society of Montgomery County shows another view of the Hamilton Paper Company in Whitemarsh during a flood. 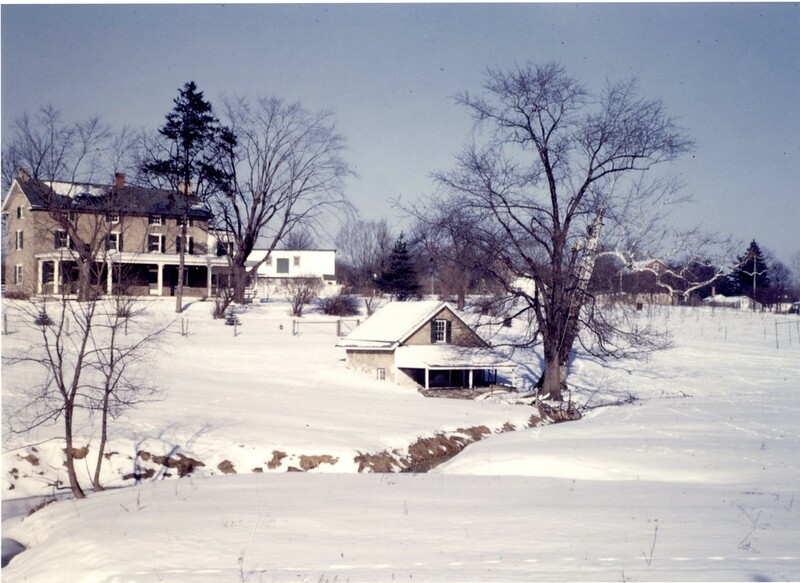 The Historical Society believes this flood occurred in November 1950. 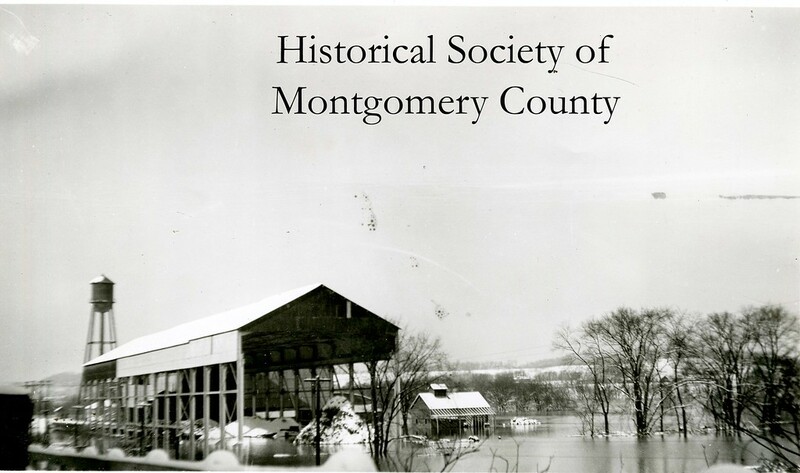 This photo from the Historical Society of Montgomery County shows a flood in the Miquon section of Whitemarsh Township. The historical society believes this flood occurred in November 1950. 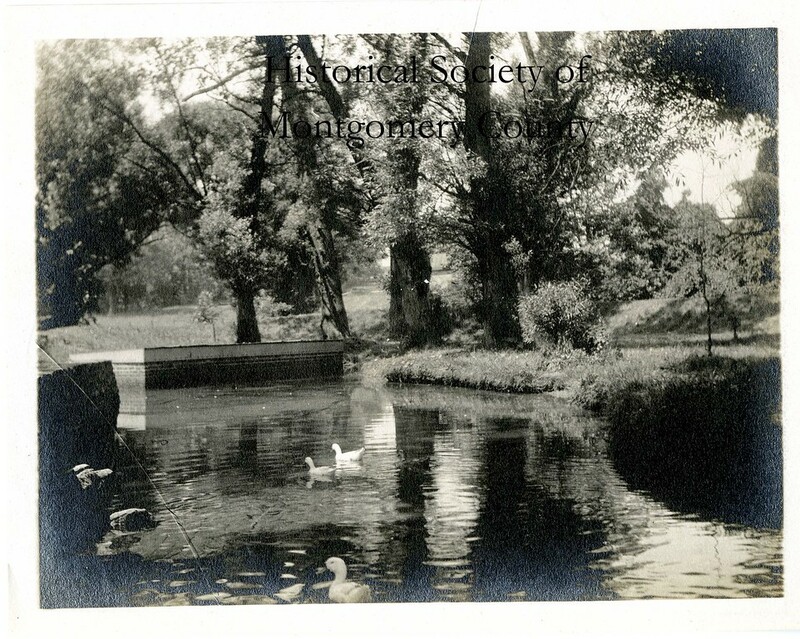 This undated photo from the Historical Society of Montgomery County shows Woodmont in Lower Merion. It was built by Alan Wood of Alan Wood Steel, located in Conshohocken. 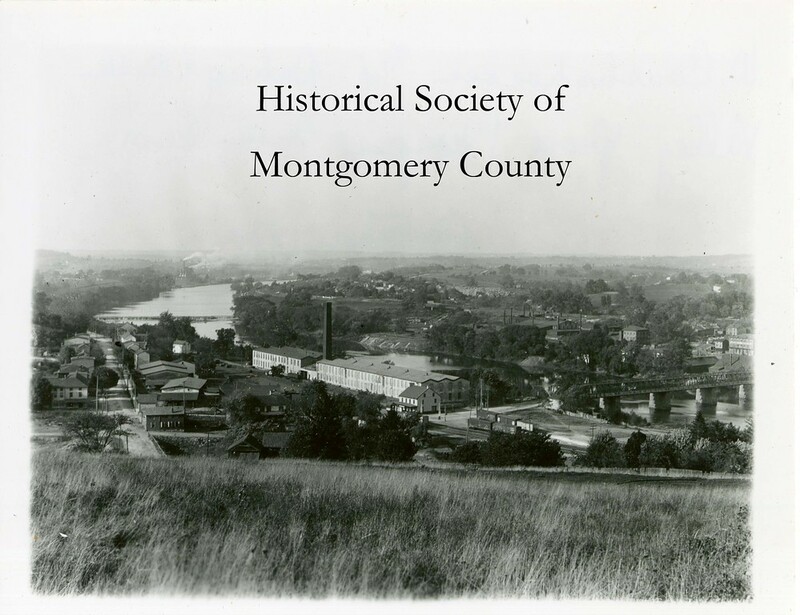 This undated photo from the Historical Society of Montgomery County shows the William Mogee's Quarry in Norristown. 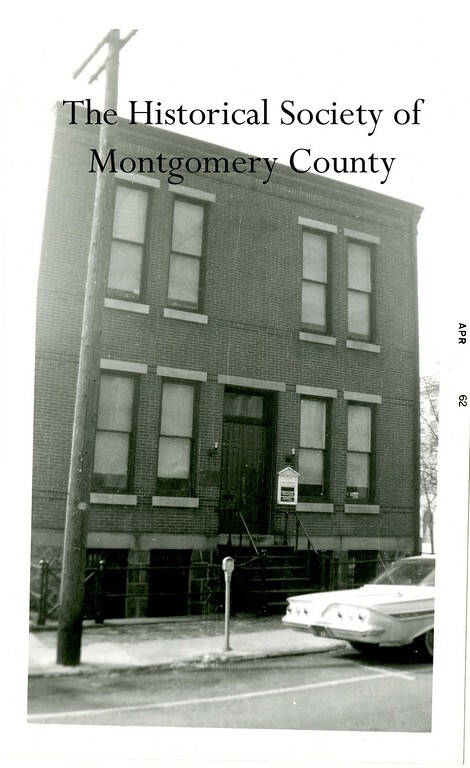 This undated photo from the Historical Society of Montgomery County shows Jarrett House, which was the home of Armand Jarrett on West Main Street in Jeffersonville. It was later a Nationwide Insurance Office. 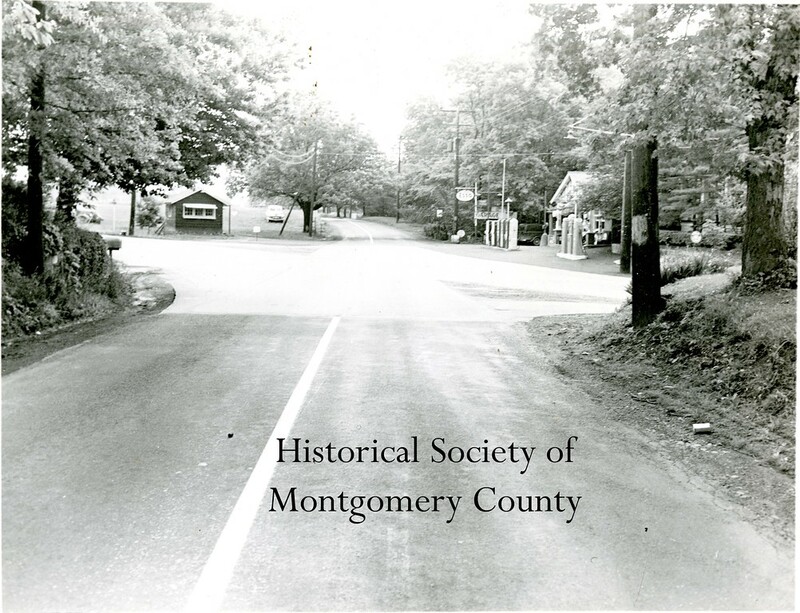 This photo from the Historical Society of Montgomery County shows Schrack's Corner, located at Egypt and Trooper roads, in 1950. 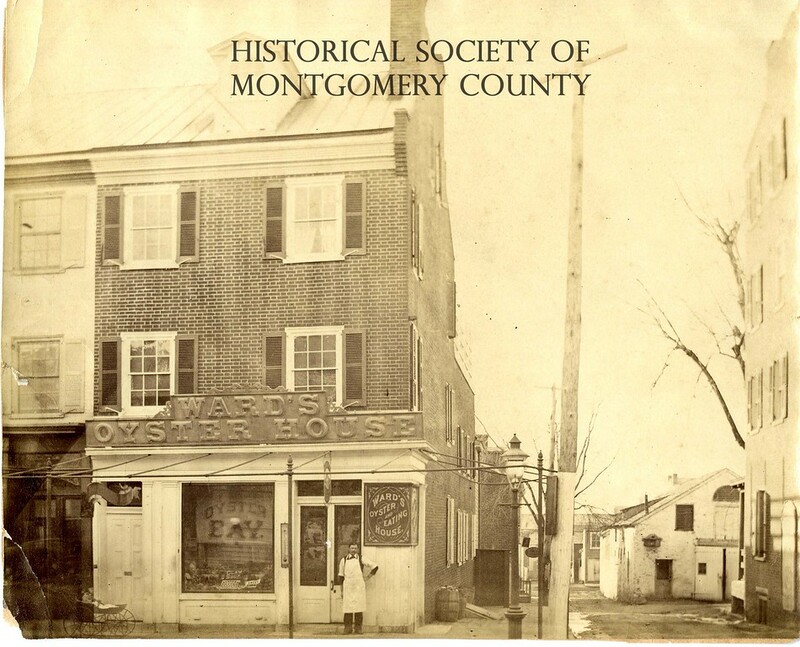 This undated photo from the Historical Society of Montgomery County shows Schrack's Corner, located at Egypt and Trooper roads. 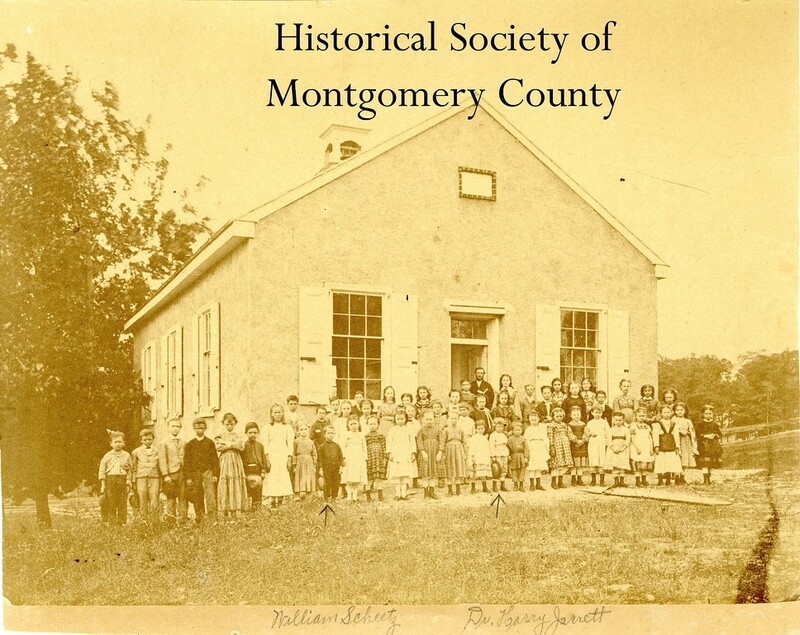 This photo from the Historical Society of Montgomery County shows the Indian Creek School in 1870. The school was built around 1866 on land originally donated by Isaac Norris for a school. This undated photo from the Historical Society of Montgomery County shows he Marple “long shed” in Plymouth Meeting — it used to be called “Hickoryville.” The people in the photo are, from left, Mr. Senedefer, Mr. Lysinger, Mary Bennet Hipple, Grandfather Marple, Bessie V. Hipple, Mr. Davis, Mr. Sam Davis and Mr. Joe Amblers. 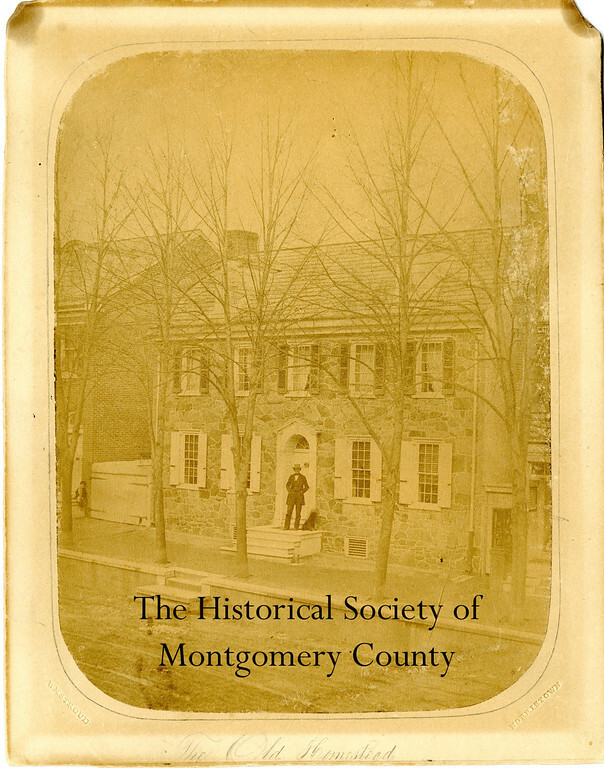 The undated photo from the Historical Society of Montgomery County shows the Keith House at Graeme Park in Horsham. According to graemepark.org, it is the only surviving residence of a Colonial Pennsylvania Governor. 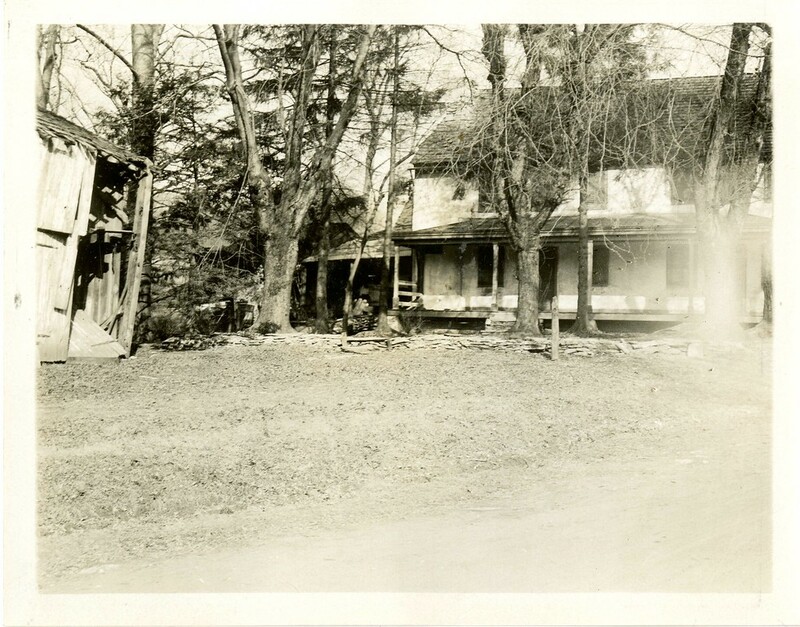 This undated photo from the Historical Society of Montgomery County shows the McFarland Farm in Gulph Mills. 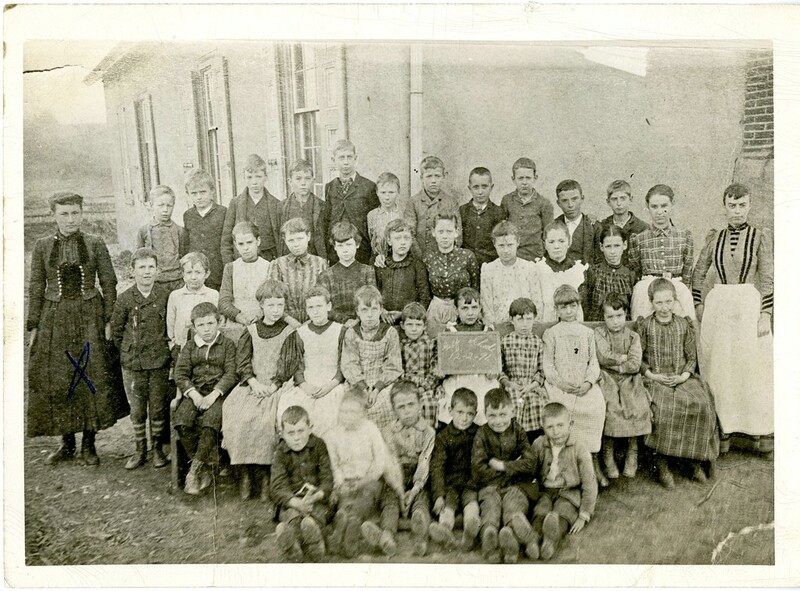 This photo from the Historical Society of Montgomery County is a class picture from the Gulf School in 1891. The teacher on the right is Ann Davis. 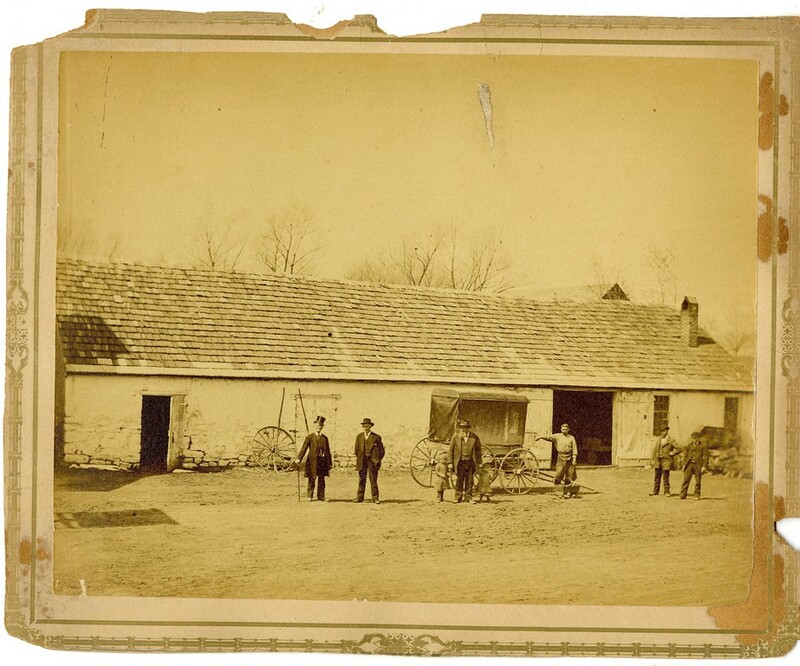 This undated photo from the Historical Society of Montgomery County shows Wheelwright , which was a wheelwright shop. It was demolished in 1951 by the highway department. 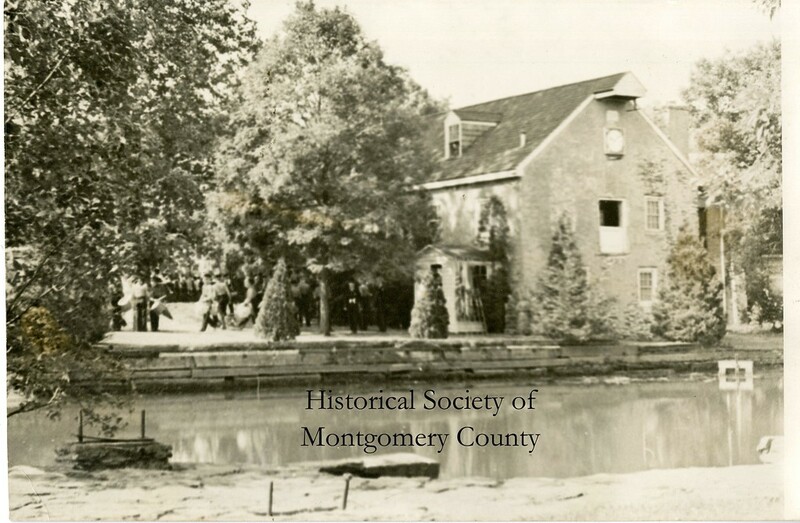 This undated photo from the Historical Society of Montgomery County shows the Bird in Hand Tavern, which was located in Gulph Mills. 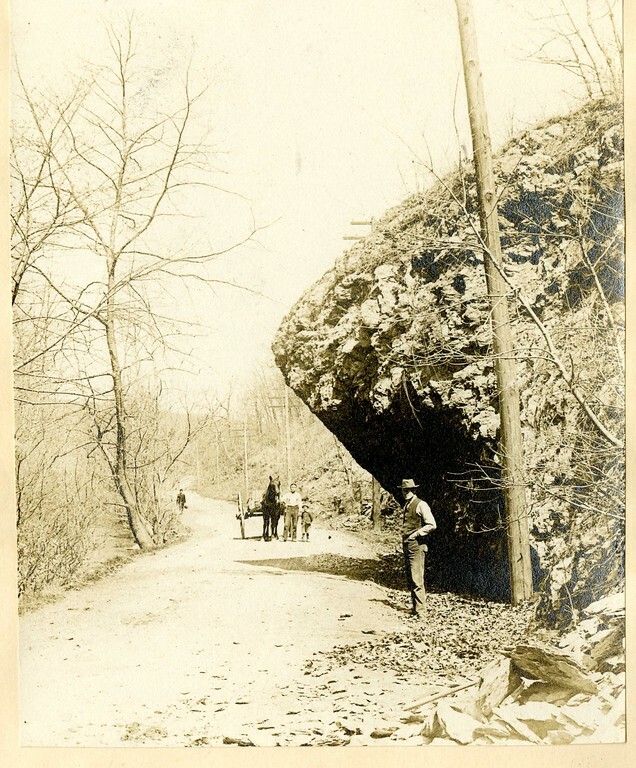 This photo from the Historical Society of Montgomery County shows Route 320 and Gulph Road in Upper Merion during the late 19th or early 20th century. 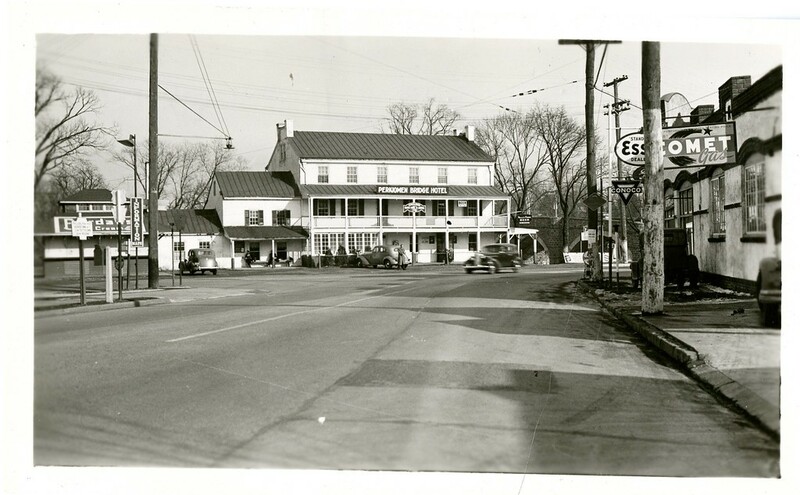 This photo from the Historical Society of Montgomery County shows the property at Germantown Pike and 202 in East Norriton in 1948. It was then owned by Dr. Irving Eney. 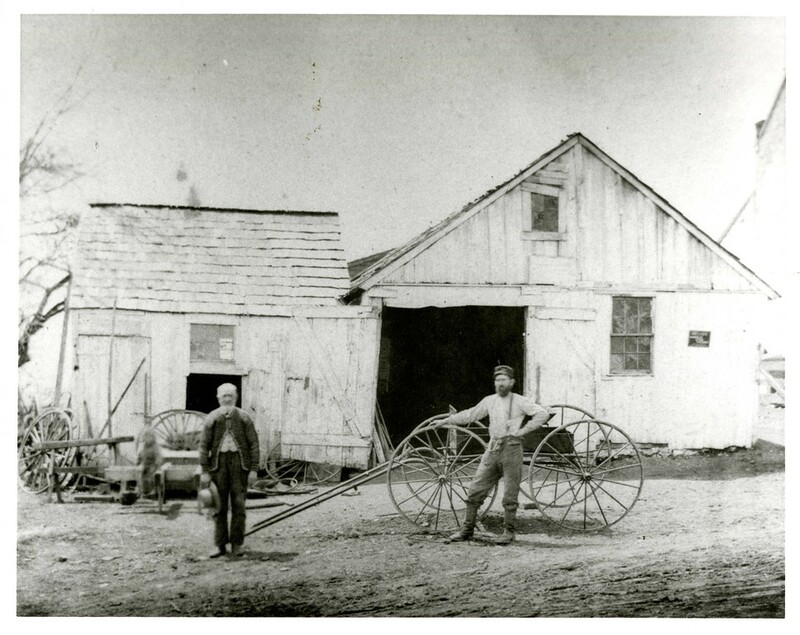 This photo from the Historical Society of Montgomery County shows Andrew Bean, a blacksmith in Fairview Village, Worcester, with his son, also named Andrew Bean, in 1870. 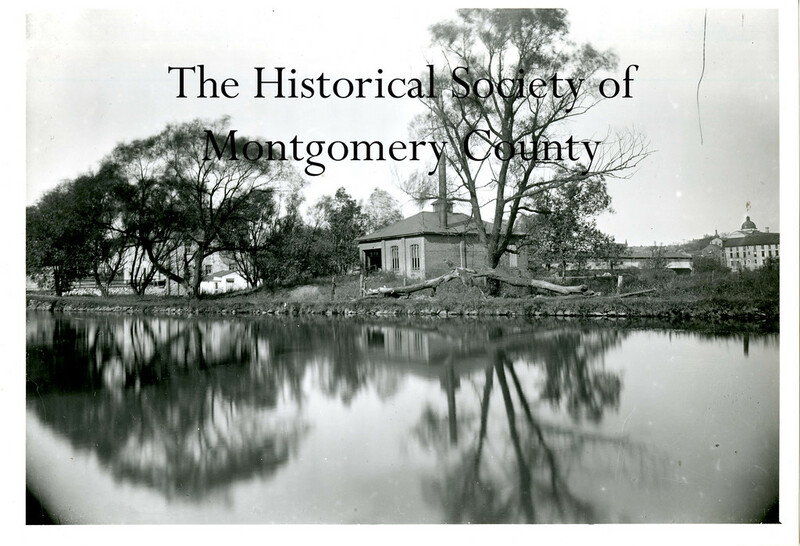 This photo from the Historical Society of Montgomery County was taken in Conshohocken in 1934. 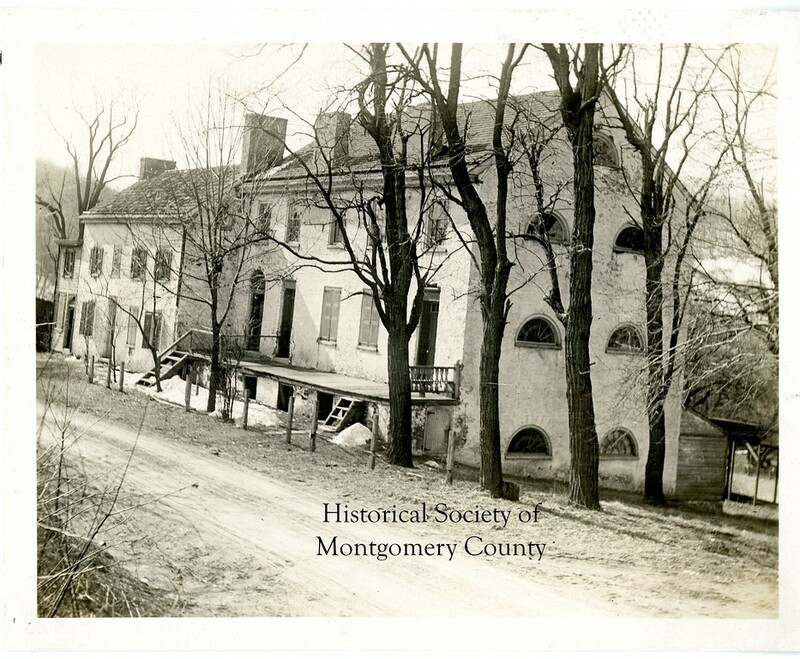 This undated photo from the Historical Society of Montgomery County shows the Lukens House in Conshohocken. It was demolished in 1940 and replaced by a post office. 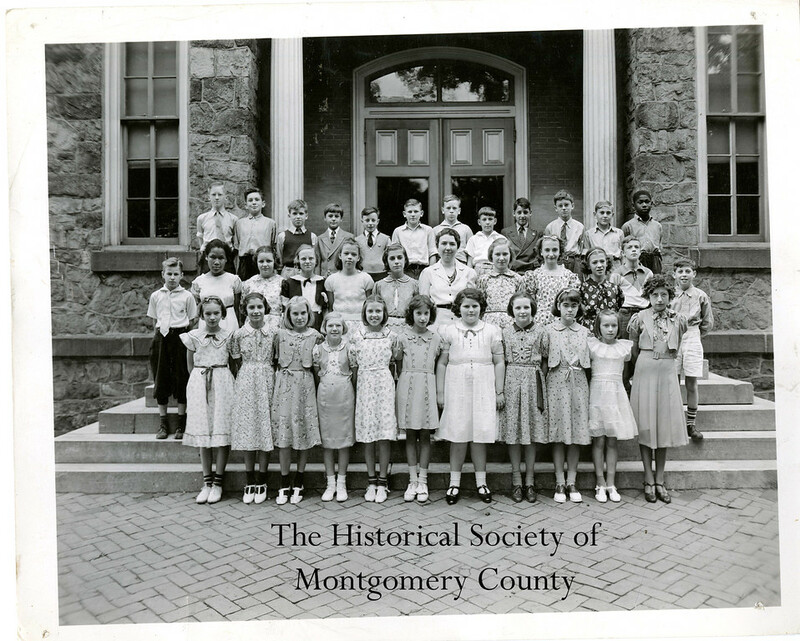 This photo from the Historical Society of Montgomery County shows a class picture taken at the Harry Street School in Conshohocken in the 1940s. The teacher is Bessie Nace. 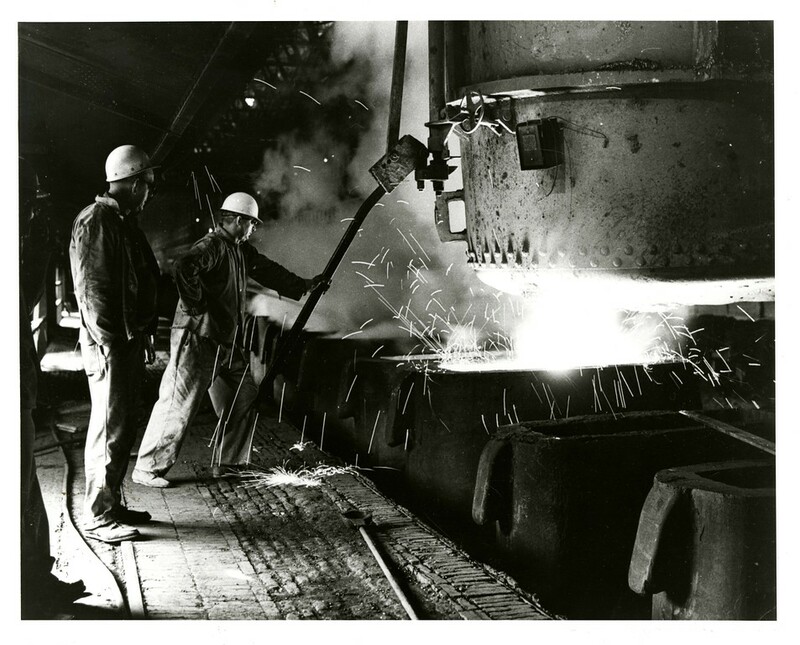 This undated photo from the Historical Society of Montgomery County shows two men working at Alan Wood Steel in Conshohocken. The photo was taken by an executive. 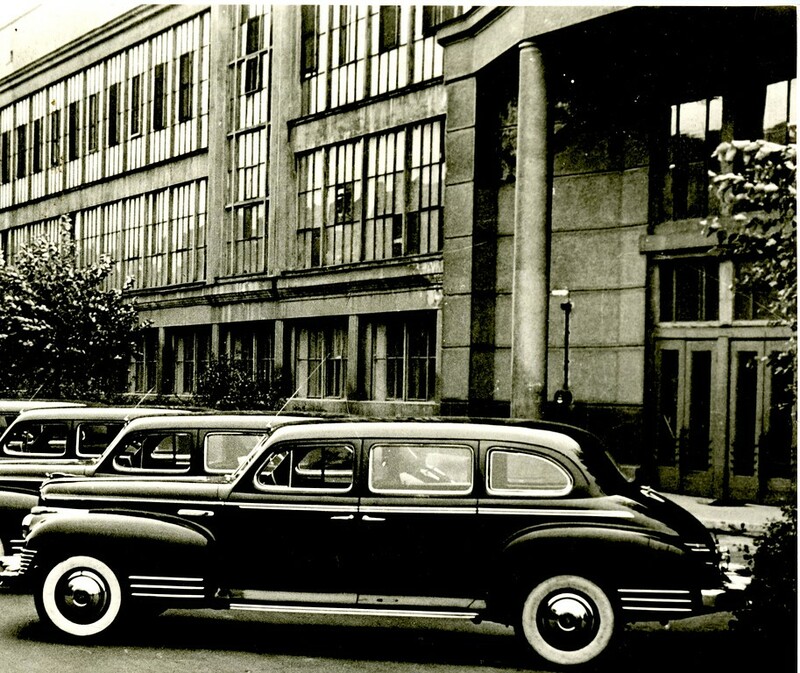 This photo from the Historical Society of Montgomery County shows Lee Tires in Conshohocken around 1940. 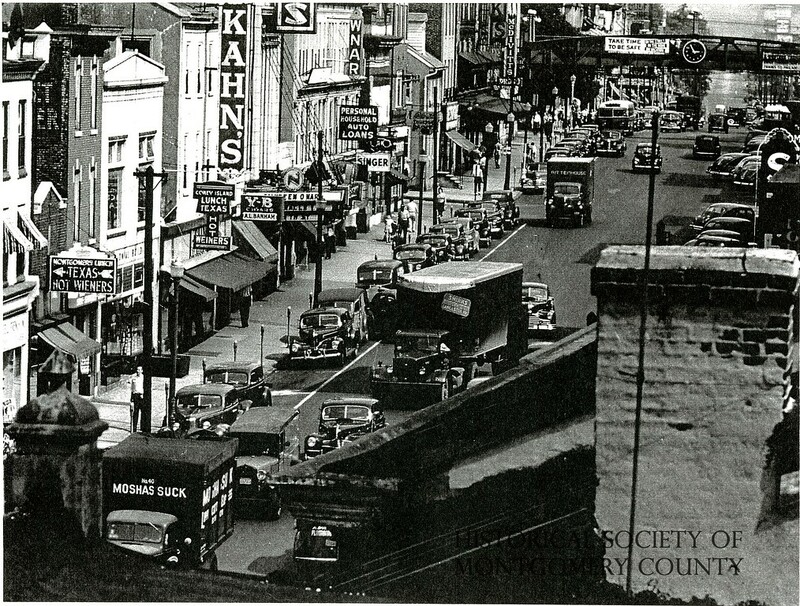 This undated photo from the Historical Society of Montgomery County shows Fayette Street in Conshohocken. The Matsonford Bridge can bee seen in the background. 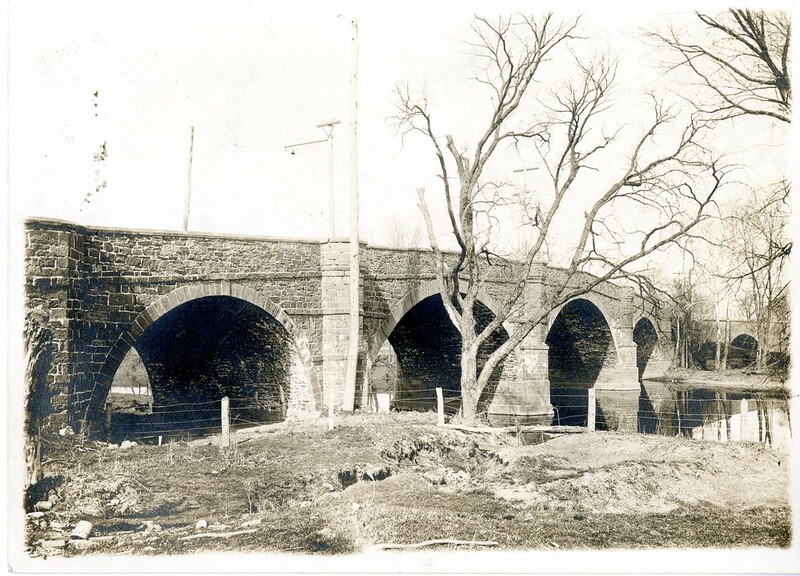 This undated photo from the Historical Society of Montgomery County shows the Perkiomen Bridge in Collegeville. 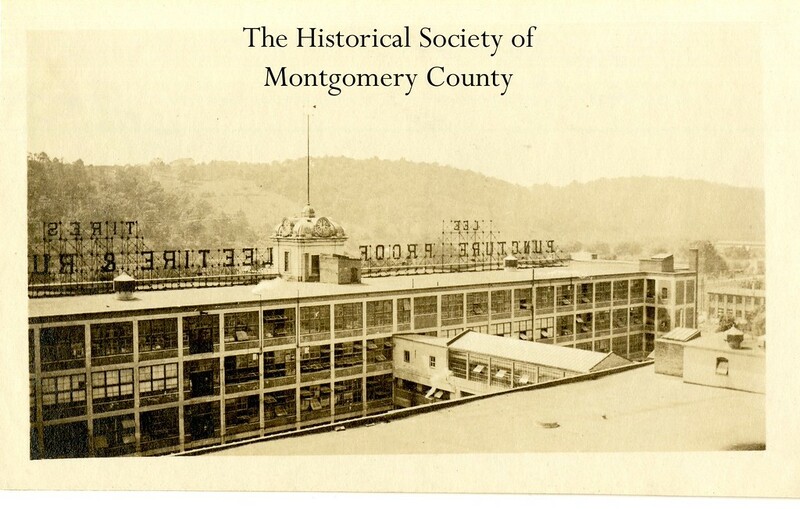 This photo from the Historical Society of Montgomery County show the Perkiomen Bridge Hotel, which was located in downtown Collegeville. This photo was taken sometime in the 1940s or 1950s. This photo from the Historical Society of Montgomery County shows the railroad tracks in Collegeville, c. 1940. 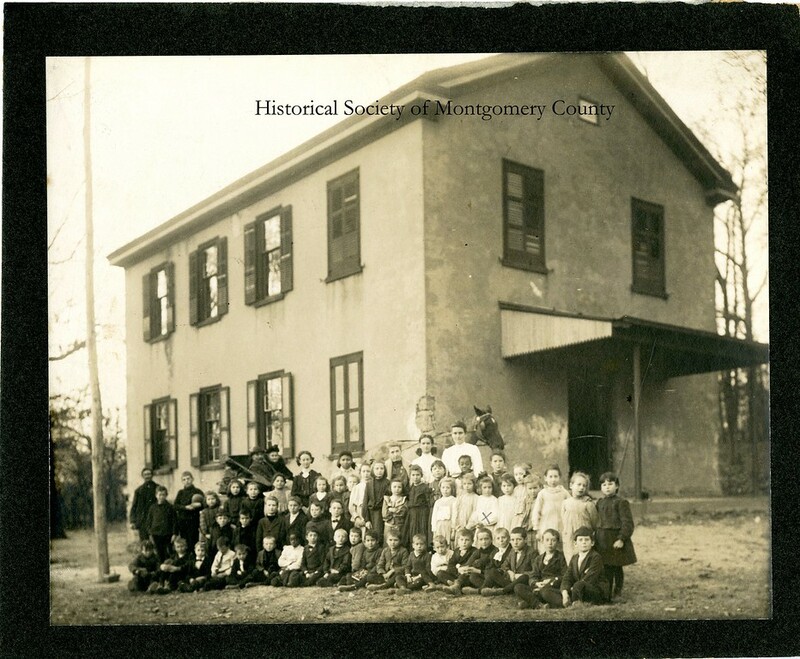 This undated photo from the Historical Society of Montgomery County shows the Octogonal School House in Conshohocken. 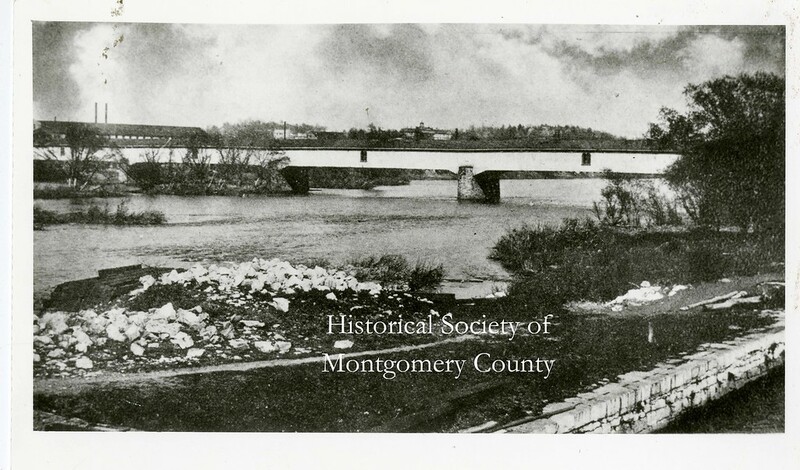 This photo from the Historical Society of Montgomery County shows the Matson Ford Bridge spanning the Schuylkill River in Conshohocken. The bridge was dedicated on Nov. 11, 1921. 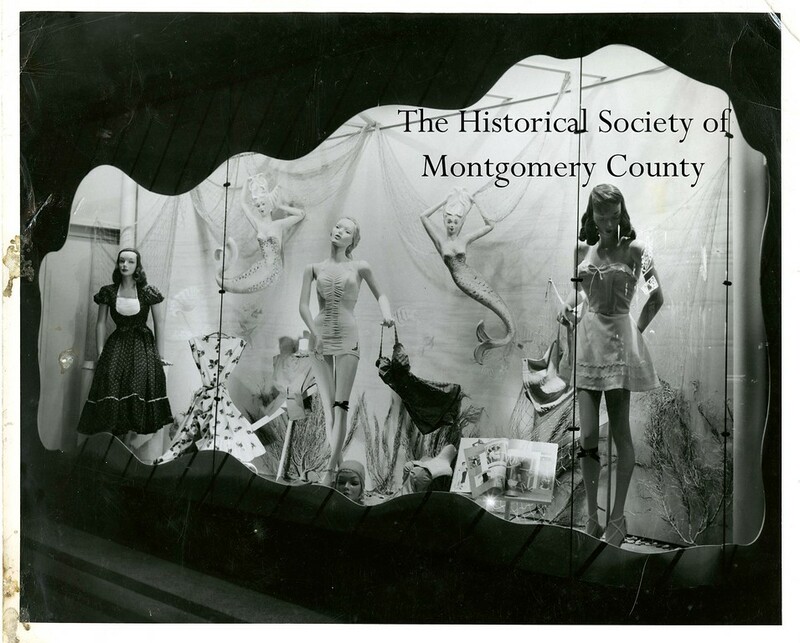 This photo from the Historical Society of Montgomery County shows the New York Store, which was a department store in Norristown. This interior photo was taken in the 1940’s during the Christmas season. 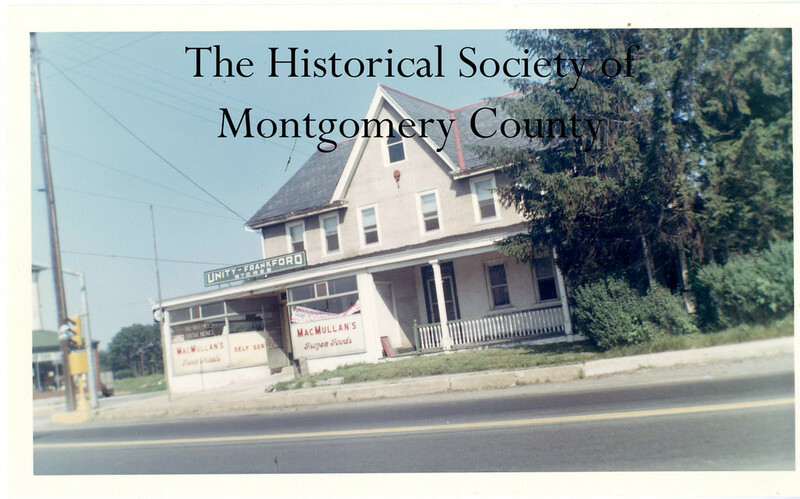 This photo from the Historical Society of Montgomery County shows MacMullan's Store and Hotel in Whitpain in 1968. 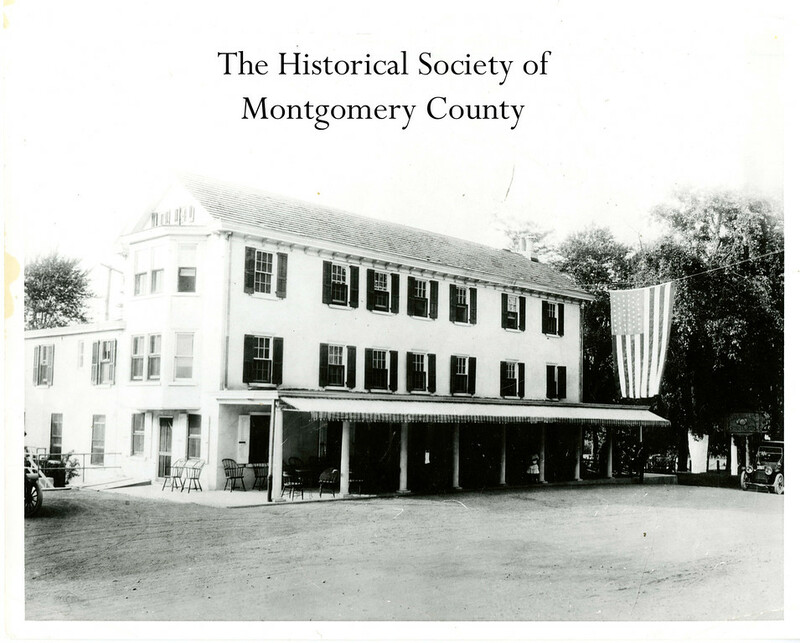 This undated photo from the Historical Society of Montgomery County shows the Waggon Inn in Whitpain at Rt. 202 and Rt. 73. It was founded in 1758 and is now Reed's Country Store. 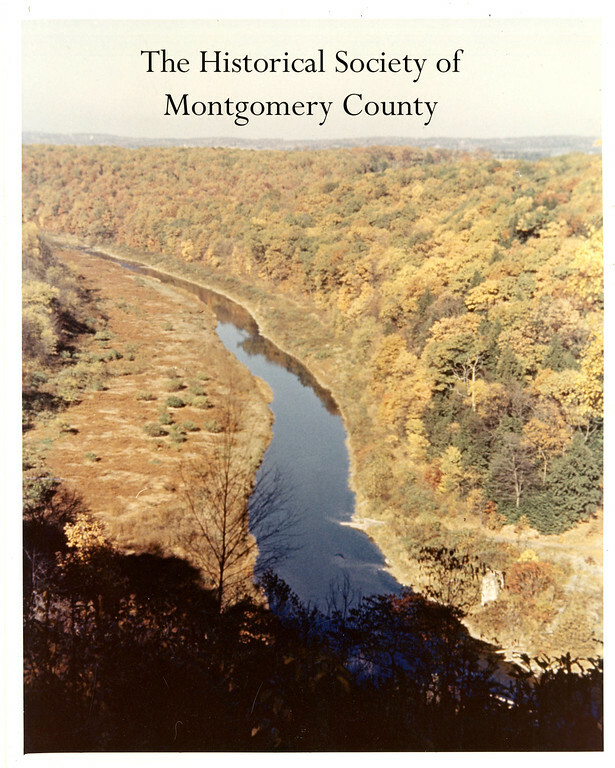 This undated photo from the Historical Society of Montgomery County shows the Schuylkill Canal in Bridgeport. 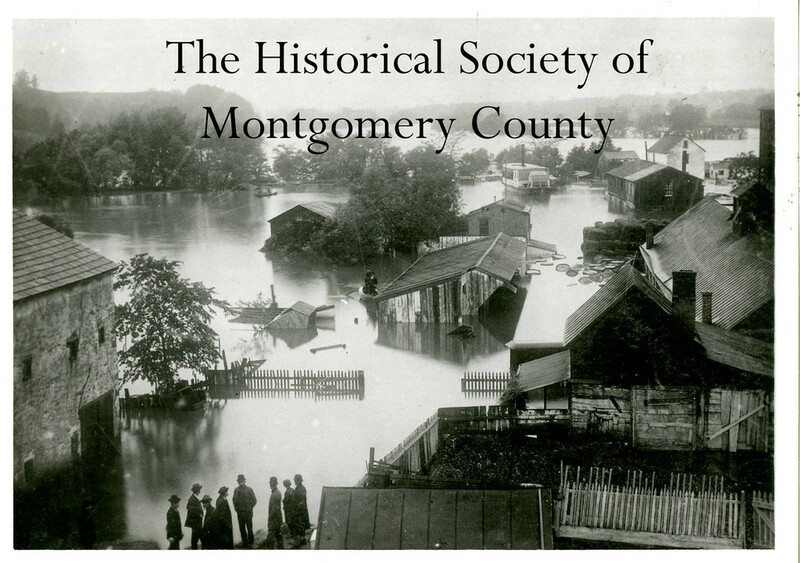 This photo from the Historical Society of Montgomery County shows a flood in Bridgeport in 1894. 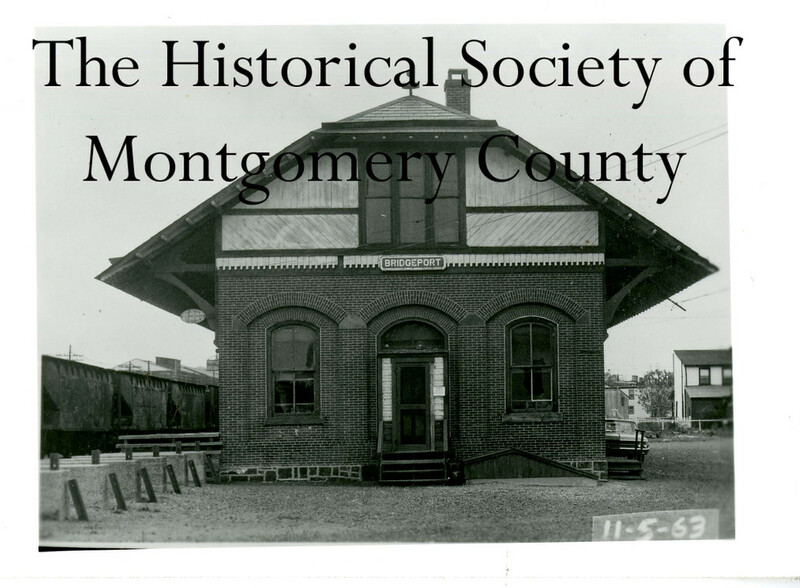 This photo from the Historical Society of Montgomery County shows the Bridgeport Train Station in 1963. 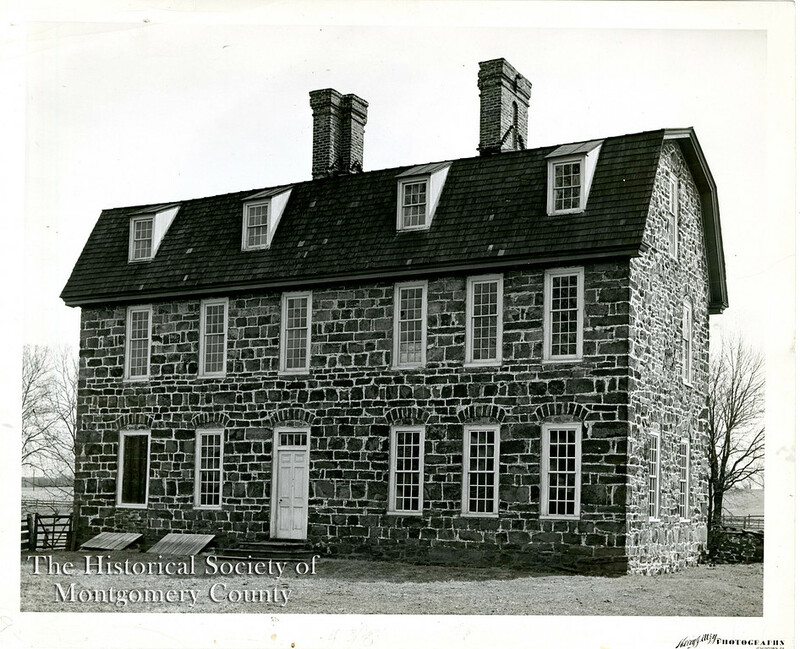 This undated photo from the Historical Society of Montgomery County shows the DeHaven House, which was located on Skippack Pike in Blue Bell. 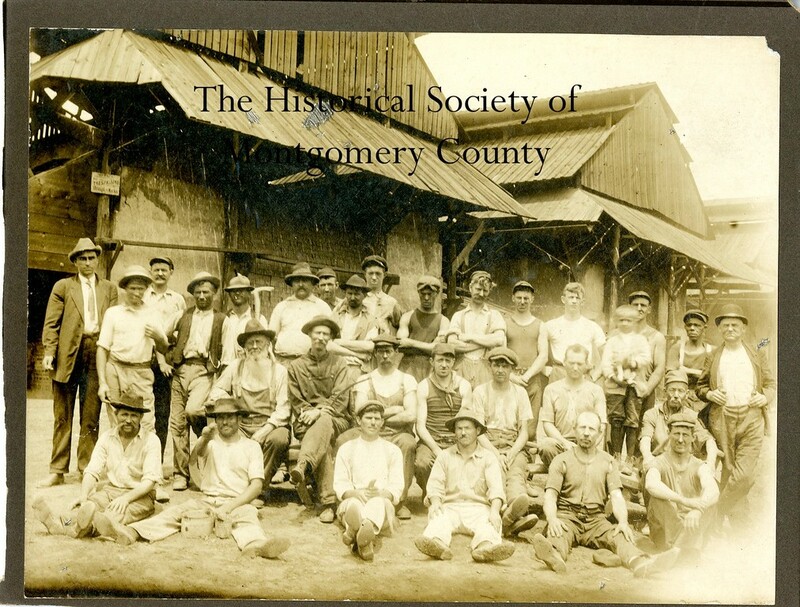 This photo from the Historical Society of Montgomery County shows Times Herald newsboys in 1922 at Normandy Farm. 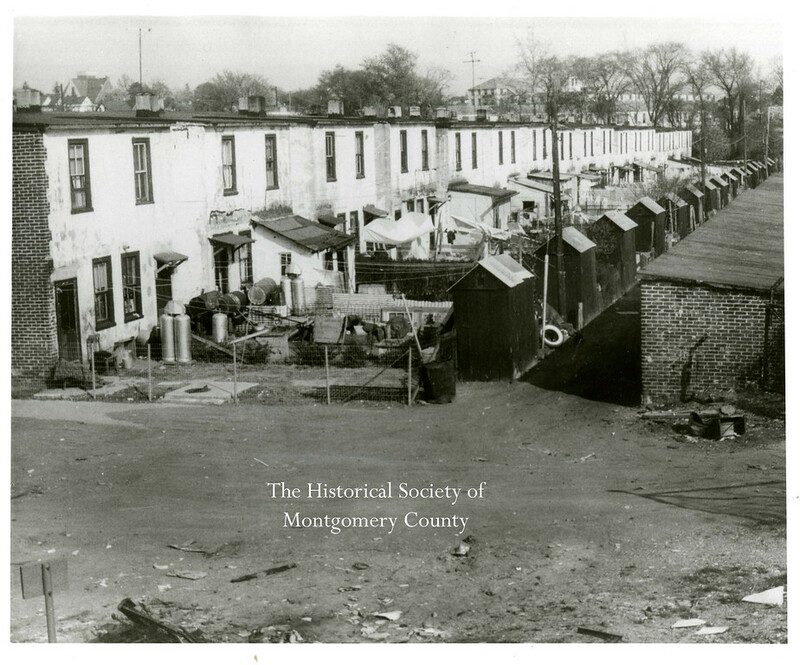 The photo from the Historical Society of Montgomery County shows "Gariabldi’s Row” in Ambler. The home were built by Keasby and Mattison Company for their employees. This picture was taken just before they were demolished in 1961. This photo from the Historical Society of Montgomery County shows children at a dump site in Ambler, c. 1961. 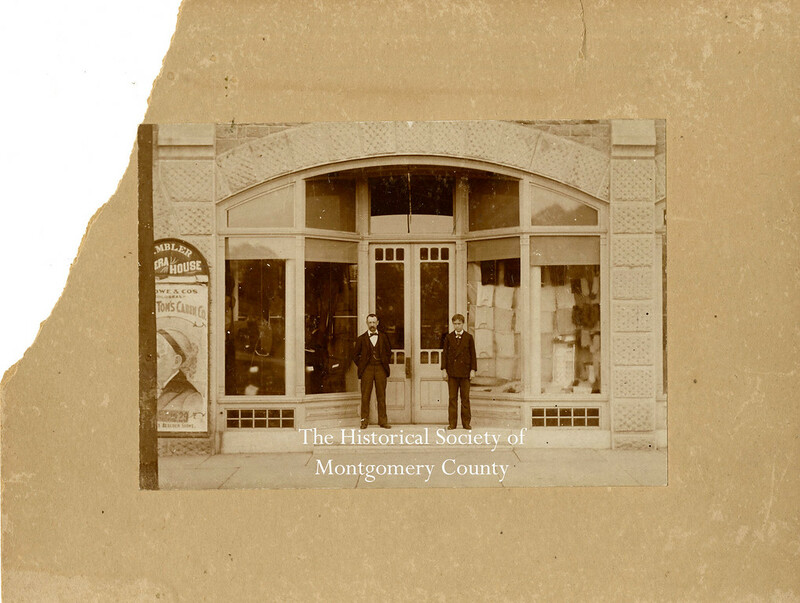 This undated photo from the Historical Society of Montgomery County shows the front entrance to the Ambler Opera House, which stood on Butler Avenue in Ambler. 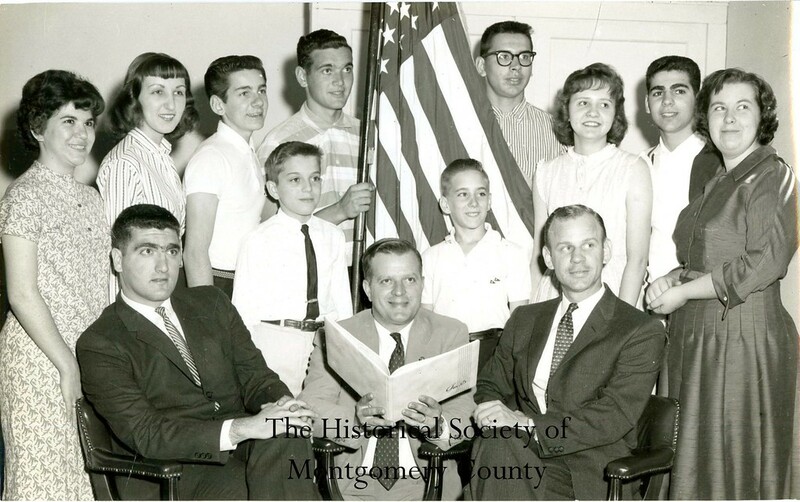 This photo from the Historical Society of Montgomery County was taken at Norristown High School in the early 1960s. 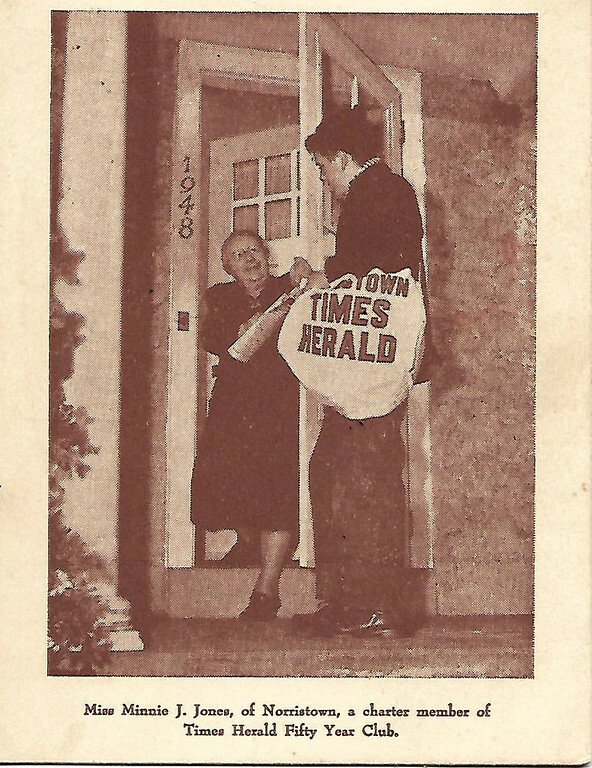 This undated file photo shows Minny J. Jones of Norristown — a charter member of The Times Herald Fifty Year Club — receiving a copy of The Times Herald. 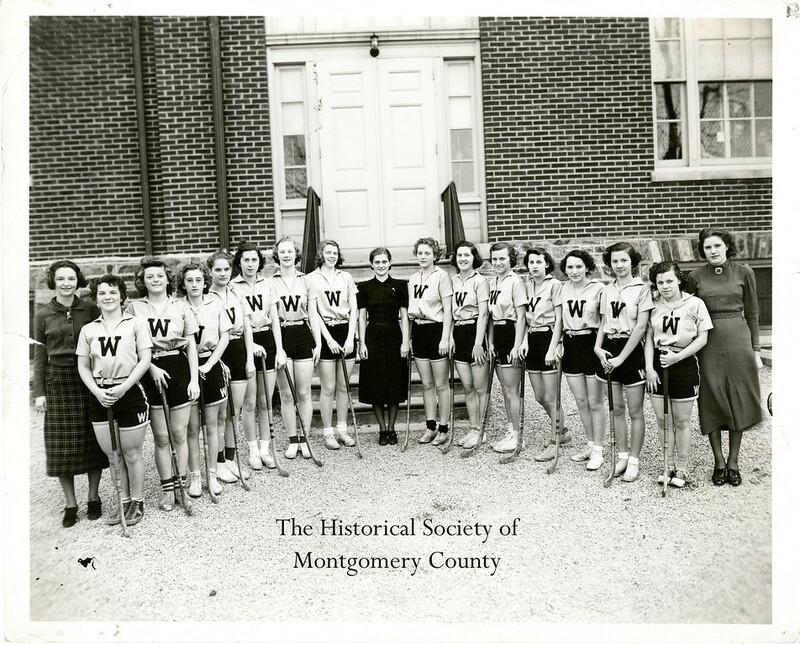 This photo from the Historical Society of Montgomery County shows the "W" field hockey team, c. 1950. 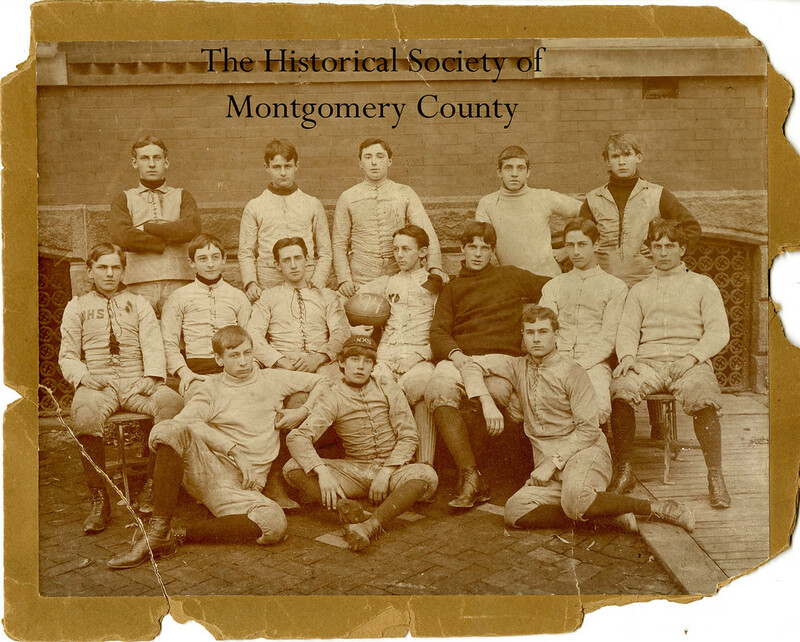 This photo from the Historical Society of Montgomery County shows Norristown High School's 1894 football team. 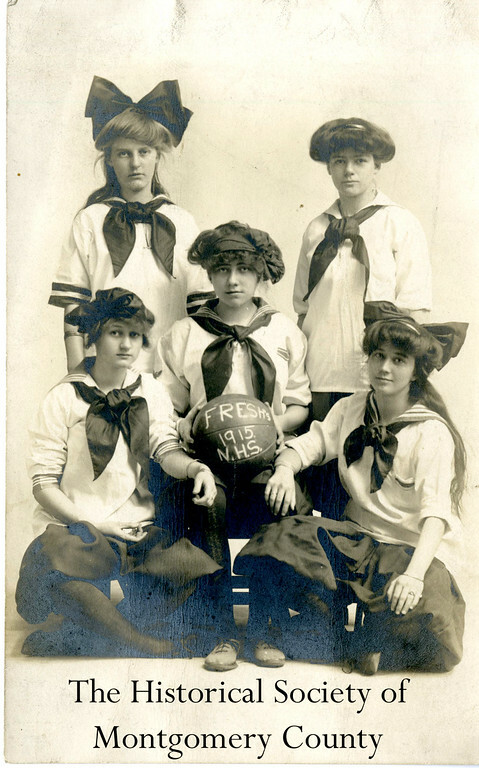 This photo from the Historical Society of Montgomery County shows Norristown High School's girls' basketball team in 1915. 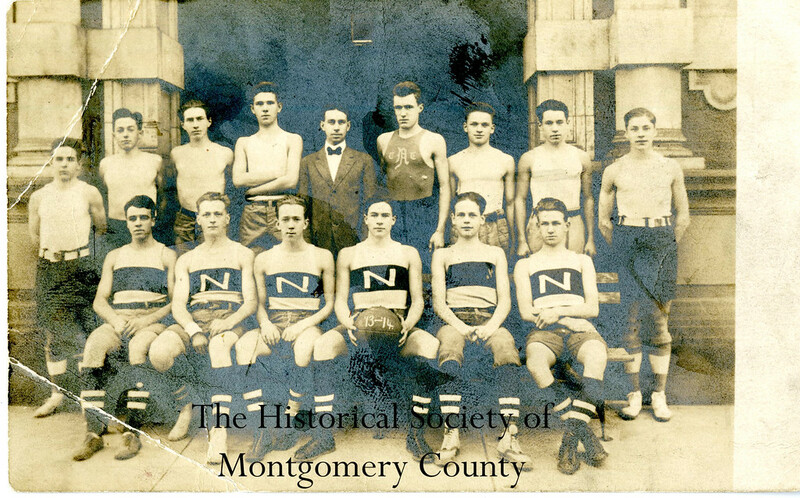 This photo from the Historical Society of Montgomery County shows Norristown High School's basketball team in 1913. 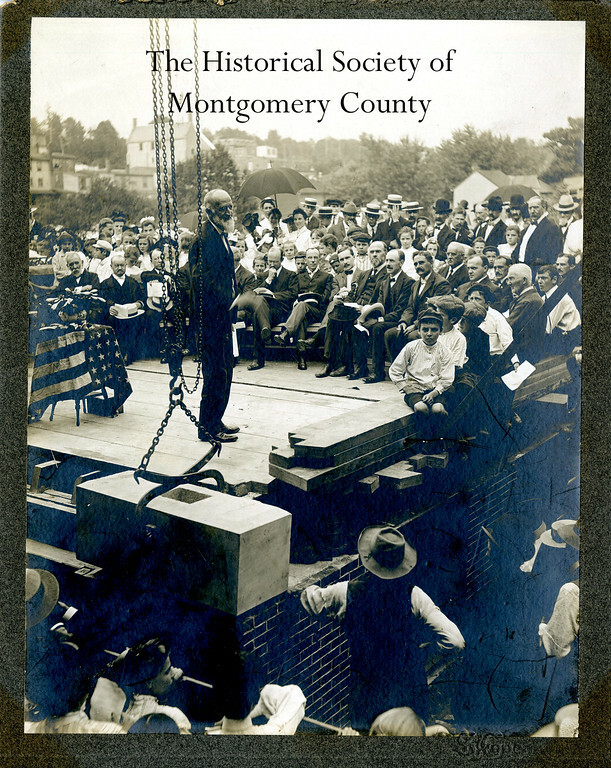 This photo from the Historical Society of Montgomery County shows James A. Welsh at the cornerstone laying of the James A. Welsh School in Norristown in 1904. 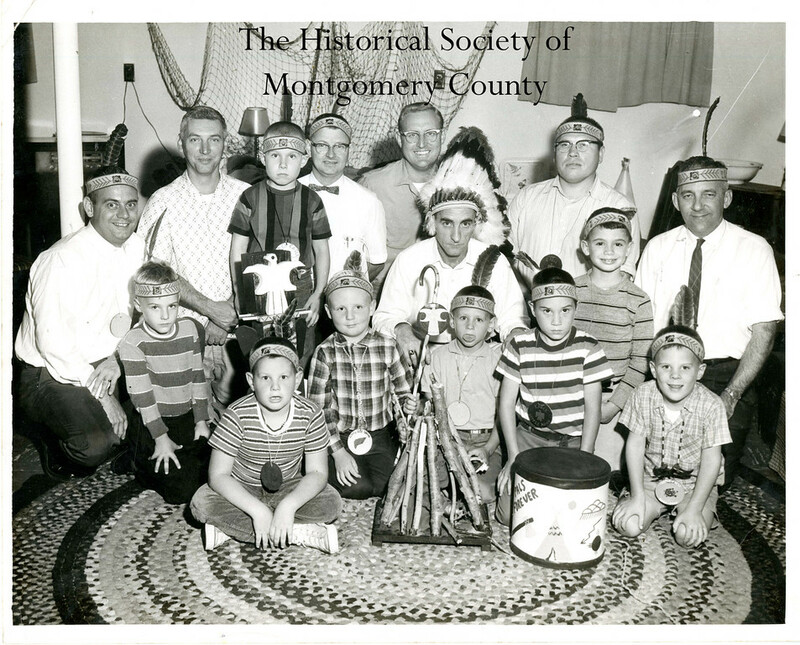 This photo from the Historical Society of Montgomery County shows the Indian Guides, a father-son group that met at the YMCA in Norristown. The picture is circa 1960. 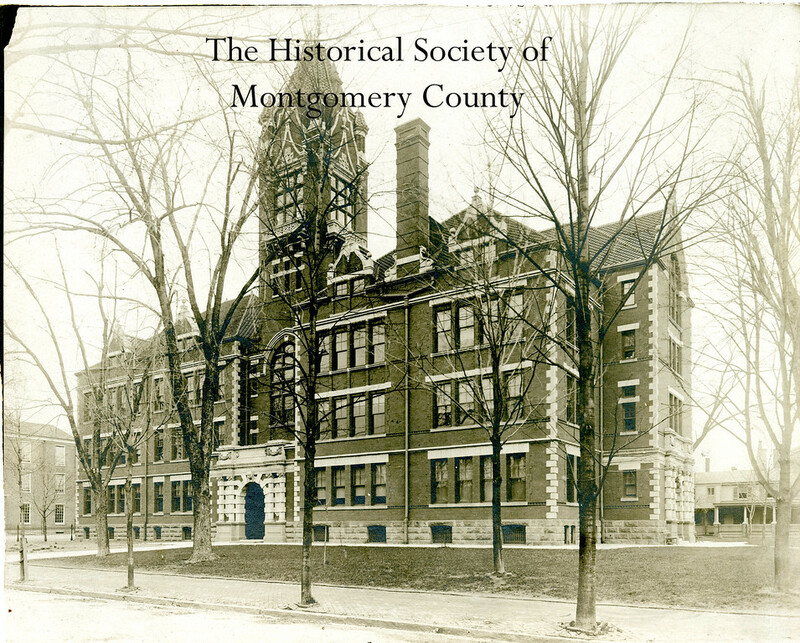 This undated photo from the Historical Society of Montgomery County shows the old Norristown High School building. 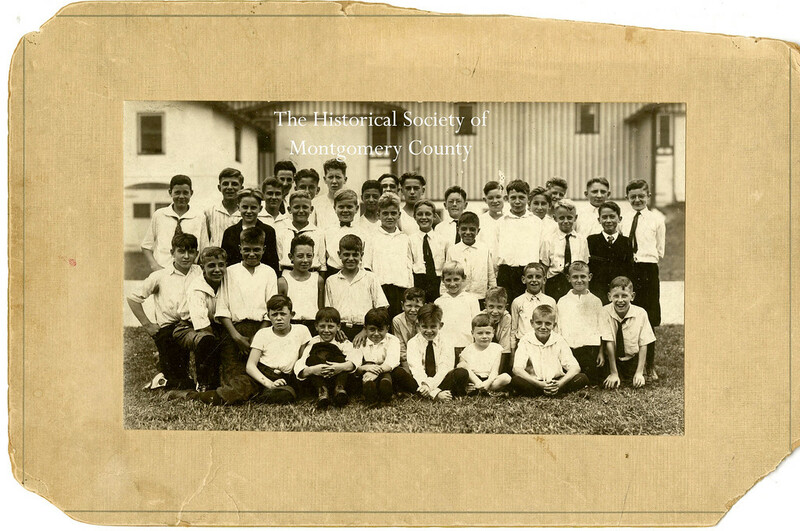 This photo from the Historical Society of Montgomery County is a class picture from the mid-20th century at Lincoln Elementary on Noble Street in Norristown. 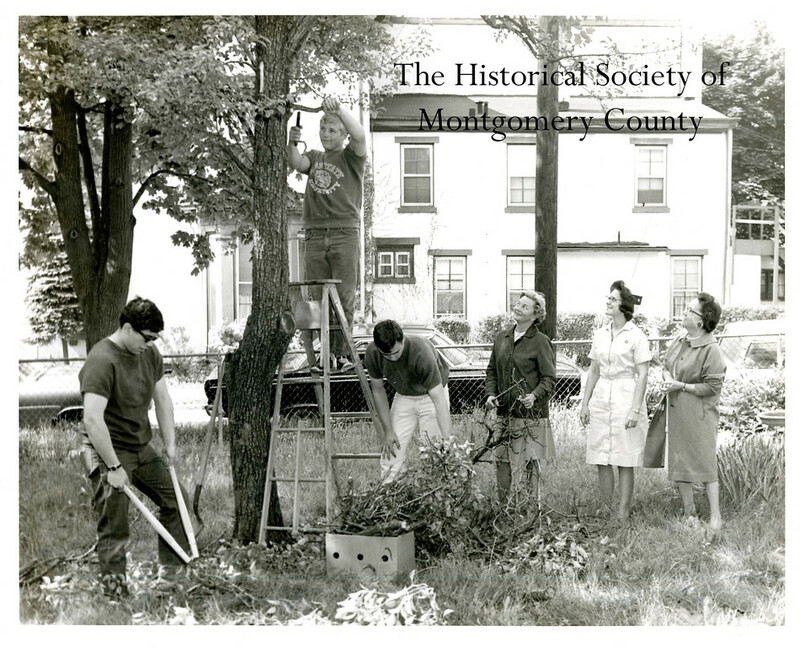 This photo from the Historical Society of Montgomery County shows members of the Norristown Garden Club and students from Norristown Area High School working on a beautification project in 1968. 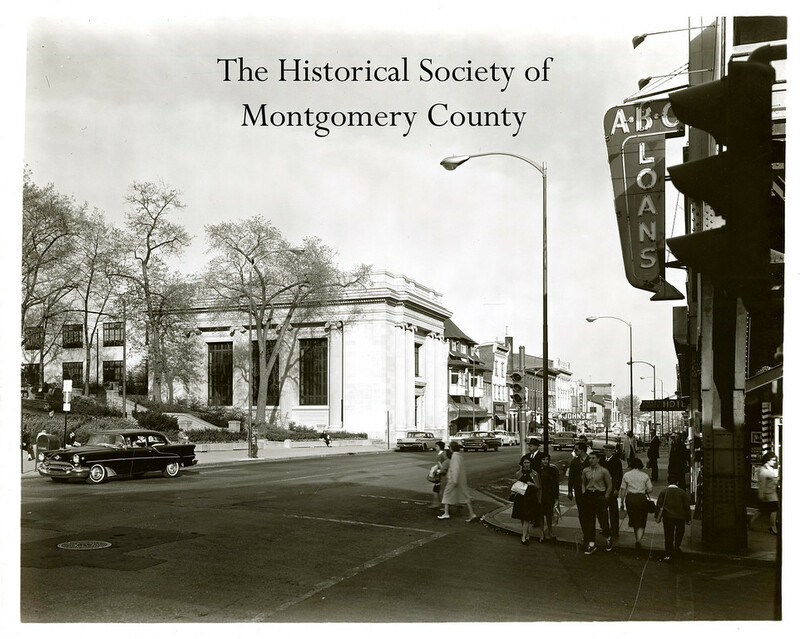 This photo from the Historical Society of Montgomery County show the Masonic Temple in Norristown, c. 1970. 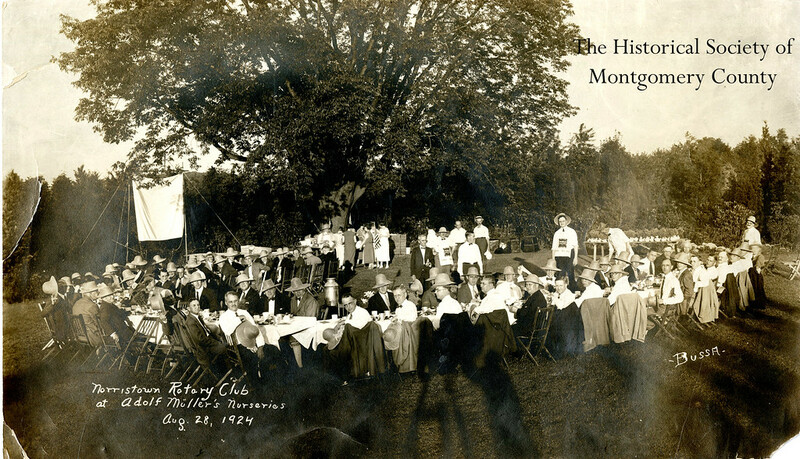 This photo from the Historical Society of Montgomery County shows a gathering of the Norristown Rotary Club in 1924. 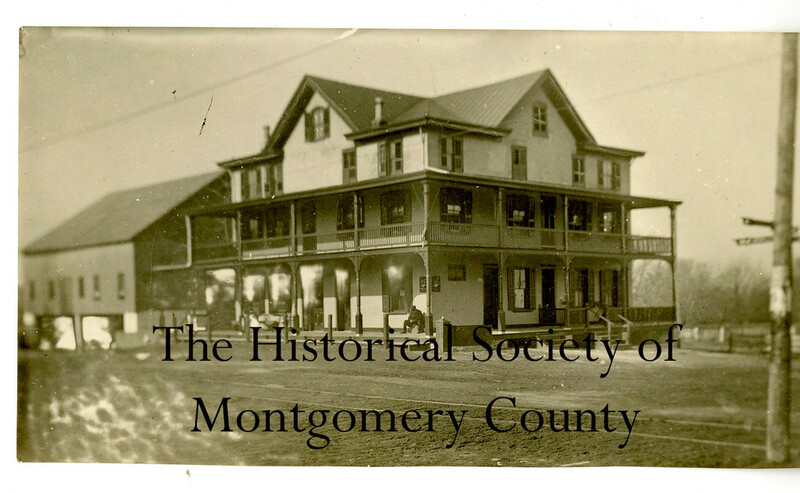 This photo from the Historical Society of Montgomery County shows the Three Tuns Inn in Lafayette Hill circa the 1920’s. 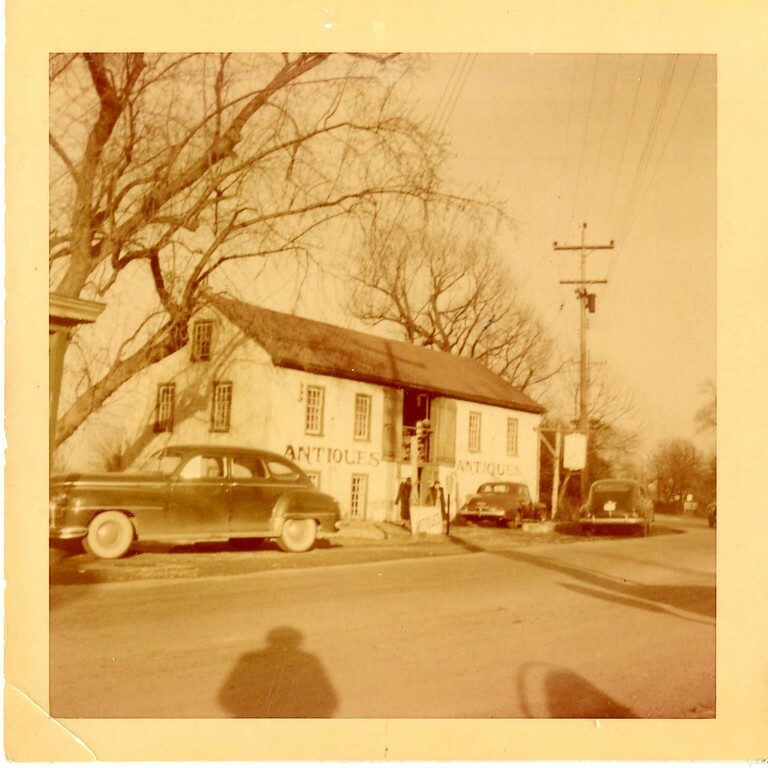 It was the General Lafayette Inn for a long time and later became the Barren Hill Brewery and Restaurant. This photo from the Historical Society of Montgomery County shows the interior of the Rambo House on Swede Street in Norristown, opposite the courthouse, in the 1950s. 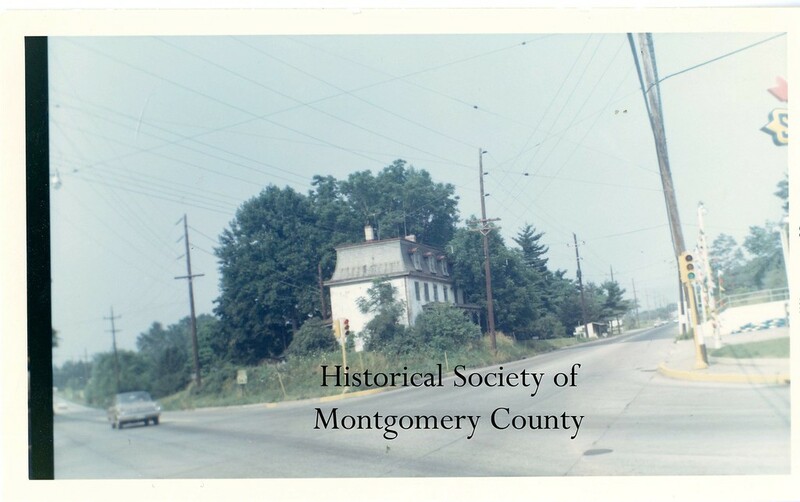 This photo from the Historical Society of Montgomery County shows the Rambo House on Swede Street in Norristown, opposite the courthouse, in the 1950s. 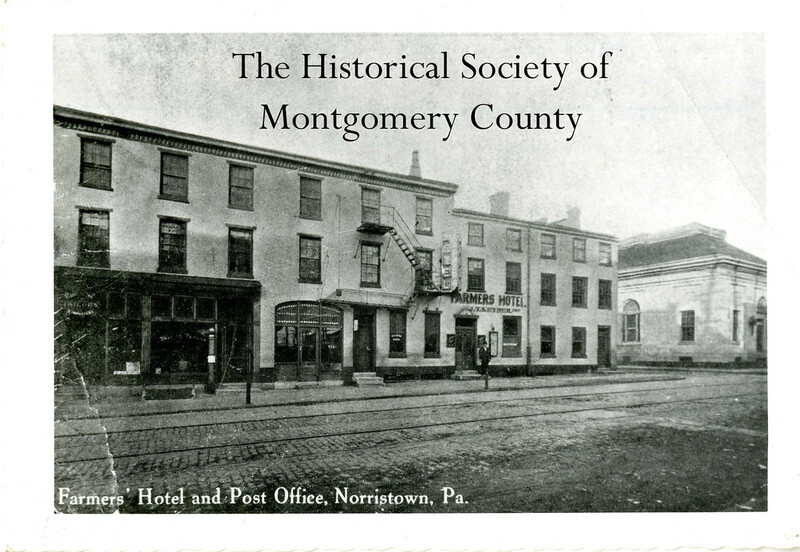 This photo from the Historical Society of Montgomery County shows the Windsor Hotel in Norristown in the late 19th century. 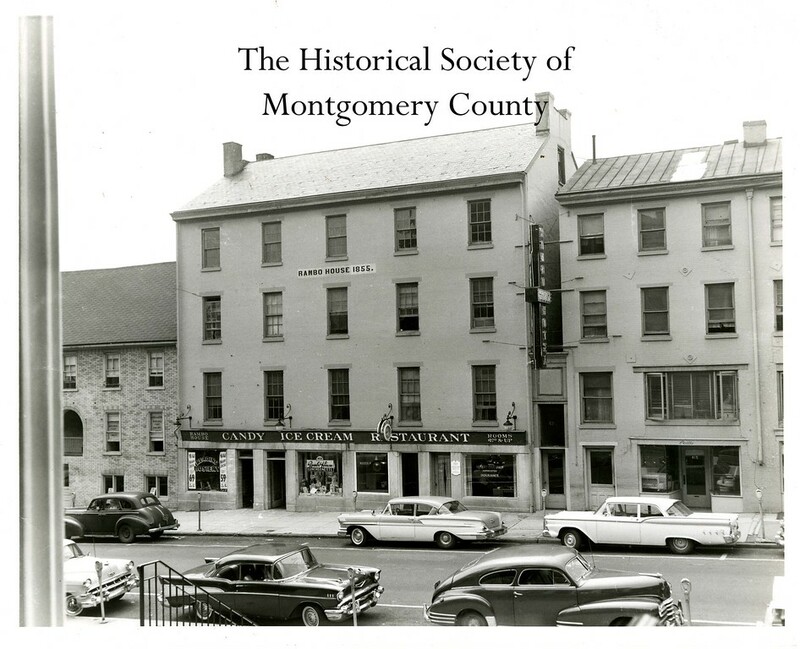 This photo from the Historical Society of Montgomery County shows the Hamilton Hotel at Main and Hamilton streets in Norristown, c. 1960. This photo from the Historical Society of Montgomery County shows the demolition of the Valley Forge Hotel in Norristown in October 1974. 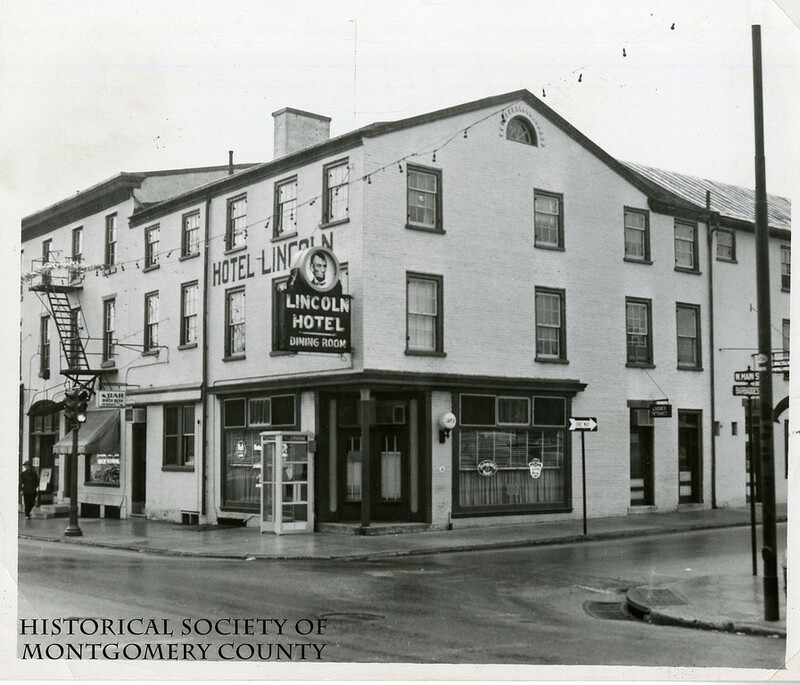 This undated photo from the Historical Society of Montgomery County shows the Farmers' Hotel on East Main Street in Norristown. 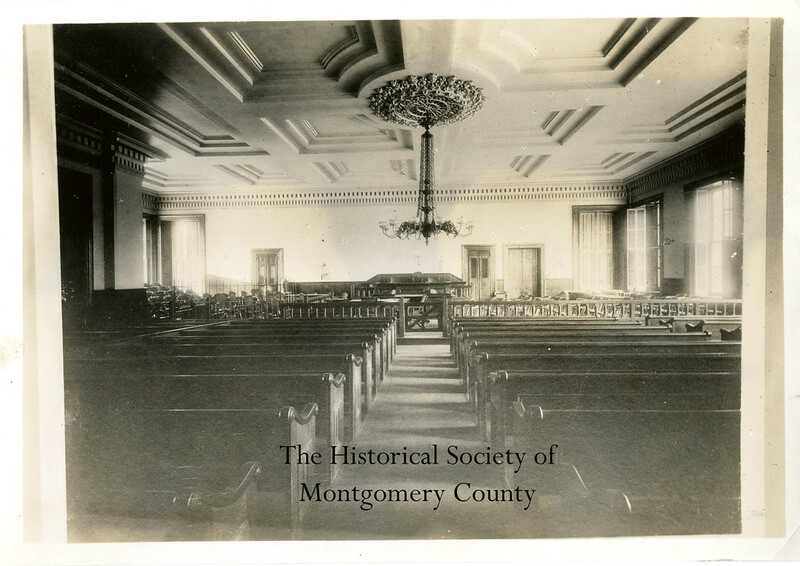 This photo from the Historical Society of Montgomery County shows an interior view of the Montgomery County Courthouse during the 19th century. 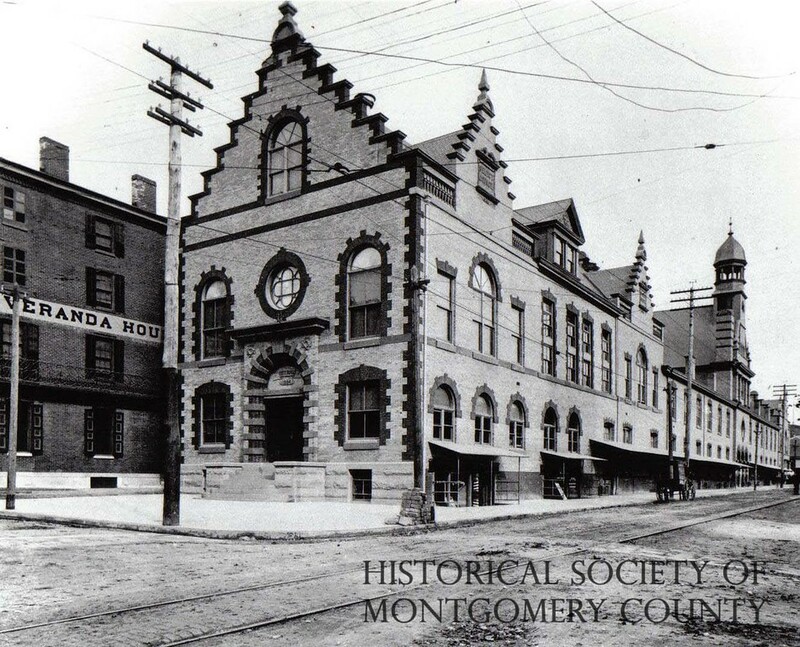 This photo from the Historical Society of Montgomery County shows the old borough hall in Norristown sometime between 1900 and 1910. Standing in front of the building are police officers. 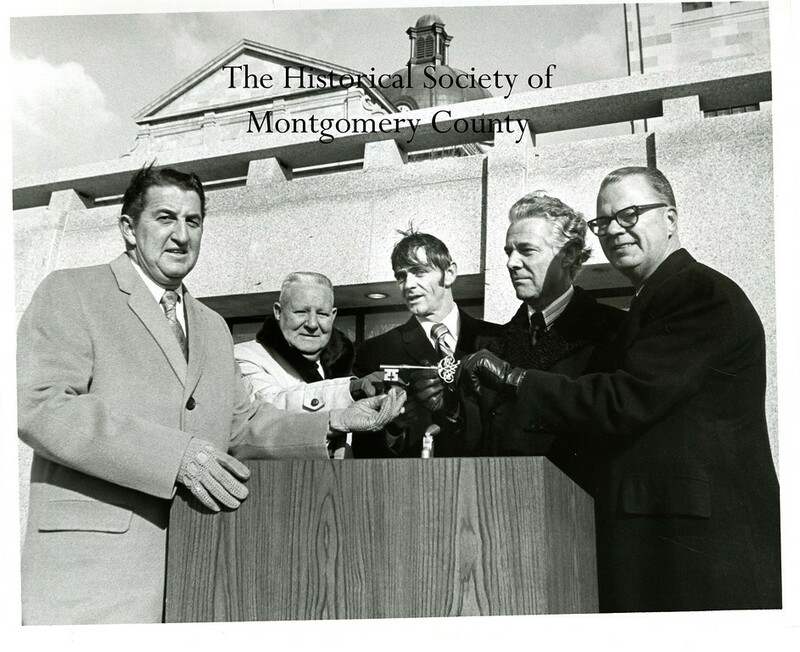 This photo from the Historical Society of Montgomery County shows the dedication of the Montgomery County Courthouse in 1971. Pictured from left is County Commissioners Frank W. Jenkins, David T. Costello, President of Van Cor James W. Hughes Jr., Vincent G. Kling (from the architectural firm that designed the annex) and Commissioners' Chairman A. Russell Parkhouse. 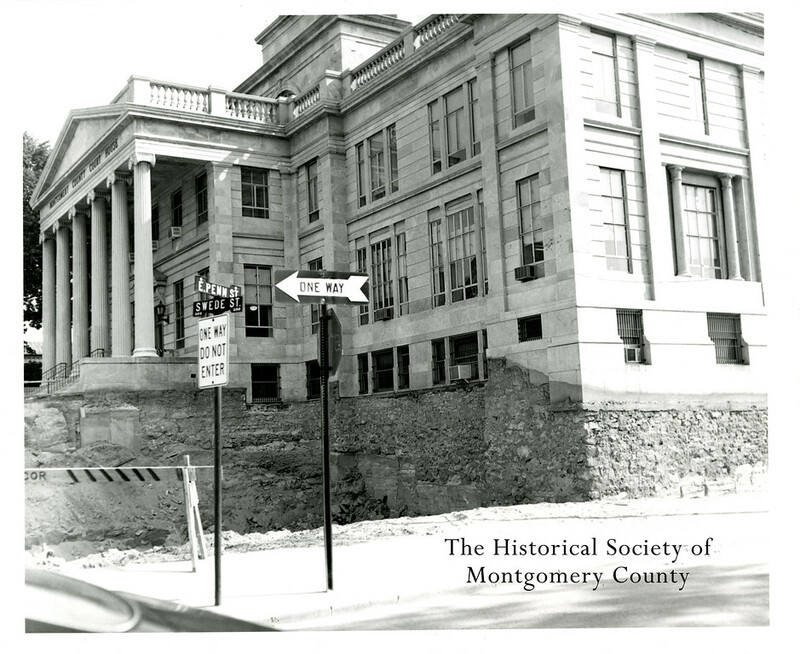 This photo from the Historical Society of Montgomery County shows the construction of the Montgomery County Courthouse annex around 1968. 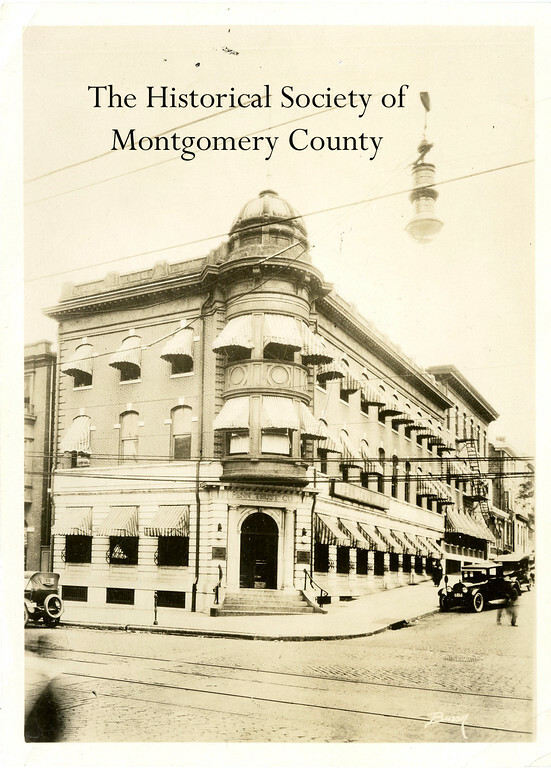 This undated photo from the Historical Society of Montgomery County shows the Penn Trust Company building in Norristown. 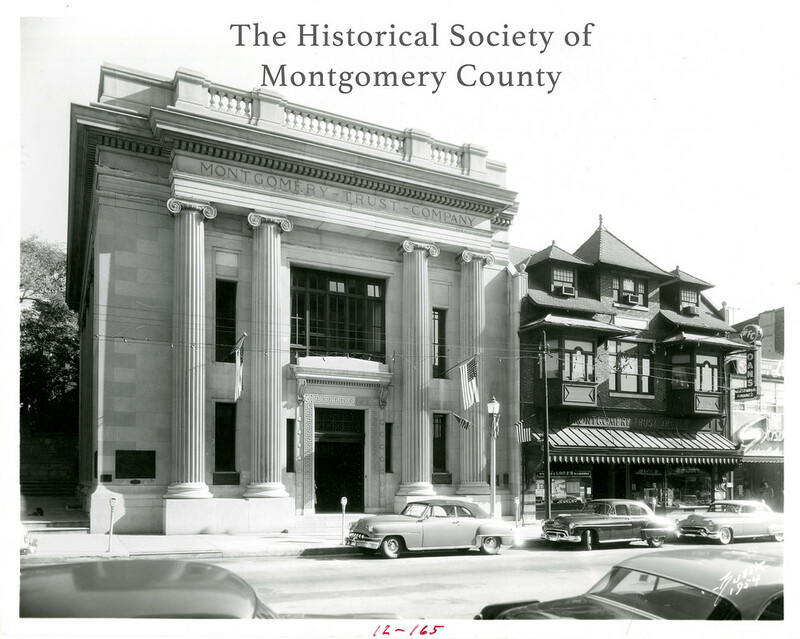 This photo from the Historical Society of Montgomery County shows Montgomery Trust in the early 1960s. The Historical Society believes it was located on Swede Street. 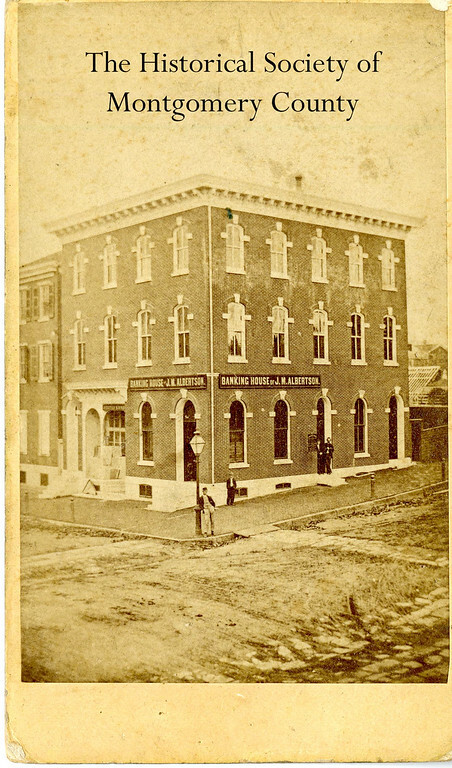 This 19th century photograph from the Historical Society of Montgomery County shows Albertson Trust and Savings Deposit Company, which was at the northwest corner of Main and Swede streets in Norristown. 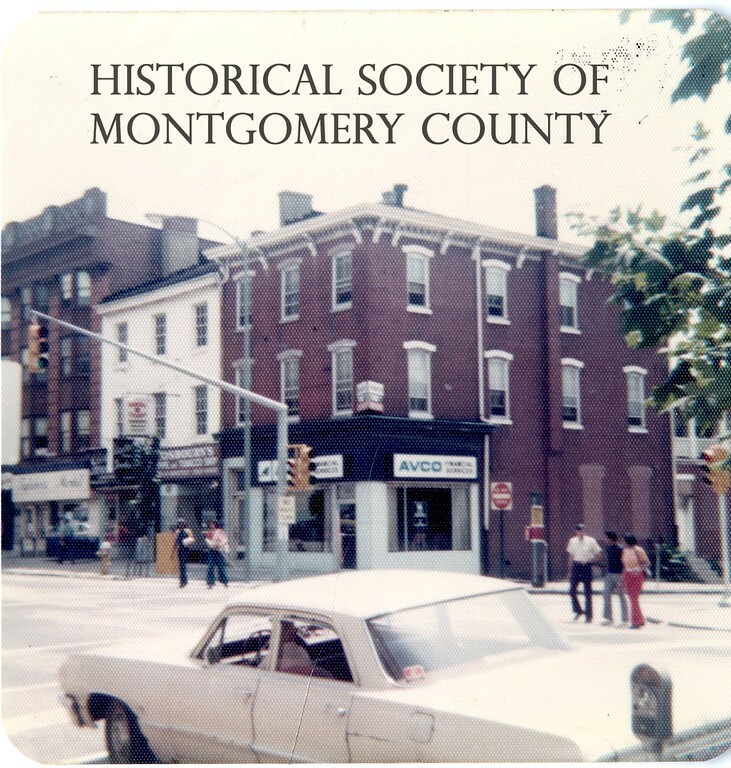 This photo from the Historical Society of Montgomery County shows Commonwealth Savings and Loan at Main and Cherry streets in Norristown in the 1960s. 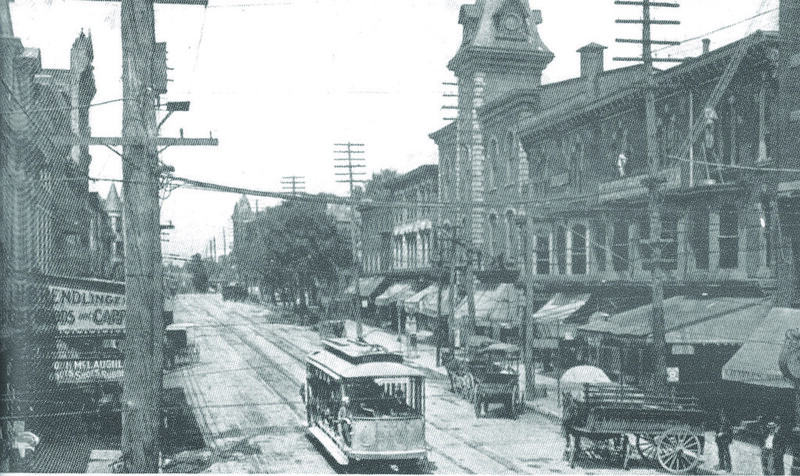 This undated Times Herald file photo shows Main Street in Norristown. 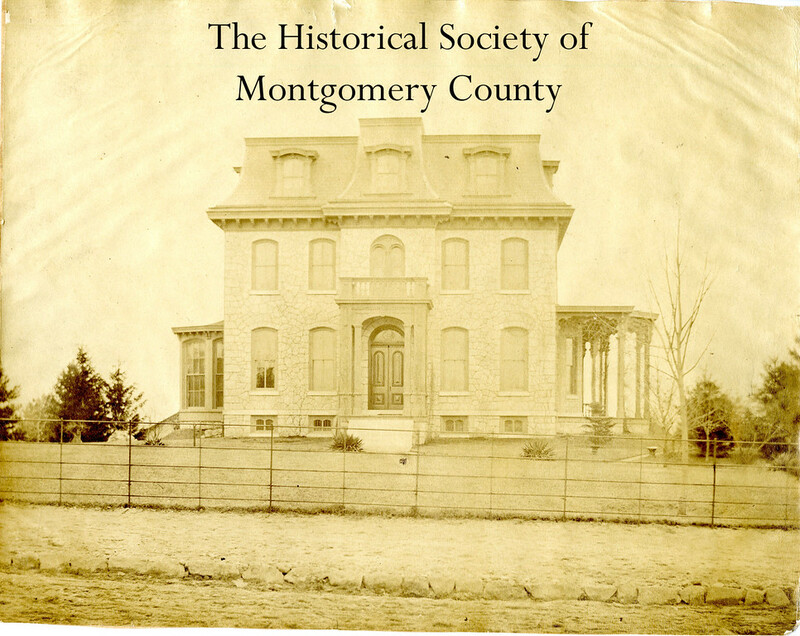 This undated photo from the Historical Society of Montgomery County shows Selma Mansion in Norristown. 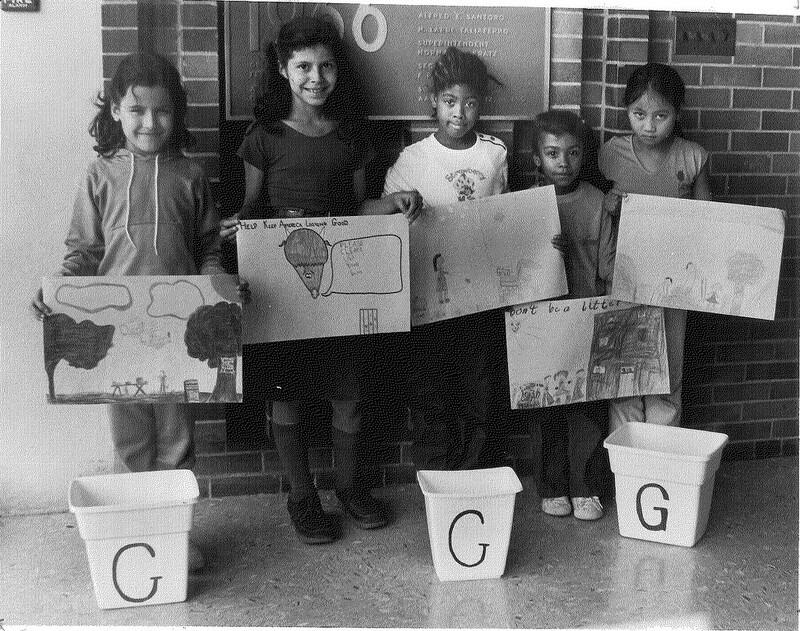 This Times Herald file photo from 1982 shows the winners of the fall clean-up poster contest at Gotwals School in Norristown. From left is Margaret Balcom, Emily Bauza, Stacy Brown, Adrienne Taylor and Panethong Salika. 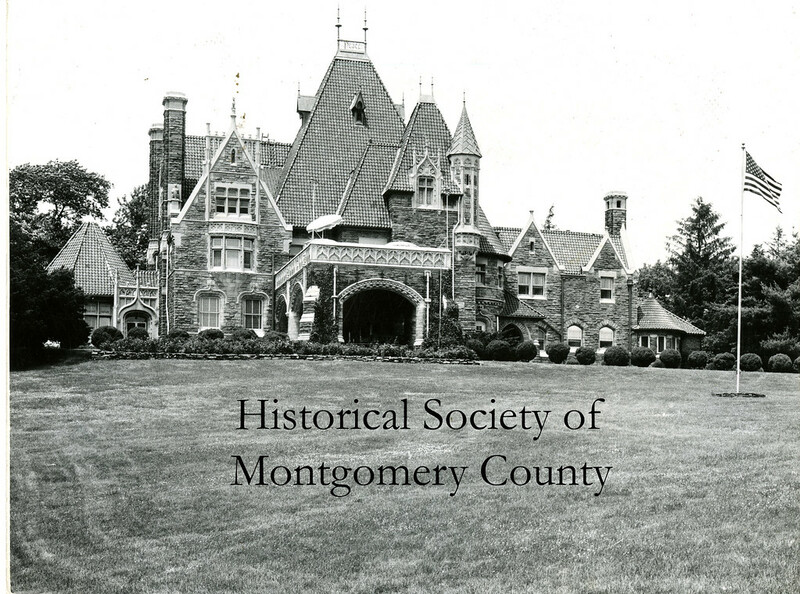 This undated photo from the Historical Society of Montgomery County shows Selma Mansion, the old Fornance mansion, in Norristown. 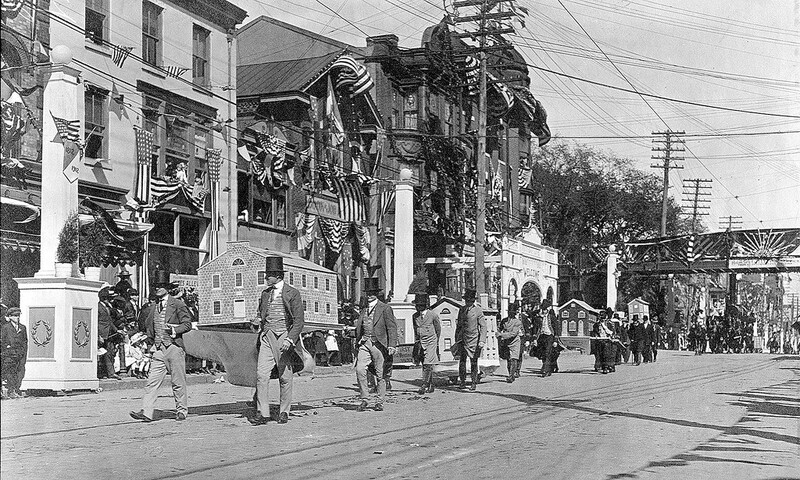 This Times Herald file photo shows a parade on Main Street in Norristown in 1912. The parade was held in celebration of the municipality's centennial. 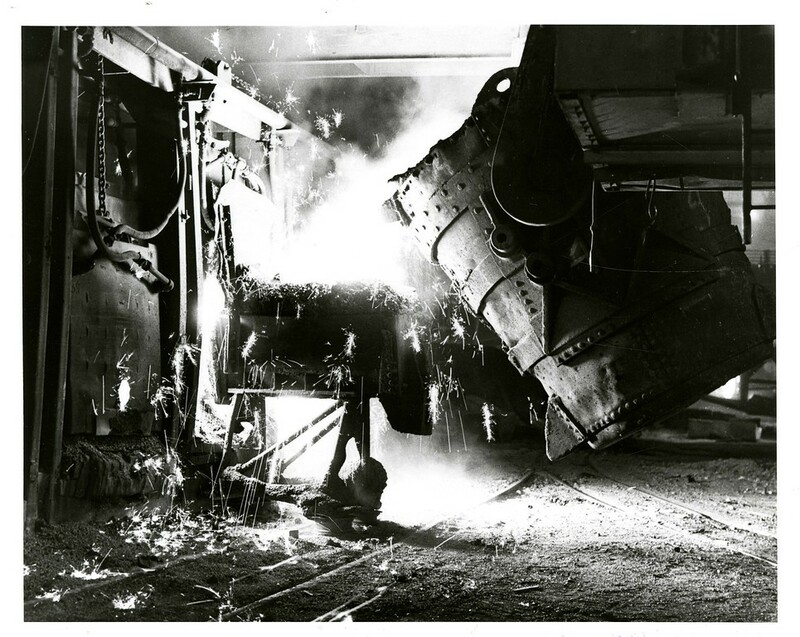 This undated photo from the Historical Society of Montgomery County shows the interior of Alan Wood Steel in Conshohocken. The photo was taken by an executive. 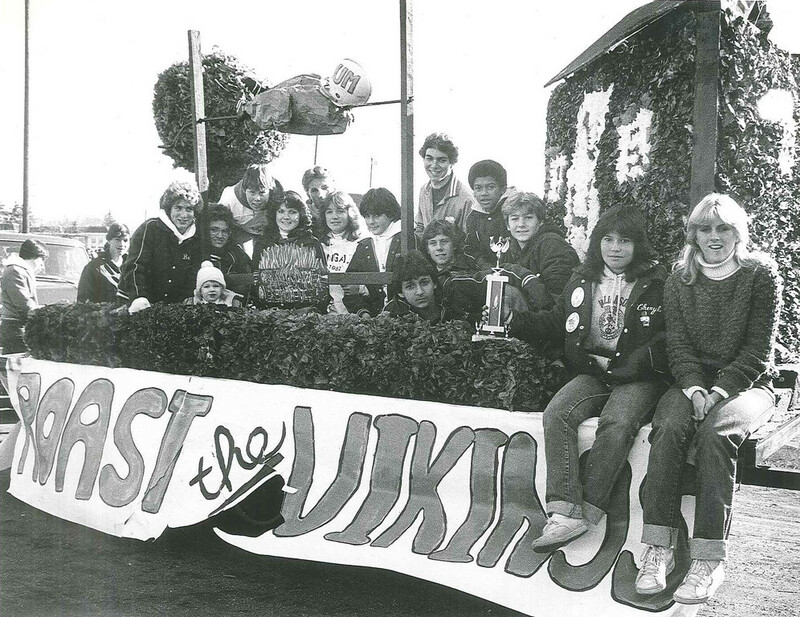 This Times Herald file photo shows a float in a parade in 1982 with a theme revolving around Norristown's Thanksgiving day game against Upper Merion. 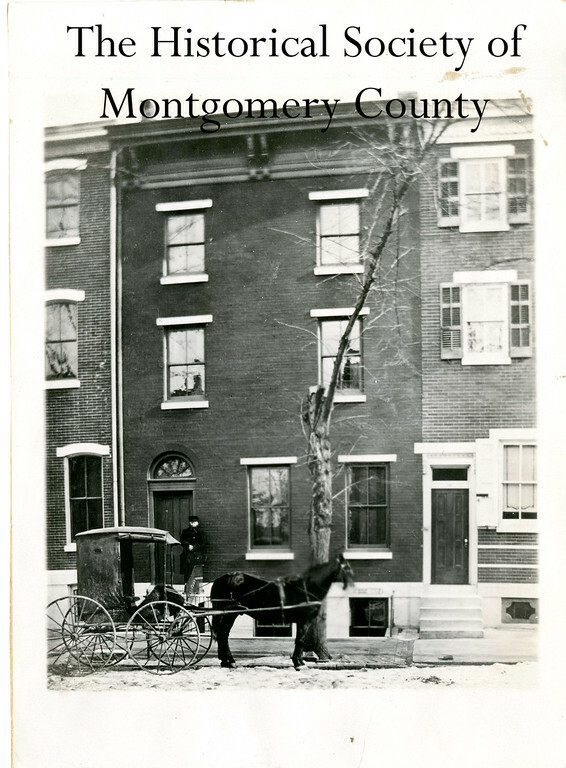 This photo from the Historical Society of Montgomery County shows the home of Edward Hocker, a carpenter. It stood at 345 East Main Street in Norristown. 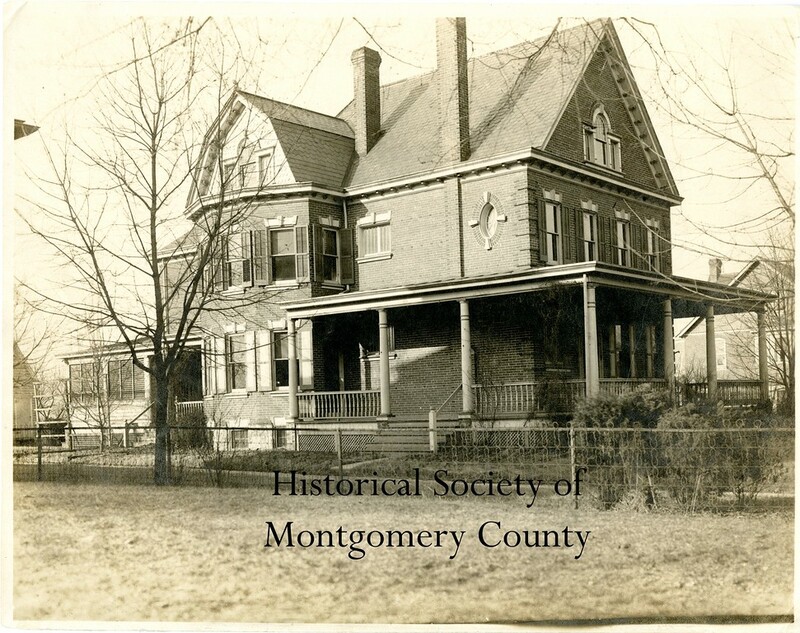 This photo from the Historical Society of Montgomery County shows the home of Dr. Jacob O. Knipe, at 528 Swede Street in Norristown. Dr. Knipe is the man pictured on the steps. 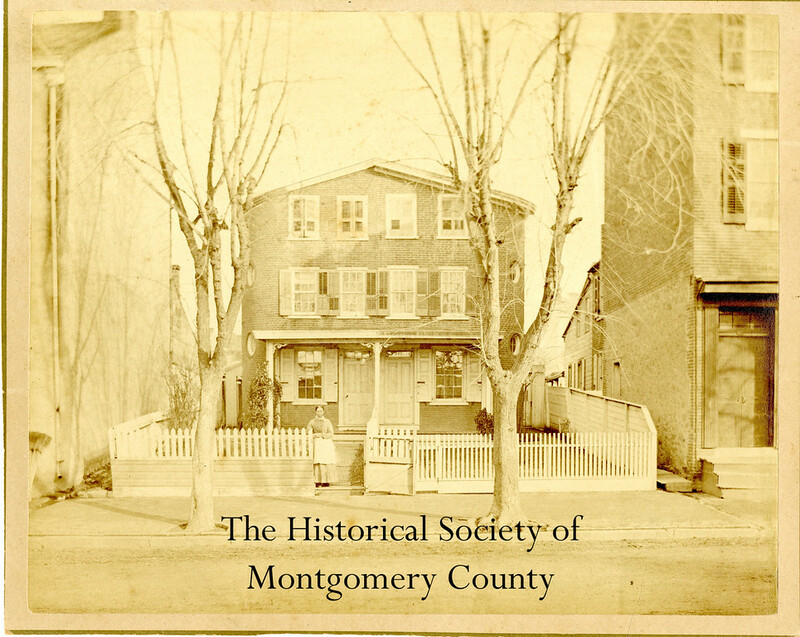 This undated photo from the Historical Society of Montgomery County shows the Samuel Jamison house on East Main Street in Norristown. 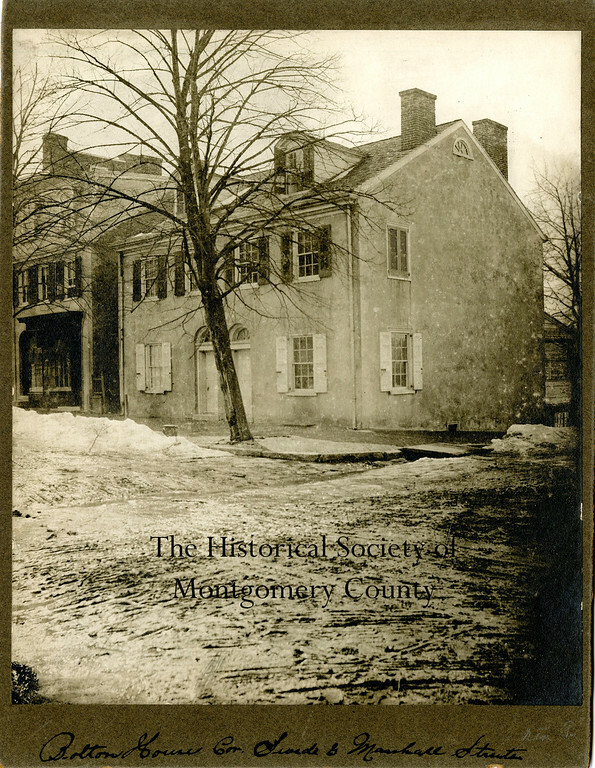 This undated photo from the Historical Society of Montgomery County shows the Bolton House which was located at the corner of Swede and Marshall streets in Norristown. 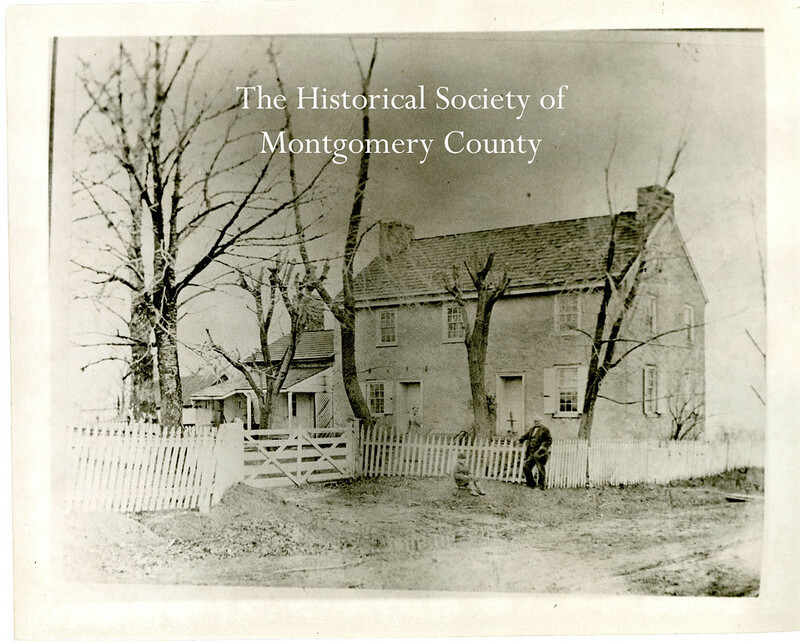 This photo from the Historical Society of Montgomery County shows the Boyer House in Norristown. 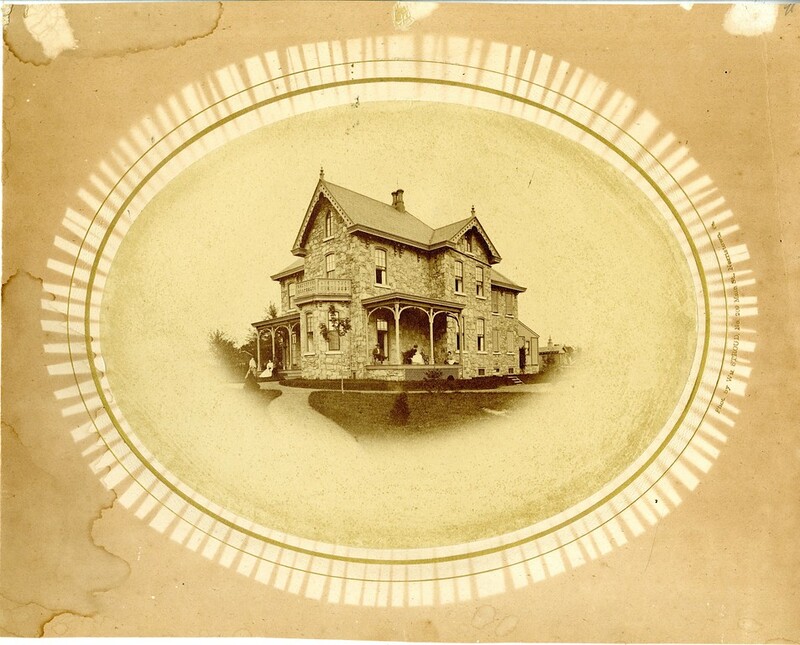 The date of the photo is unknown, but the house's location on Sandy Street later became Riverview Hospital. 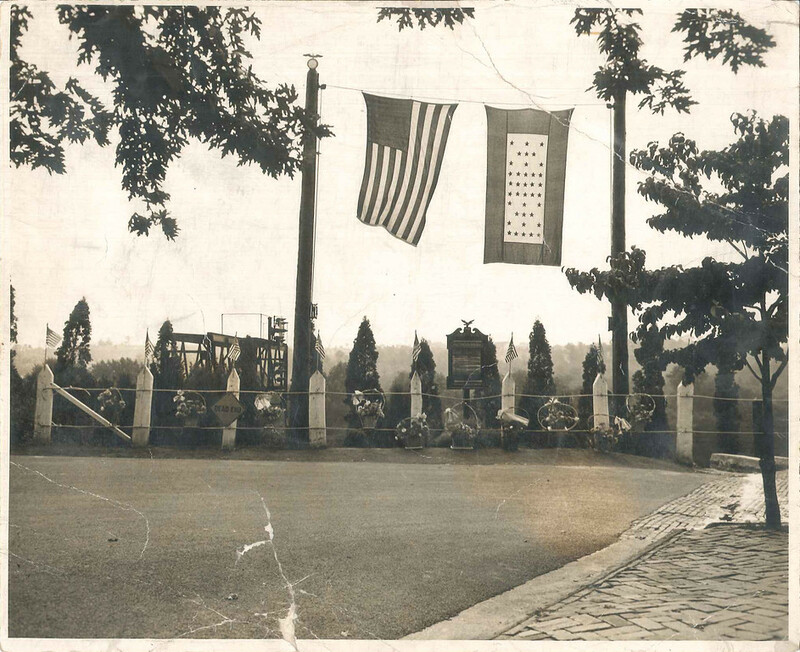 The Historical Society of Montgomery County says this photo is identified as Riverside Park. 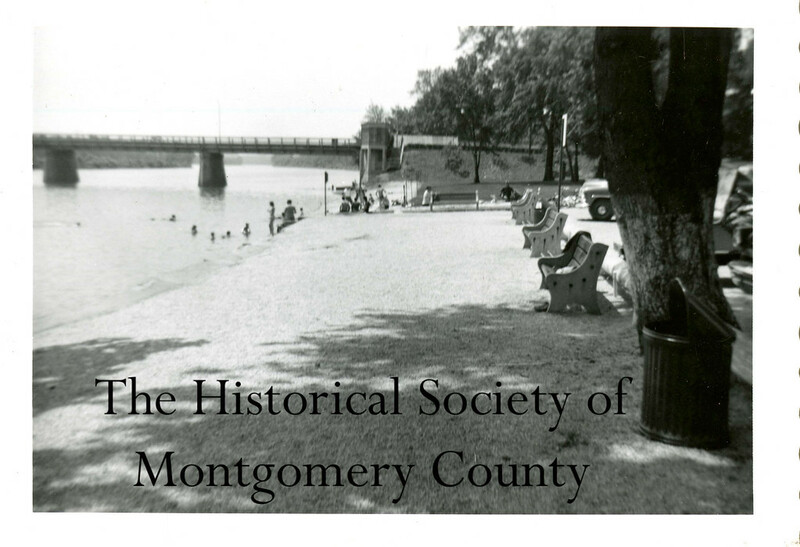 This photo from the Historical Society of Montgomery County shows Riverfront Park in Norristown in 1955. 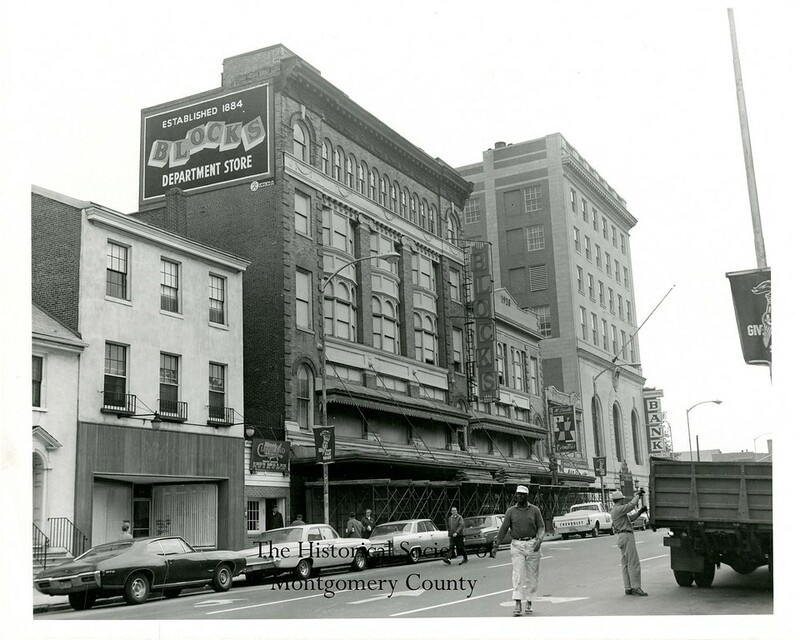 This photo from the Historical Society of Montgomery County shows the Wildman Building in Norristown as it was being taken down in 1968. To the left, the sign at the Norris Theater shows "The Dirty Dozen" was playing at the time. 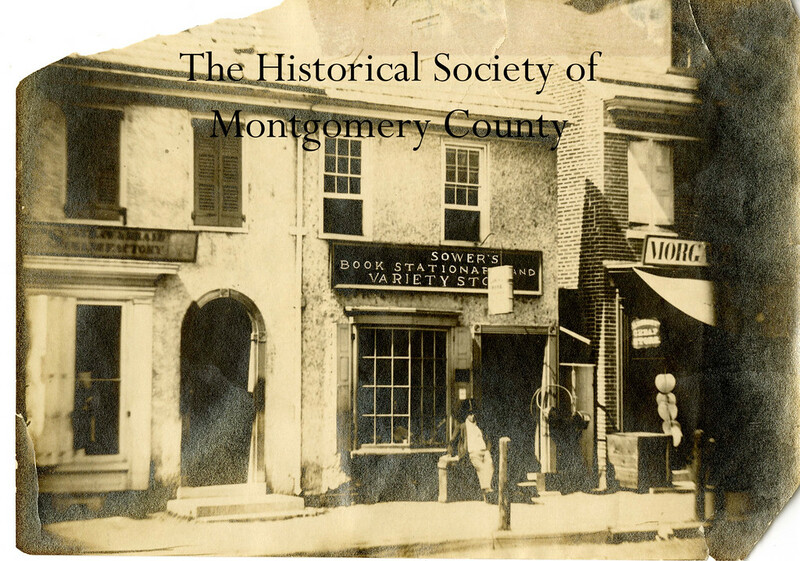 This photo from the Historical Society of Montgomery County shows Sower's Book Stationary and Variety Store in Norristown. 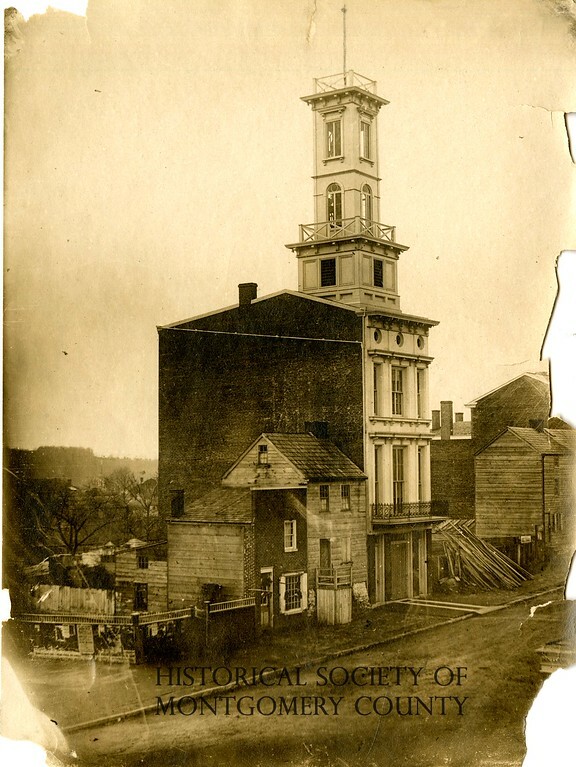 The Historical Society believes it was taken during the Civil War era. 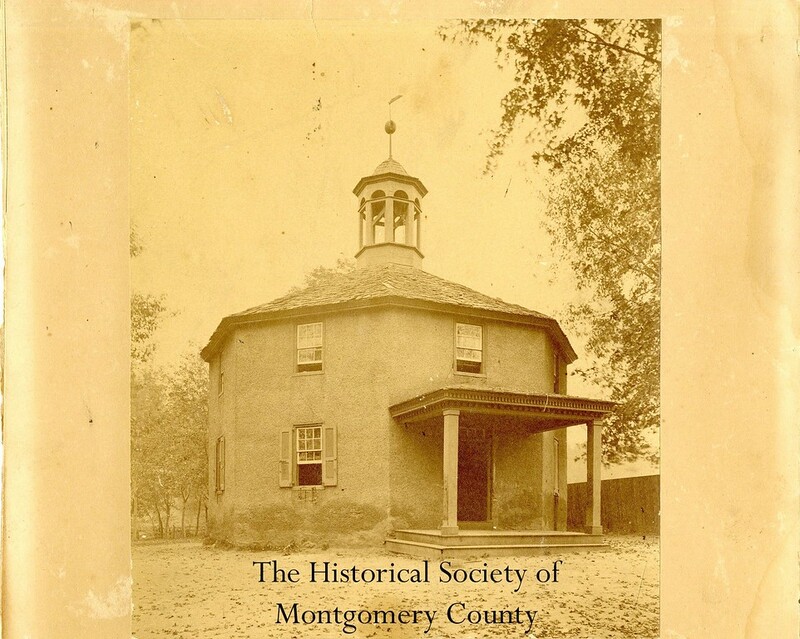 The Sower's were printers in Germantown and Norristown and they printed some of the earliest Norristown books and were early printers of the Norristown Herald. 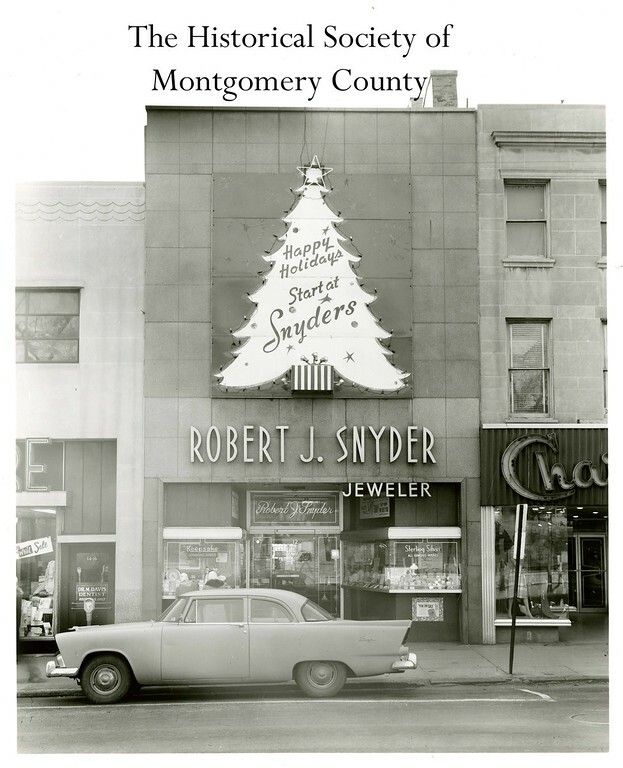 This photo from the Historical Society of Montgomery County shows Snyder's jewelry store in Norristown around the holidays in the 1950s. 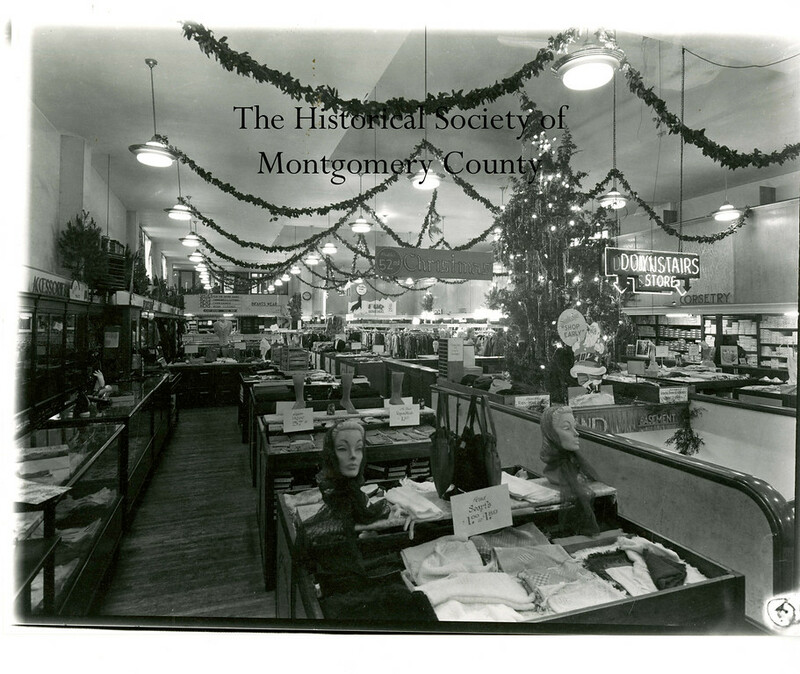 This photo from the Historical Society of Montgomery County shows the interior of Snyder's jewelry store in Norristown around the holidays in the 1950s. 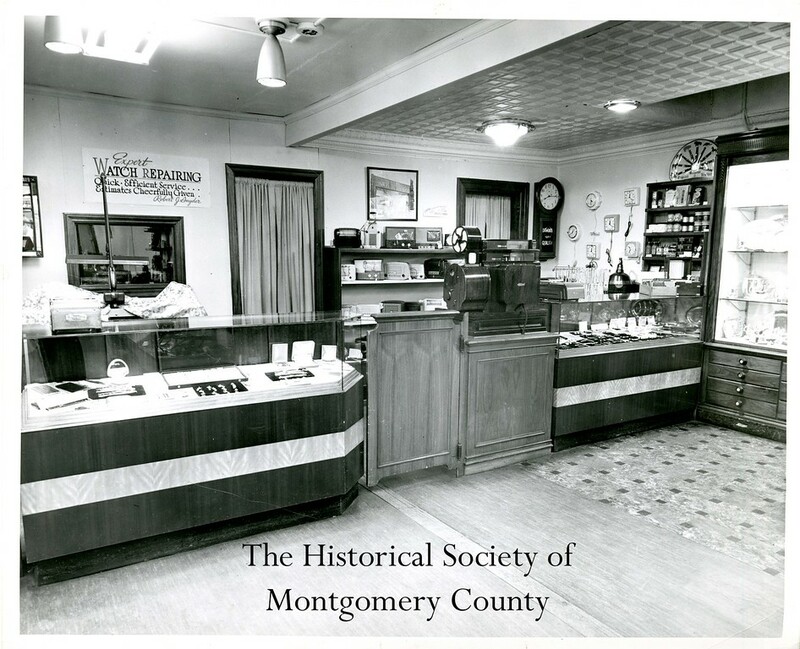 This photo from the Historical Society of Montgomery County shows Novelle's store in Norristown circa the 1950s. 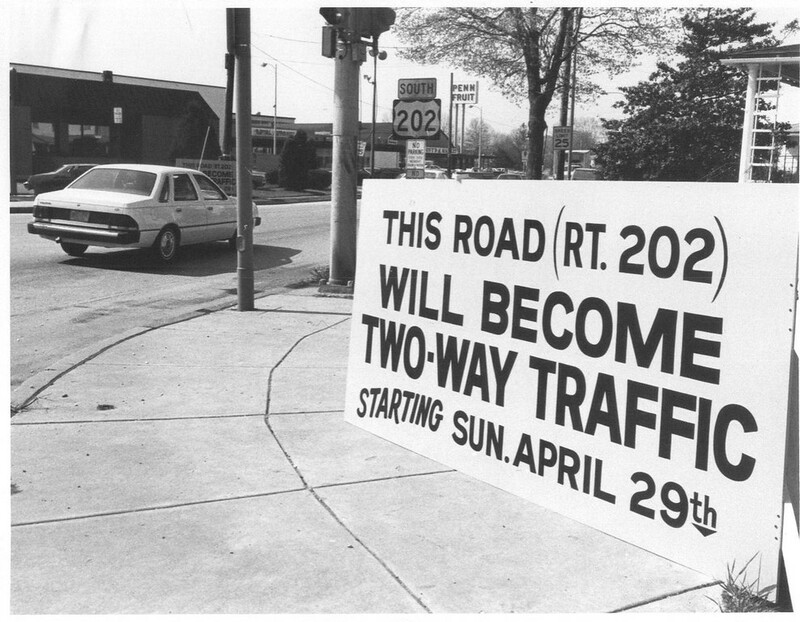 This Times Herald file photo shows a sign at the intersection of Markley Street (Route 202) and West Johnson Highway in Norristown announcing that Markley Street will become a two-way traffic street on April 29, 1984. 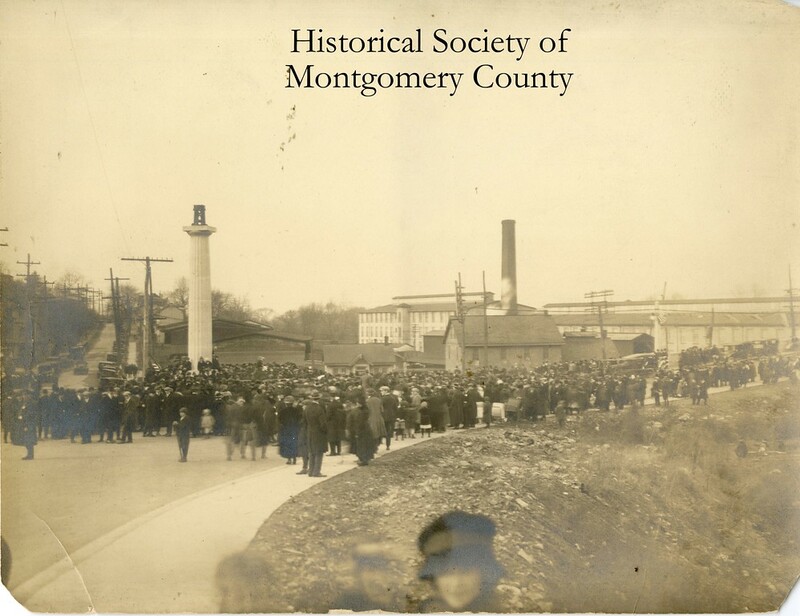 This undated photo from the Historical Society of Montgomery County shows the Norristown Brick Company. 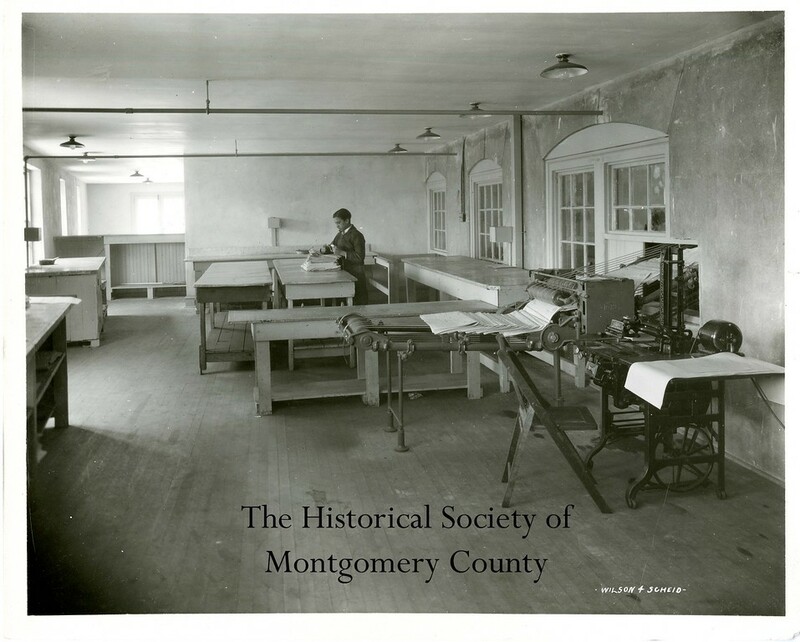 This photo from the Historical Society of Montgomery County shows an interior view of The Times Herald in Norristown around 1930. 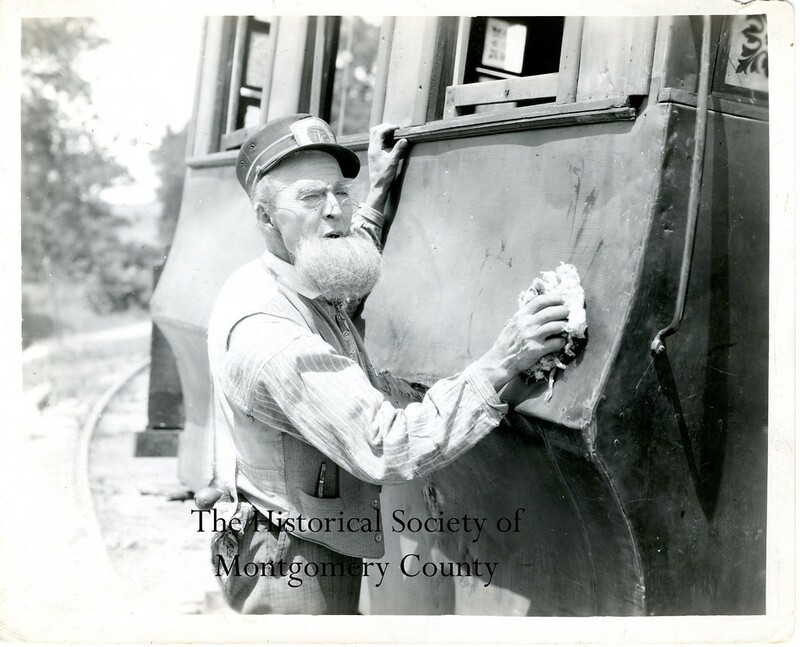 This photo from the Historical Society of Montgomery County is a still from the Toonerville Trolley shorts that were produced by Betzwood studios. 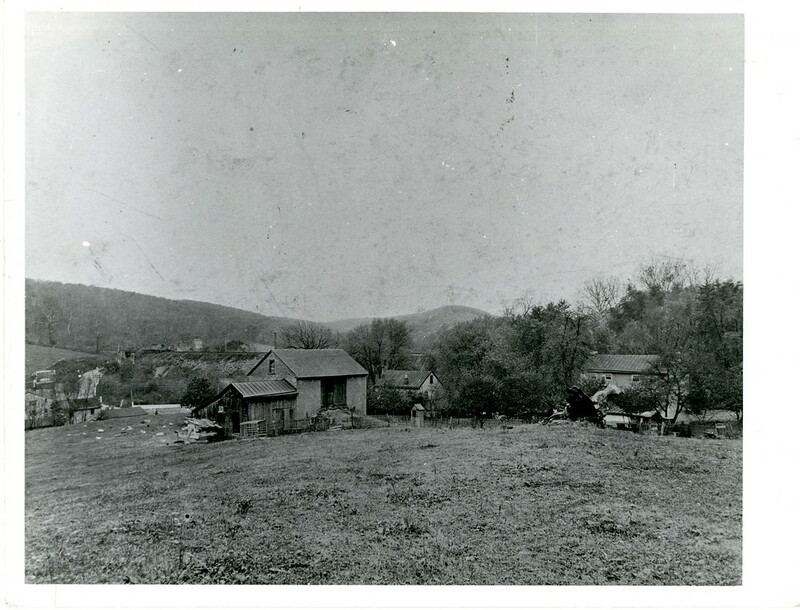 The studios were located in West Norriton Township in the early 1900s. 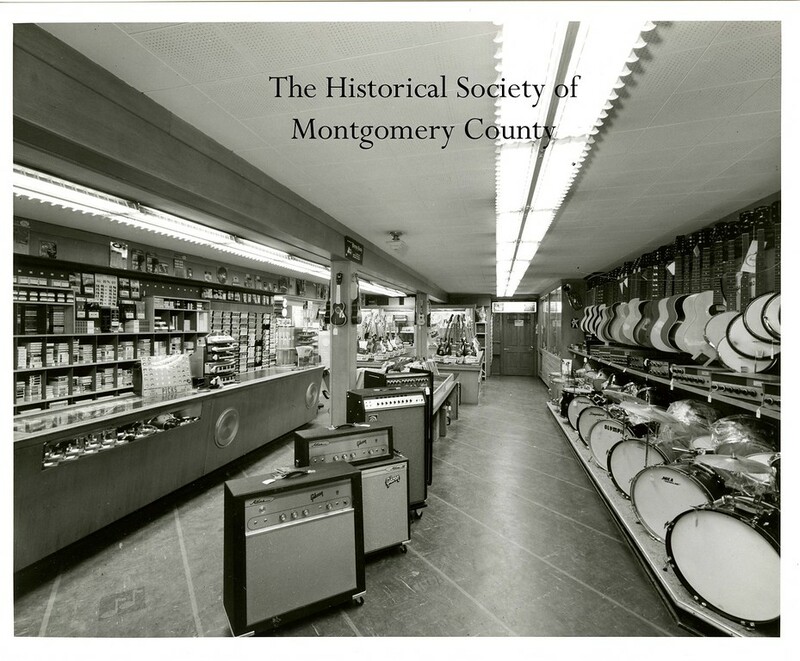 This photo from the Historical Society of Montgomery County shows McCoy's Music Store in Norristown in, what they believe is, the 1960s. 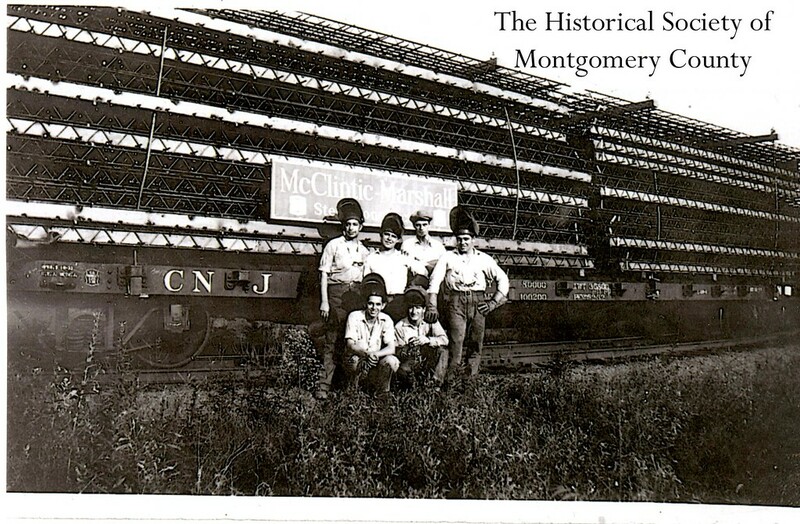 This photo from the Historical Society of Montgomery County shows McClintic Steel in Pottstown c. 1933. 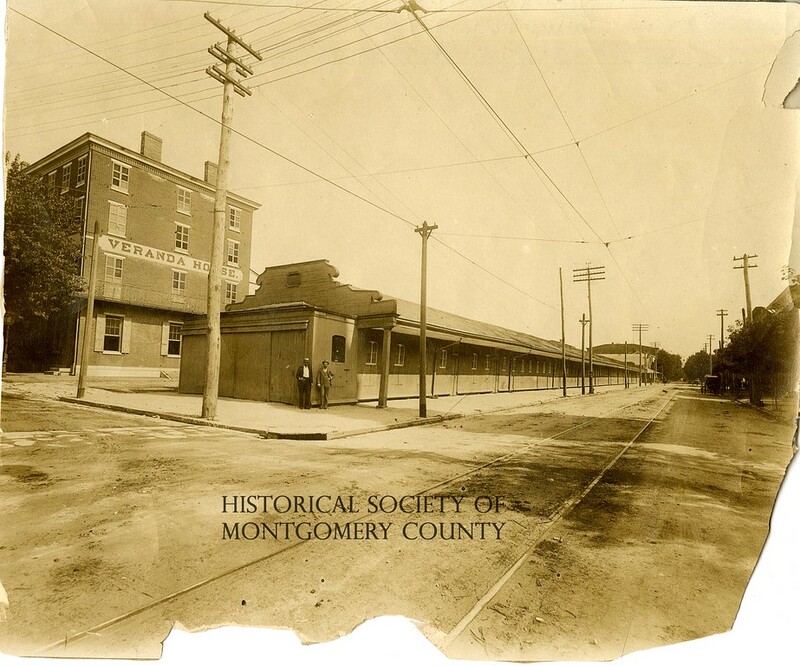 This photo from the Historical Society of Montgomery County shows Lee Tires in Conshohocken circa 1920. 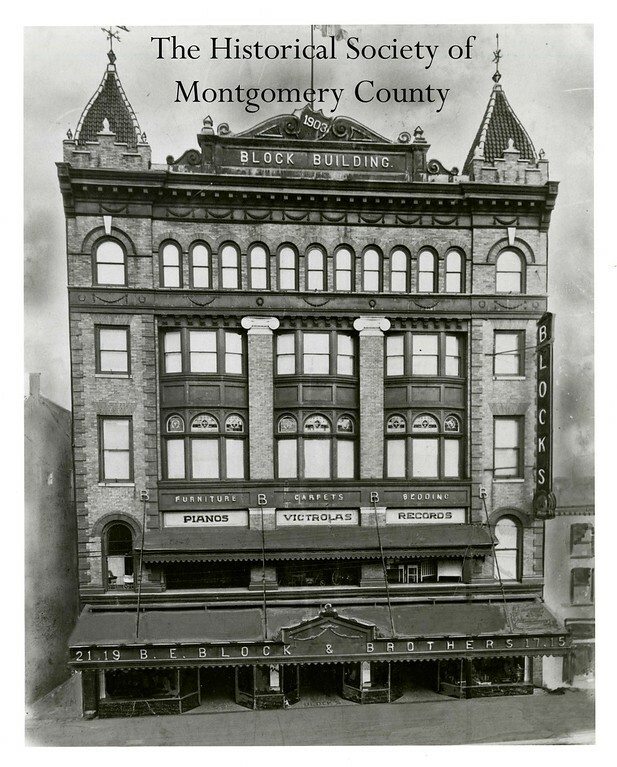 This photo from the Historical Society of Montgomery County shows the Blocks Building in Norristown at the turn of the century (about 1900). 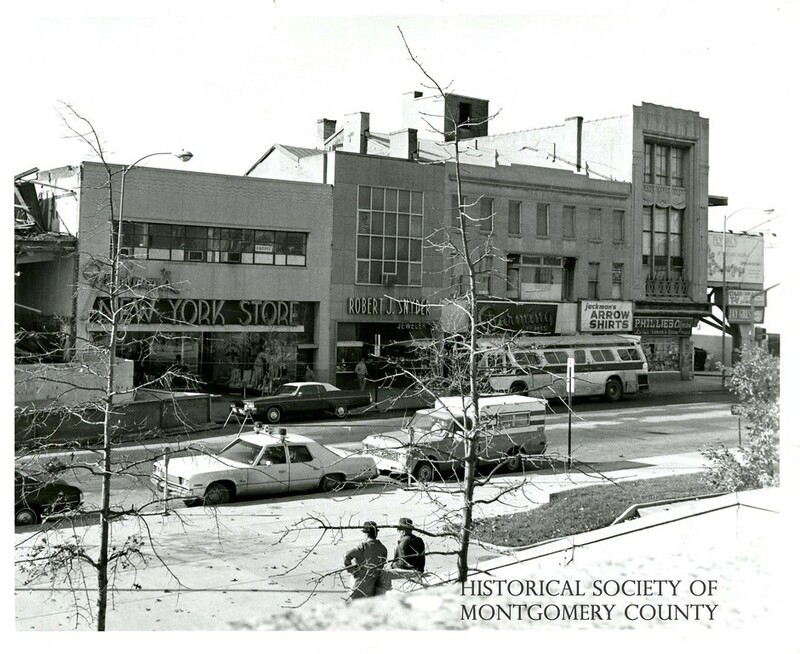 This photo from the Historical Society of Montgomery County shows Blocks Department Store in Norristown in the late 1960s. 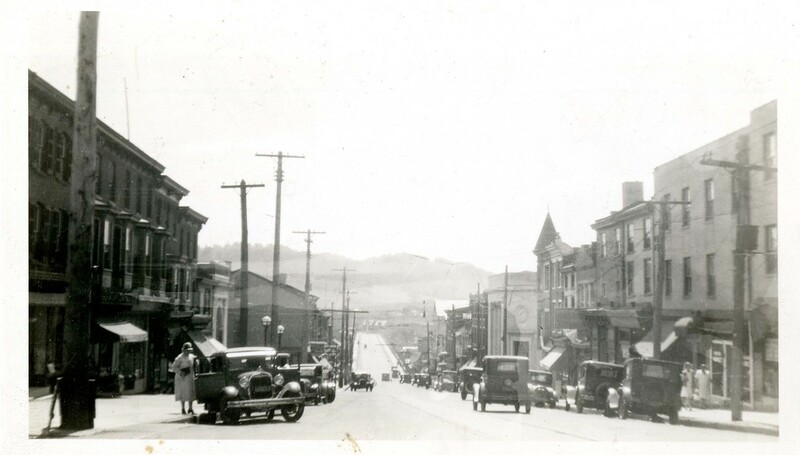 This submitted, undated photo shows Stanbridge and Jackson streets in Norristown. 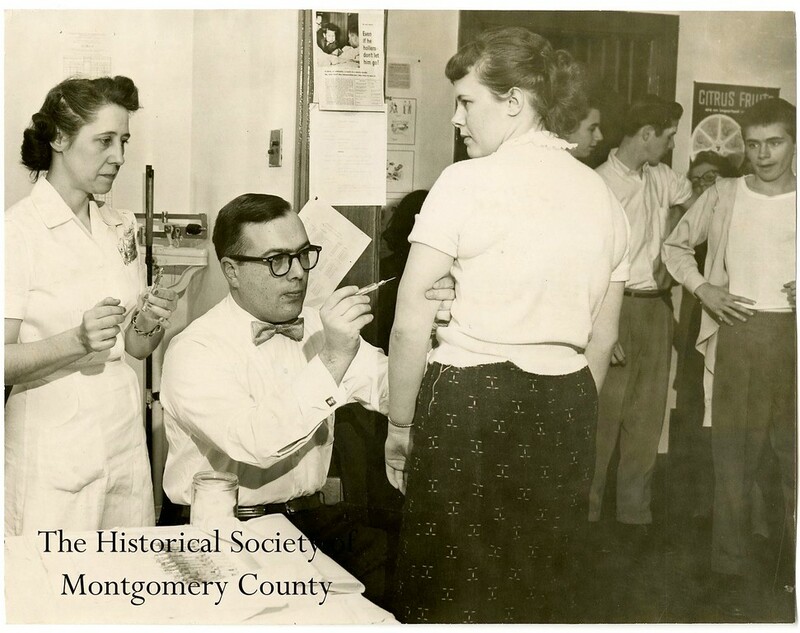 This undated photo from the Historical Society of Montgomery County shows the first student at a Conshohocken high school receiving the Polio vaccine. 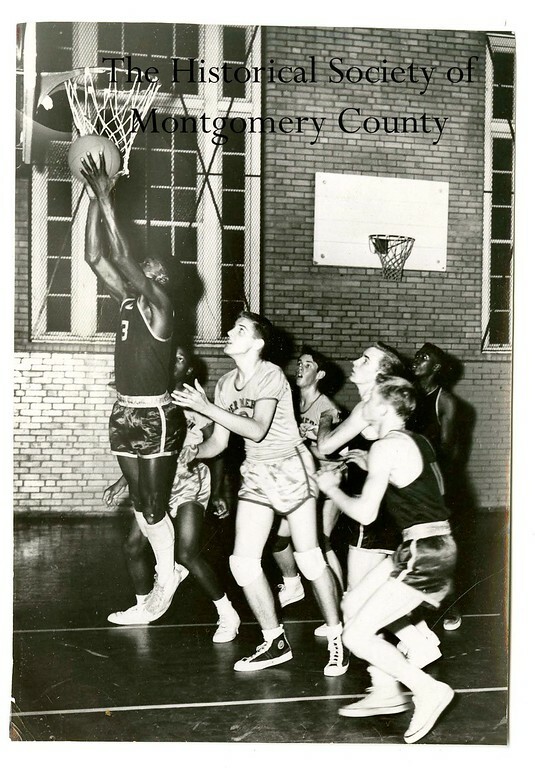 This undated photo from the Historical Society of Montgomery County shows the Junior Varsity basketball game between Upper Merion High School and Conshohocken High School. 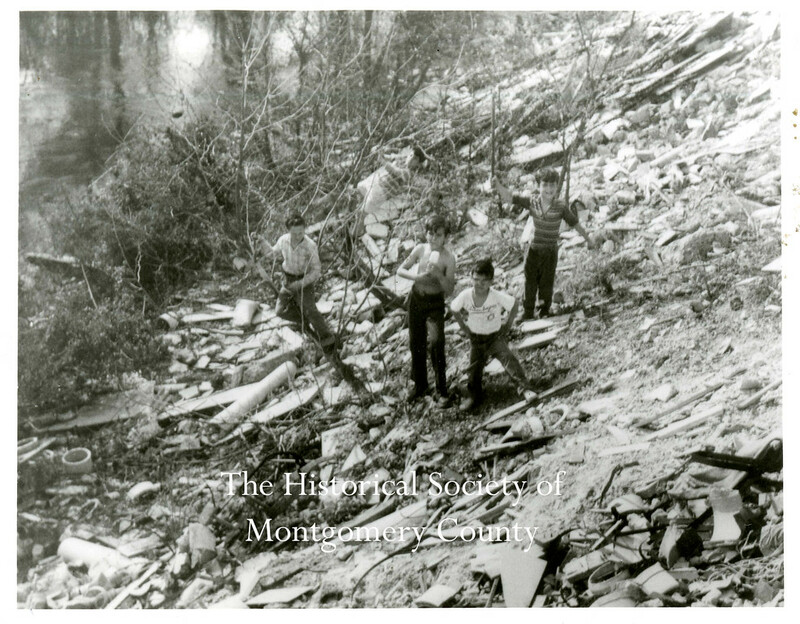 This photo from the Historical Society of Montgomery says "V.F. 'Students for Loyalty'" on the back of it. 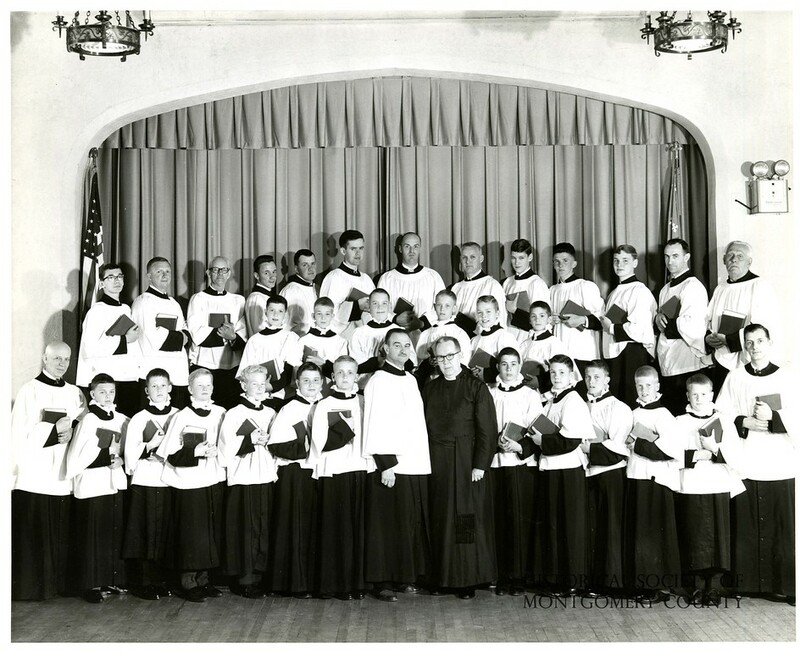 There is no date, but the Historical Society believes it is from the 1950s. 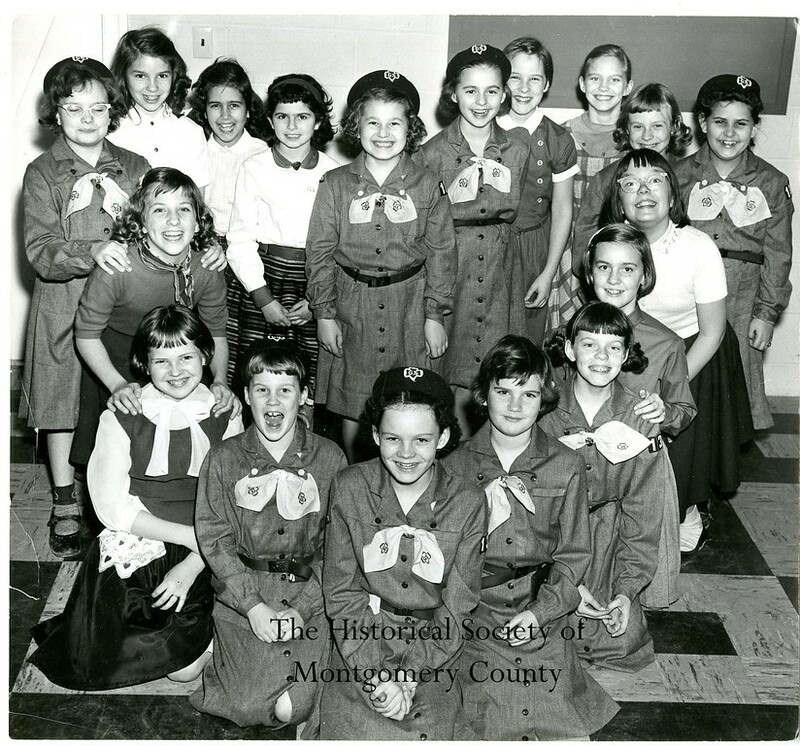 This photo from the Historical Society of Montgomery County shows the Valley Forge Girls Scouts in 1955. 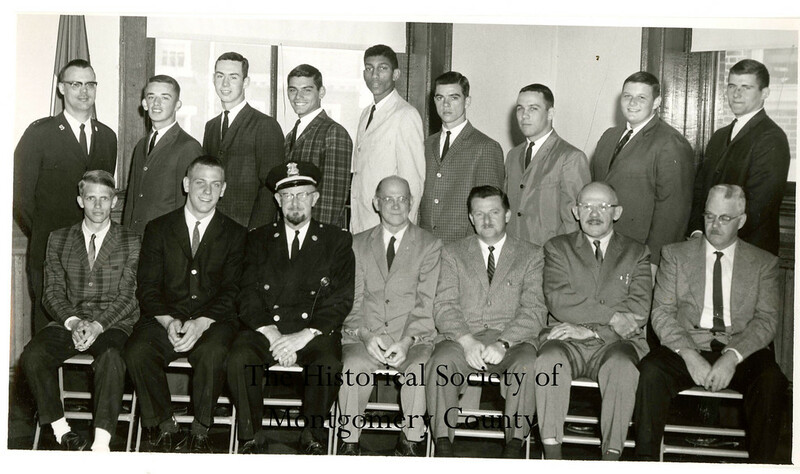 This photo from the Historical Society of Montgomery County is from 1956 and related to the Valley Forge Military Academy, according to writing on the back of the photo. 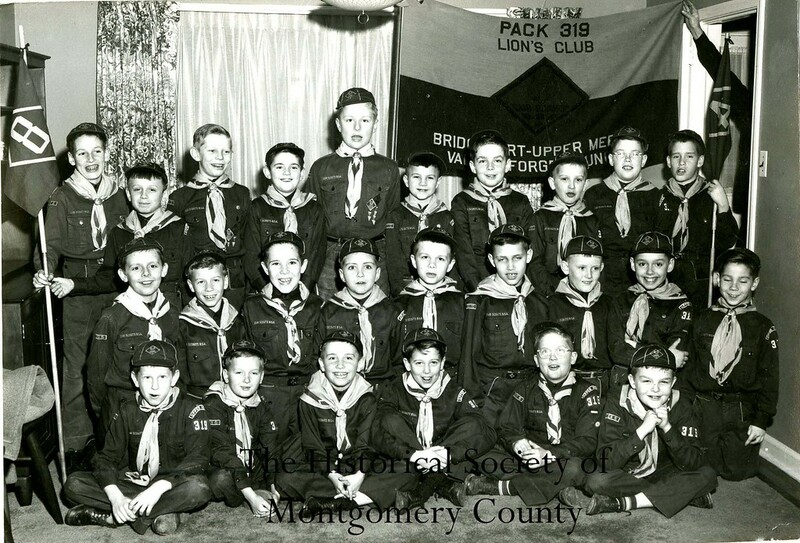 This undated photo from the Historical Society of Montgomery County shows the Bridgeport–Upper Merion–Valley Forge cub scout troop. 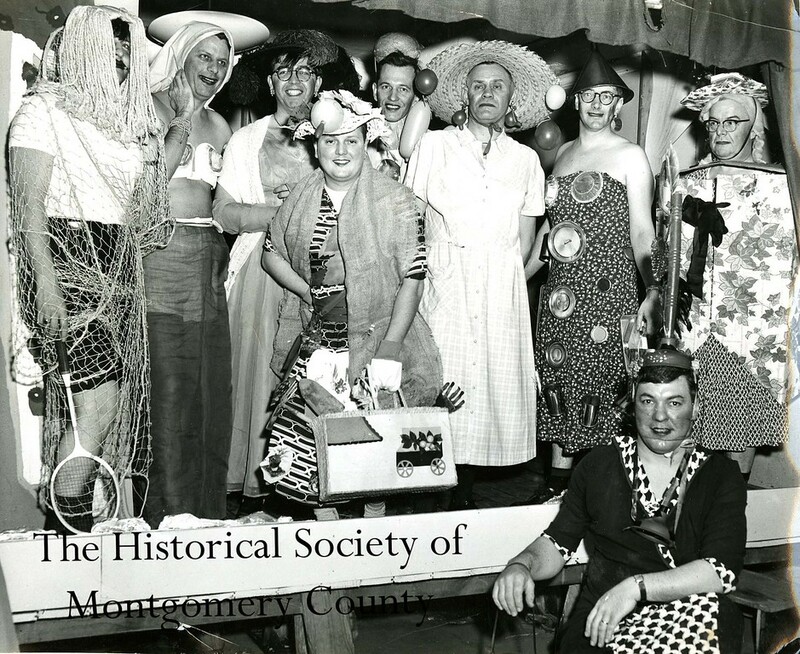 This undated photo from the Historical Society of Montgomery County is from the "Conshohocken Spring Mill Fathers' Nite." 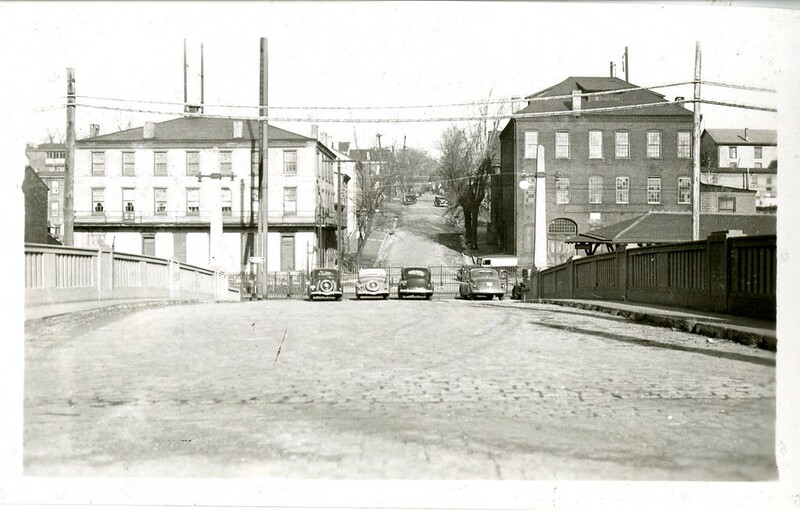 This undated photo from the Historical Society of Montgomery County shows West Marshall Street looking west from Chain Street in Norristown. 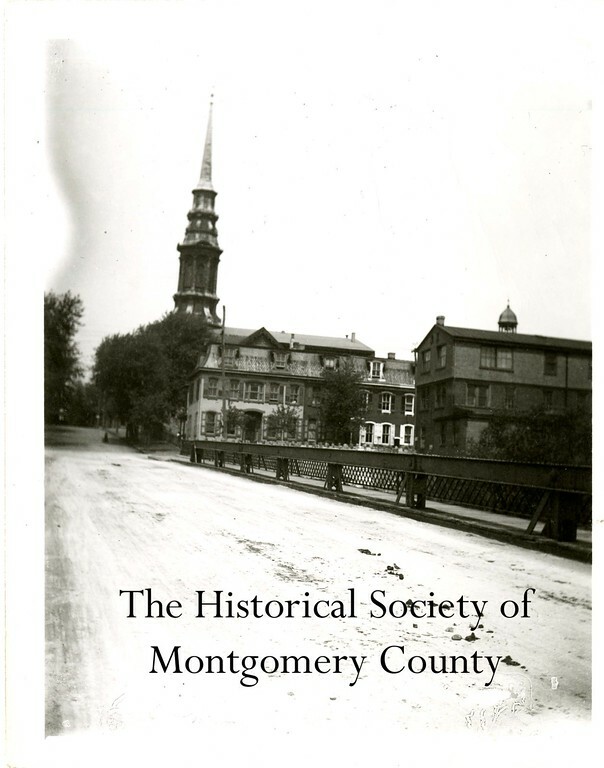 This undated photo from the Historical Society of Montgomery County shows First Presbterian Church on East Airy Street in Norristown. 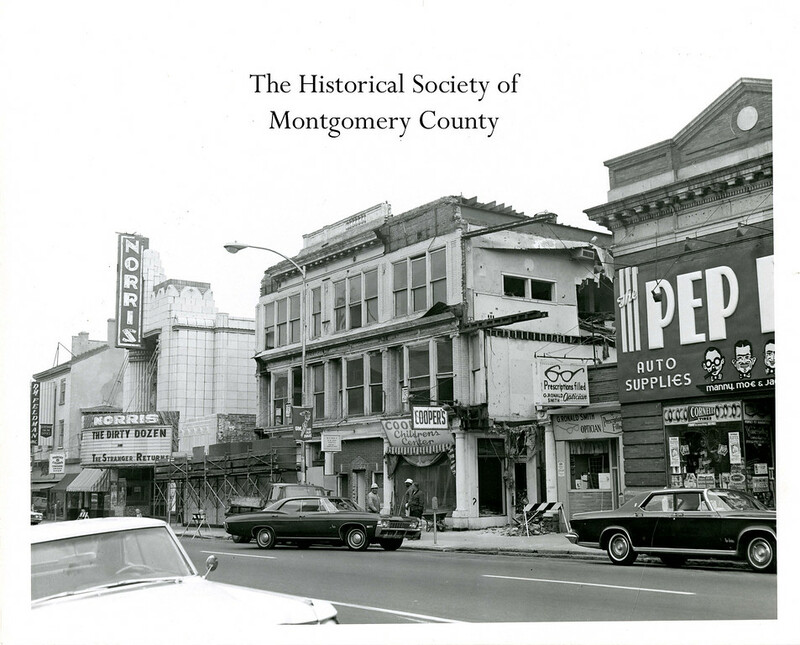 This undated photos from the Historical Society of Montgomery County shows East Airy Street, between DeKalb and Green streets in Norristown. 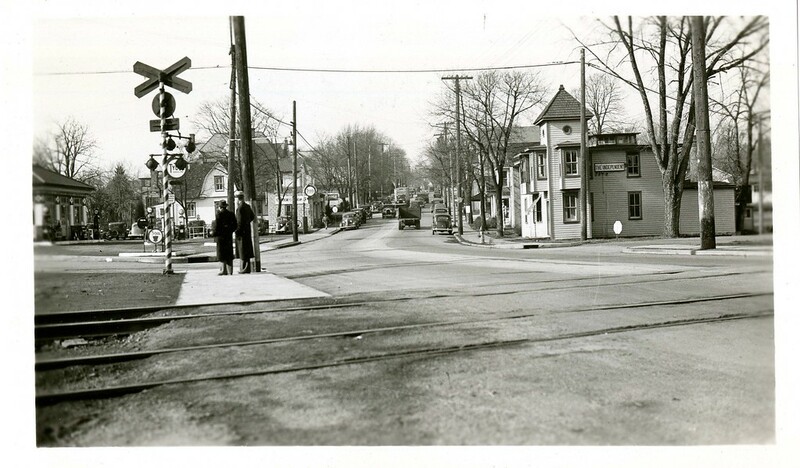 This undated photo from the Historical Society of Montgomery County shows the intersection of Markley and Marshall streets in Norristown, looking east onto Marshall. 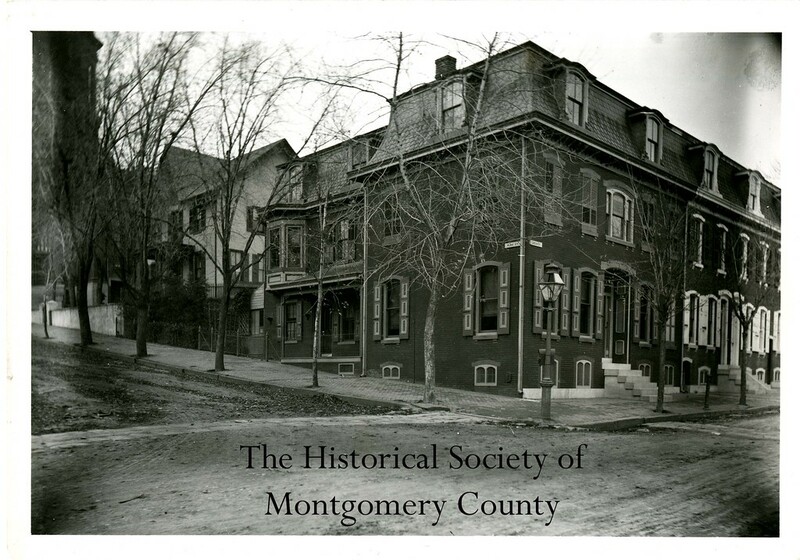 This undated photo from the Historical Society of Montgomery County shows stately homes on Penn Street in Norristown. These homes were demolished for the courthouse annex. 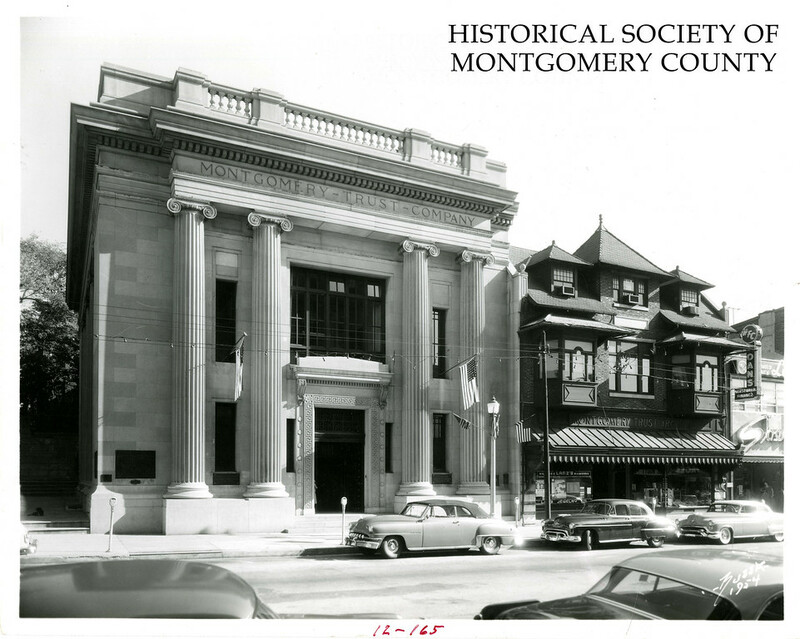 This photo from the Historical Society of Montgomery County shows Historical Hall in Norristown in 1962. 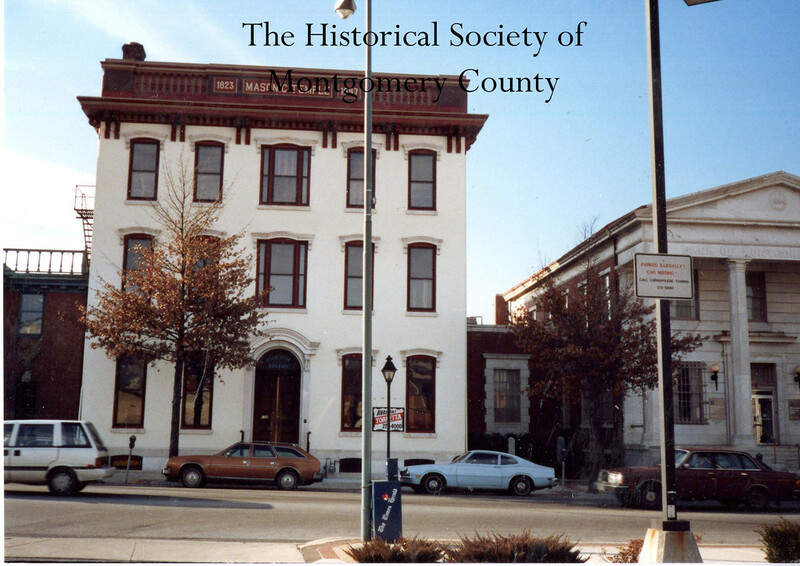 It was once the home of the Historical Society and before that was Norristown Municipal Hall. It was demolished for the annex. 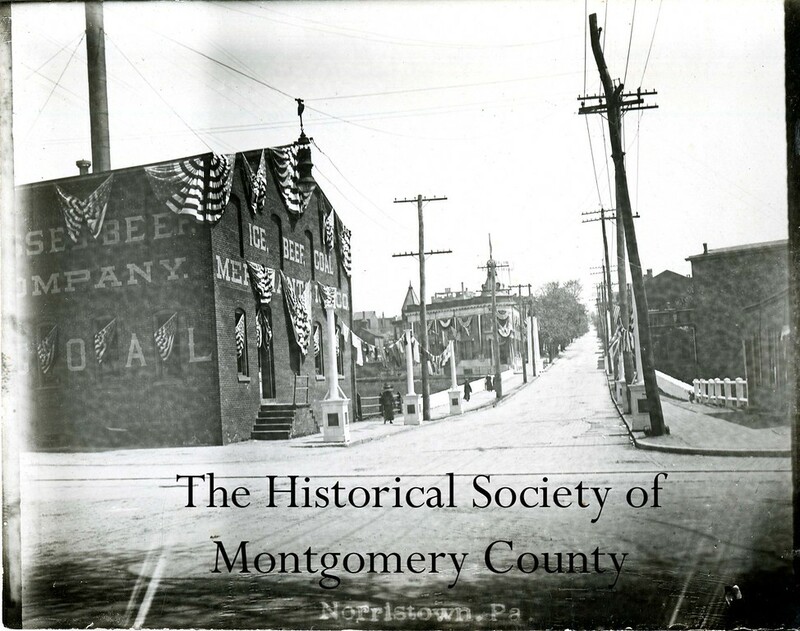 This undated photo from the Historical Society of Montgomery County shows Penn and Green streets in Norristown. 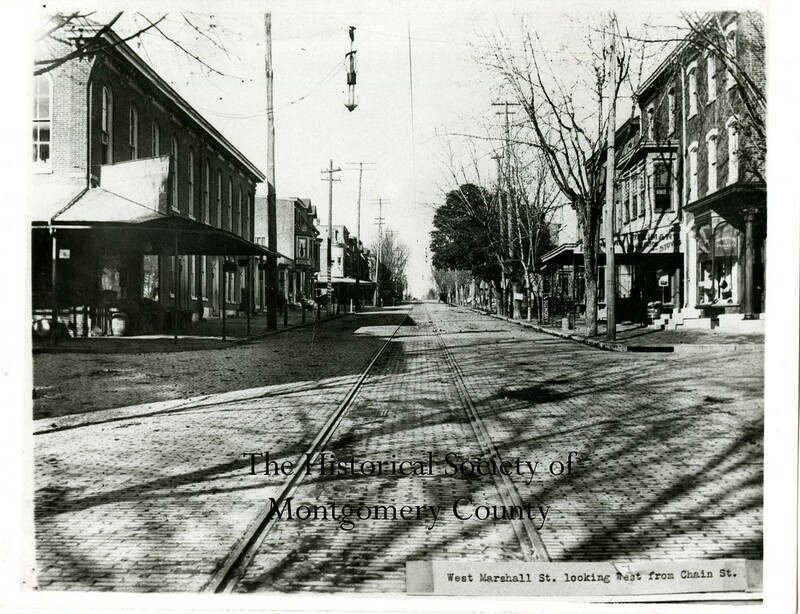 This photo from the Historical Society of Montgomery County shows East Main Street in Norristown. 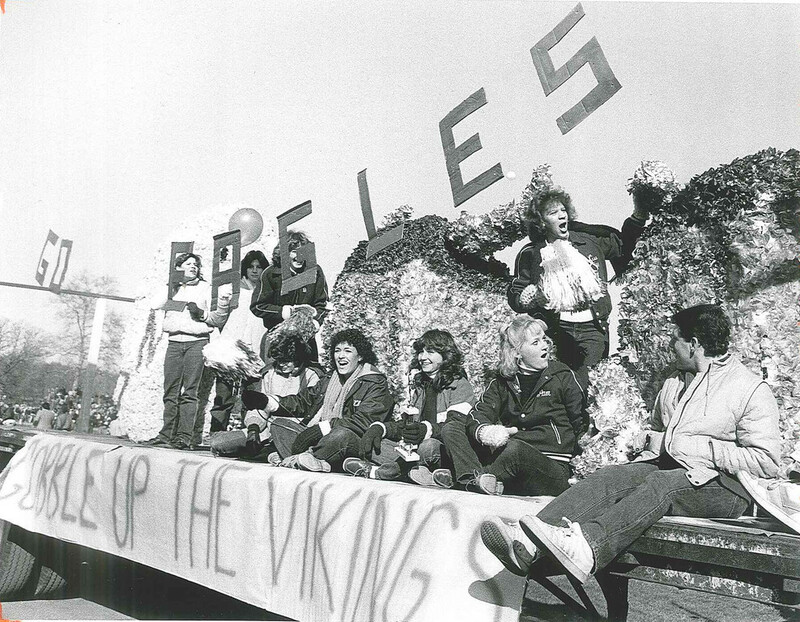 The Historical Society believes it was taken in the early 1970s. 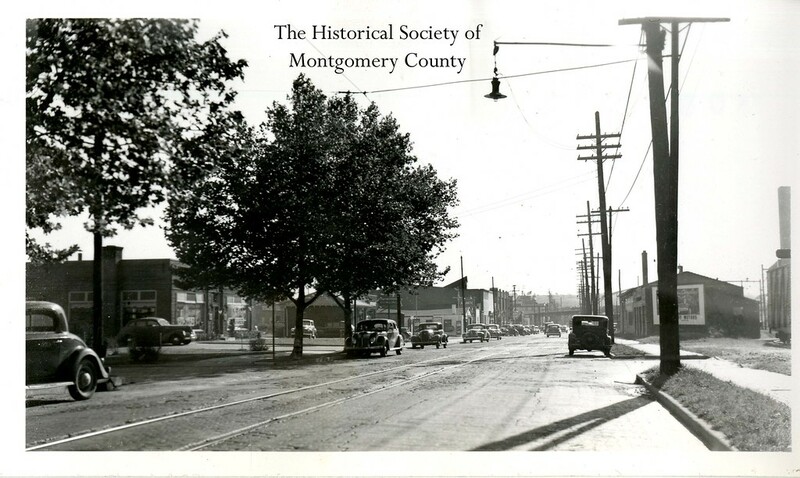 This photo from the Historical Society of Montgomery County shows Markley Street in Norristown in the 1940s. It was taken by Hen Johnson. 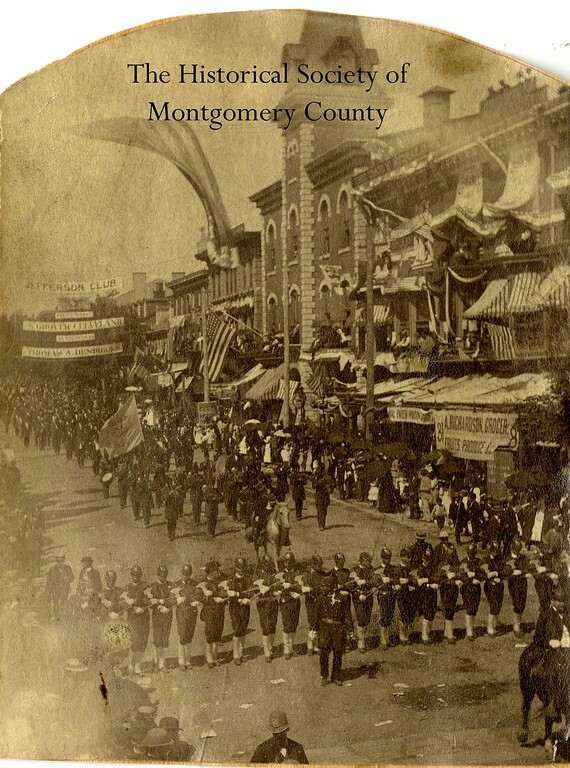 This photo from the Historical Society of Montgomery County shows a parade in Norristown. The Historical Society believes the photo was taken in 1884 because of a sign in the background for Grover Cleveland and his running mate in 1884 Thomas A. Hendricks. 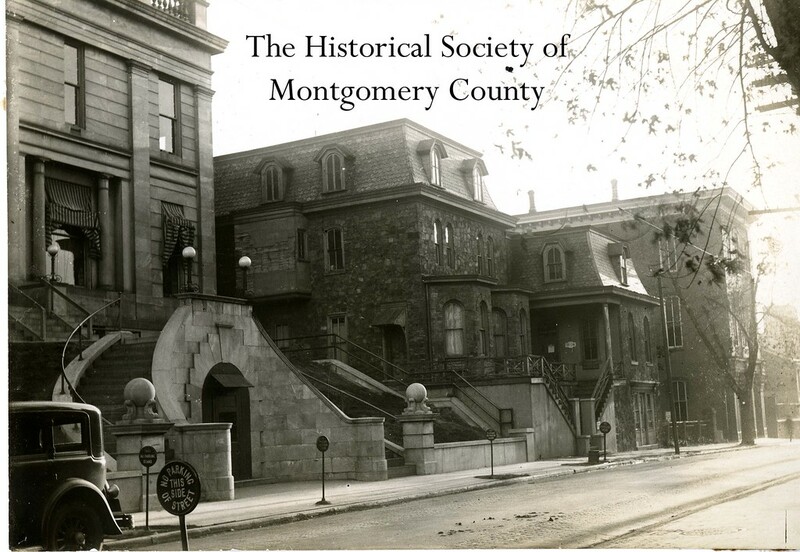 This undated photo from the Historical Society of Montgomery County shows the Montgomery Trust building Norristown. It was later demolished to create a parking garage for the courthouse. 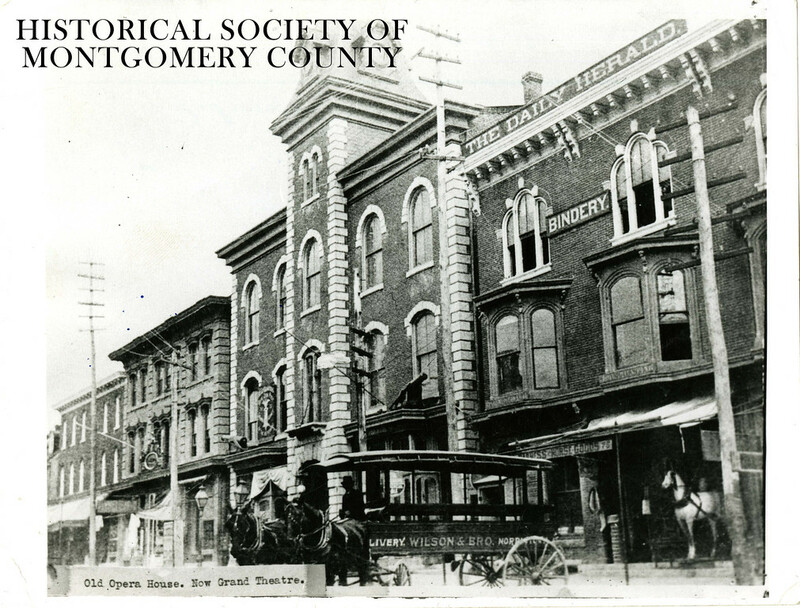 This undated photo from the Historical Society of Montgomery County shows the Opera House which later became the Grand Theatre, once located between Swede and DeKalb streets on Main Street in Norristown. It was knocked down May 18, 1976 and is now a public parking lot. 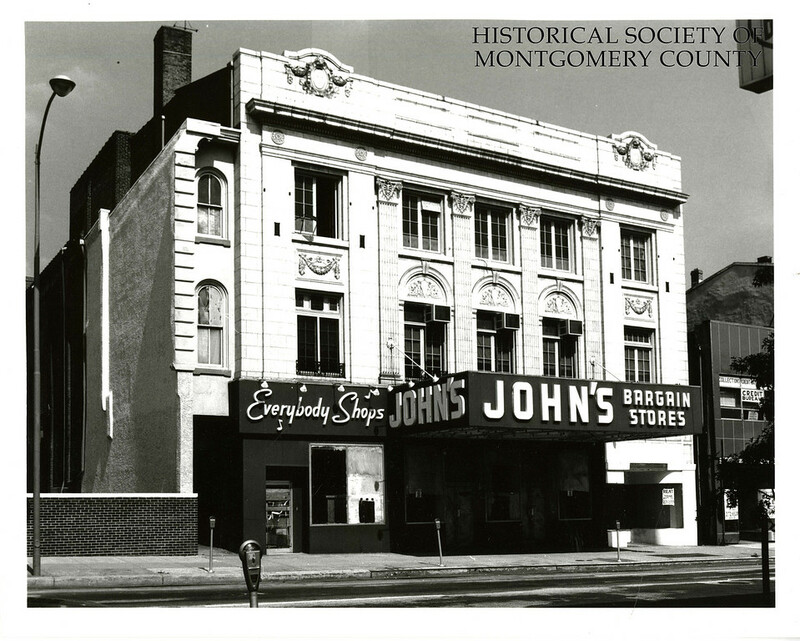 This undated photo from the Historical Society of Montgomery County shows John's Bargain Store in Norristown. 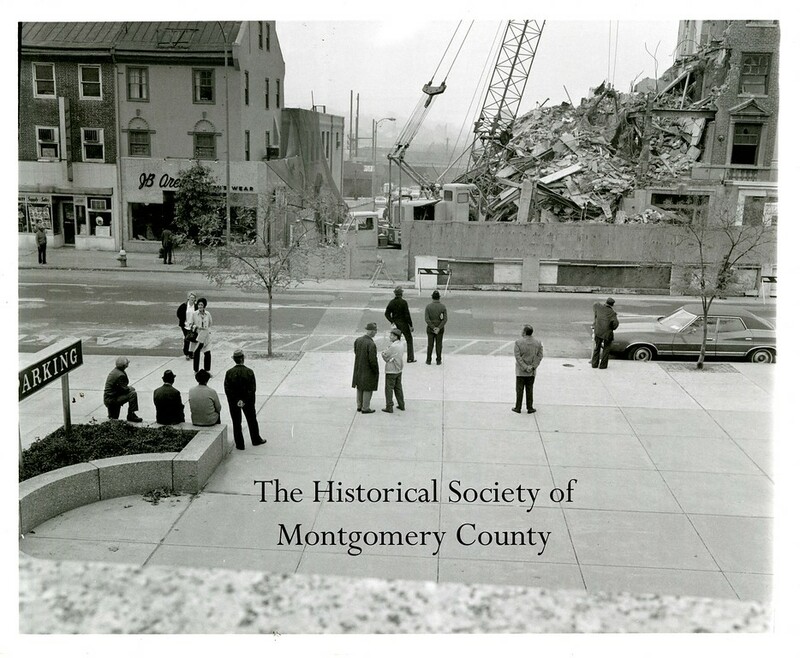 The building was demolished for the parking garage for the Montgomery County Courthouse. 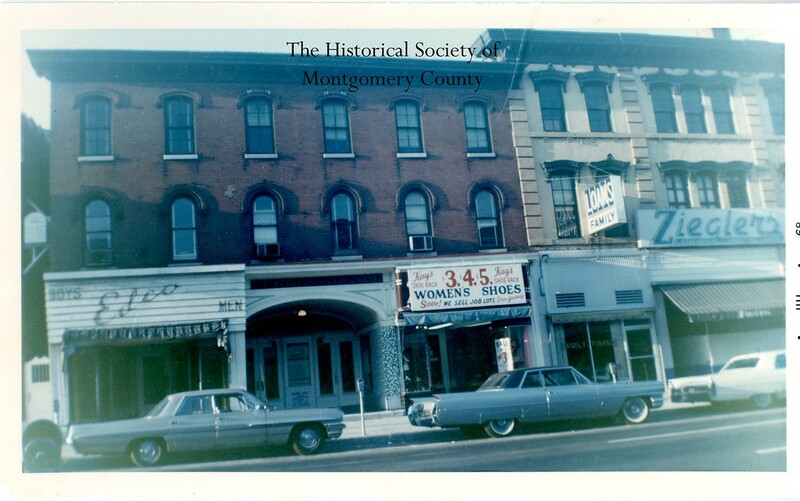 This photo from the Historical Society of Montgomery County shows West Main Street in Norristown in the early 1970s. 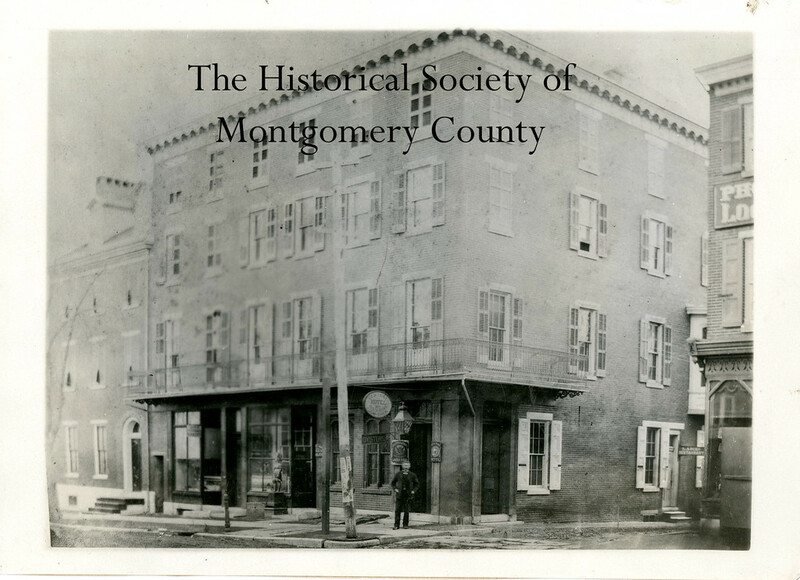 This undated photo from the Historical Society of Montgomery County shows a building on West Airy Street. 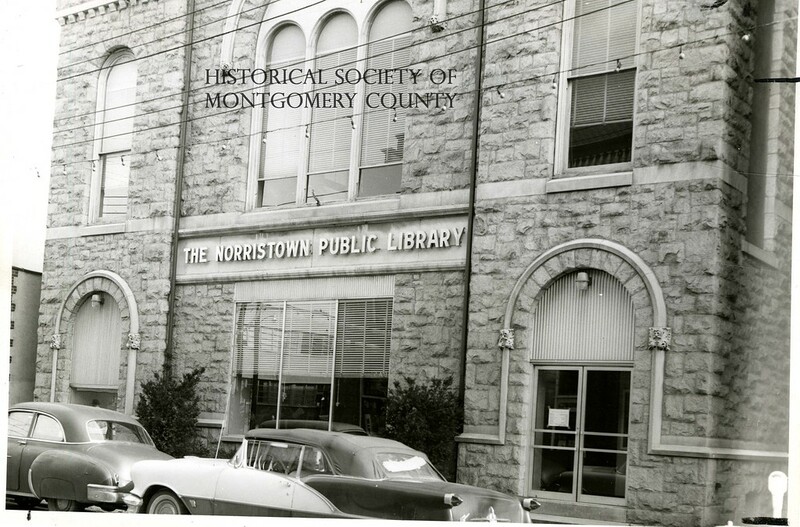 This photo from the Historical Society of Montgomery County shows the old Norristown Public Library in the (c.) mid-1960s. It was located on DeKalb Street. 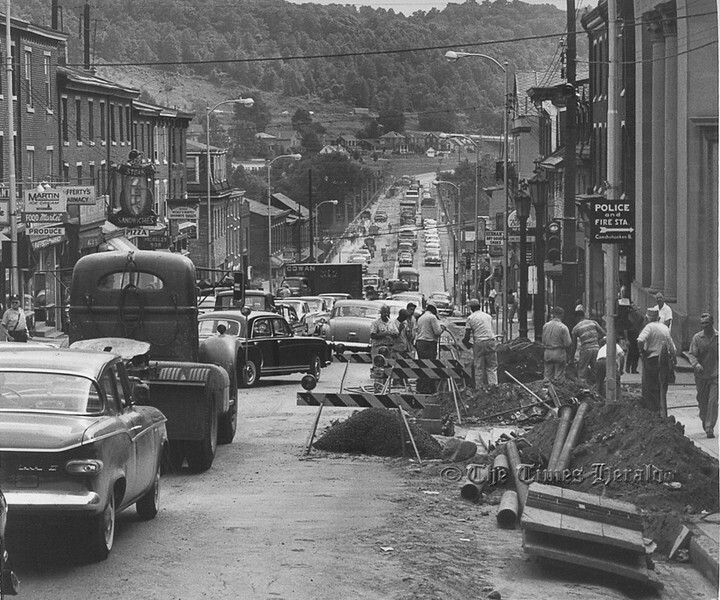 This photo from the Historical Society of Montgomery County shows a busy Main Street in Norristown in the 1940s. 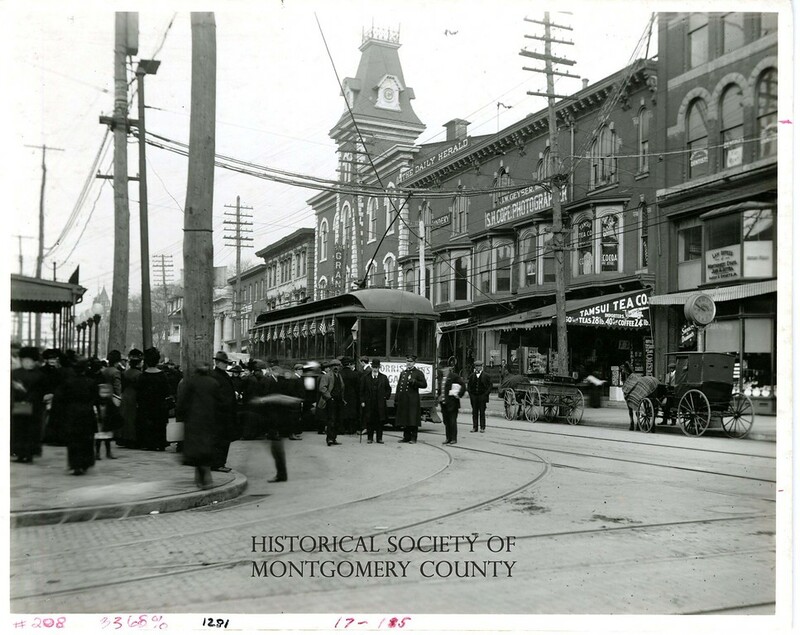 This photo from the Historical Society of Montgomery County shows the Norristown Market in c. 1890. It is at the same location as the old Borough Hall at DeKalb and Airy streets. This image shows the front page, left, and jump page from the Dec. 8, 1941 edition of the Norristown Times Herald Extra. At this time, The Times Herald was an afternoon paper that did not print a Sunday edition. 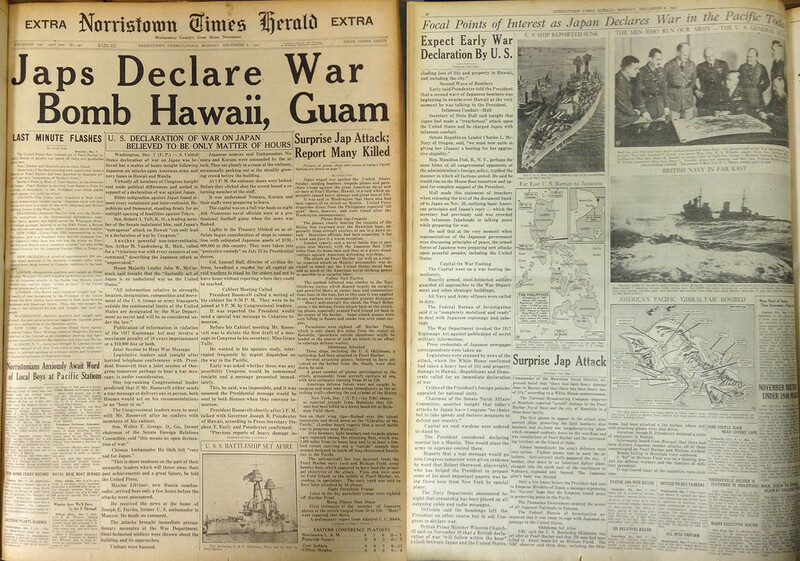 This Extra edition was printed early in the day Monday, Dec. 8, 1941 to announce the bombing of Pearl Harbor. 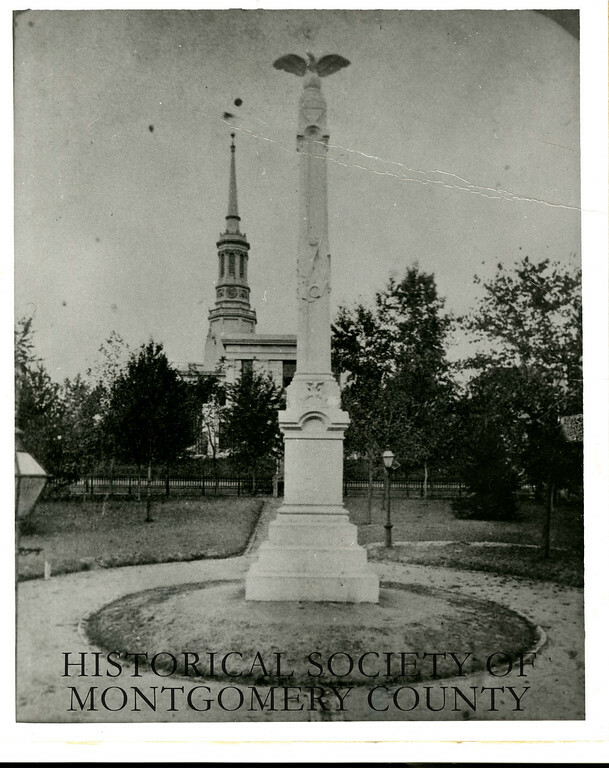 This undated photo from the Historical Society of Montgomery shows the War Memorial in Public Square in Norristown. 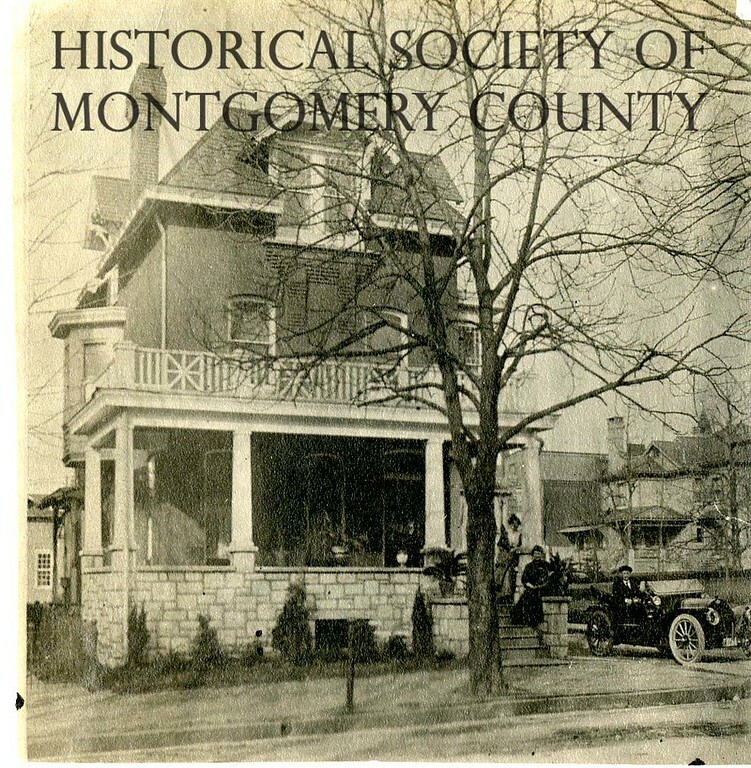 This photo from the Historical Society of Montgomery County shows the Ballard House at Haws Avenue and Main Street in Norristown in 1914. Helen and George Ballard can been seen on the front steps. 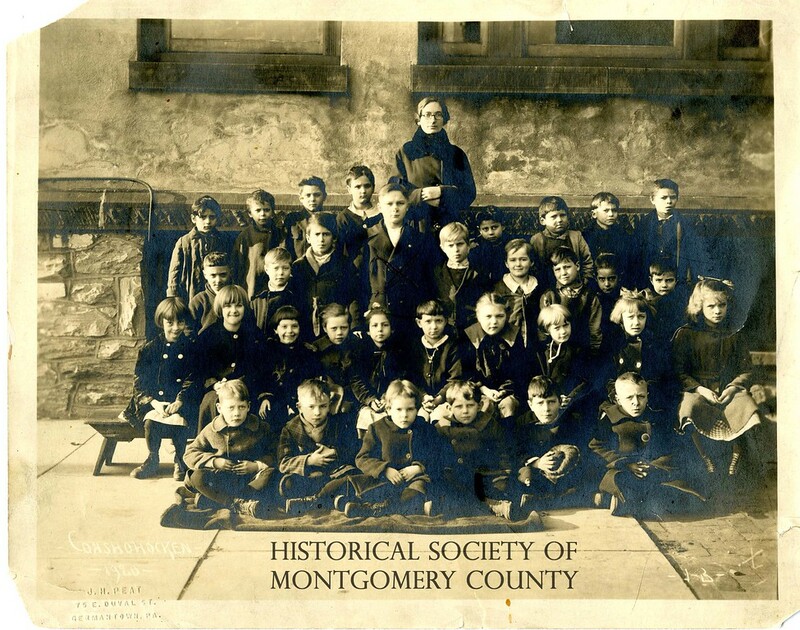 This photo from the Historical Society of Montgomery County shows teacher Bessie D. Nase's class in 1920 at the Henry Street School in Conshohocken. 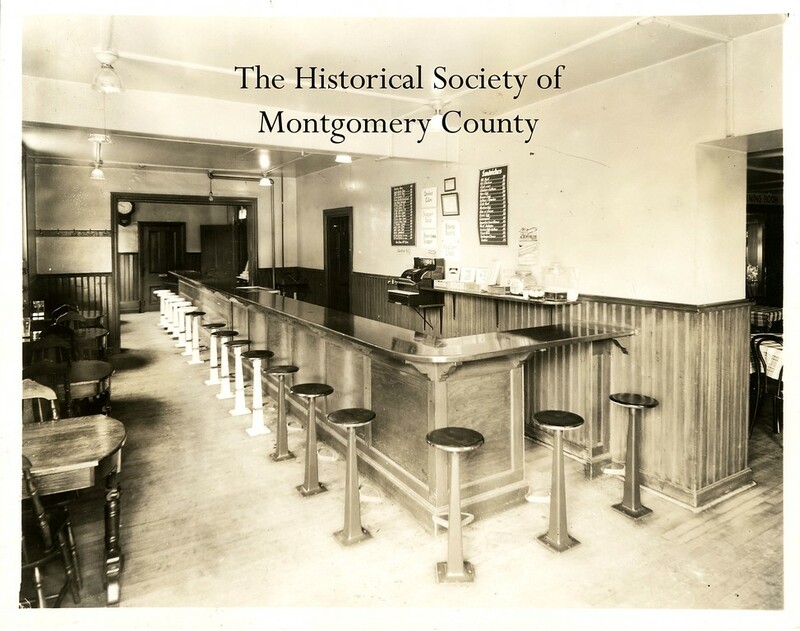 This undated photo from the Historical Society of Montgomery County show Ward's Oyster House, which was located at Main and Strawberry streets in Norristown. B.T. Ward is seen standing in the doorway. 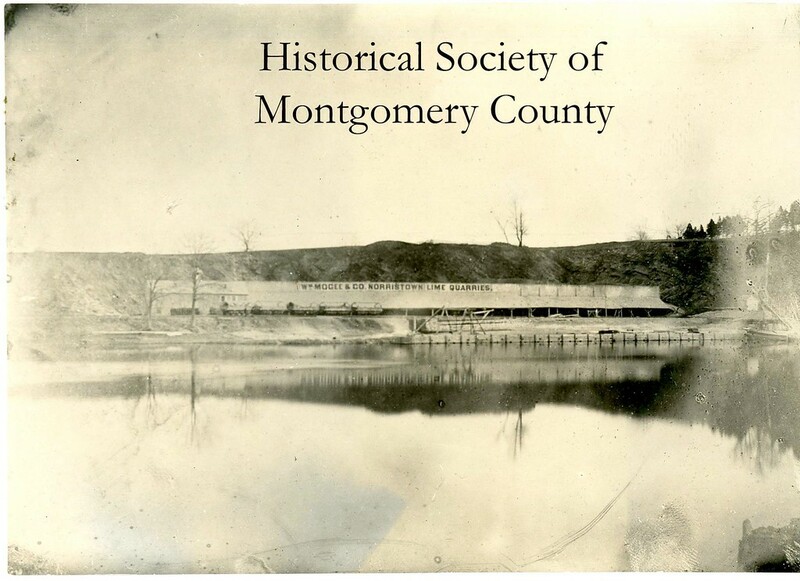 This undated photo from the Historical Society of Montgomery County shows the Humane Fire Company House in ‪‎Norristown‬. 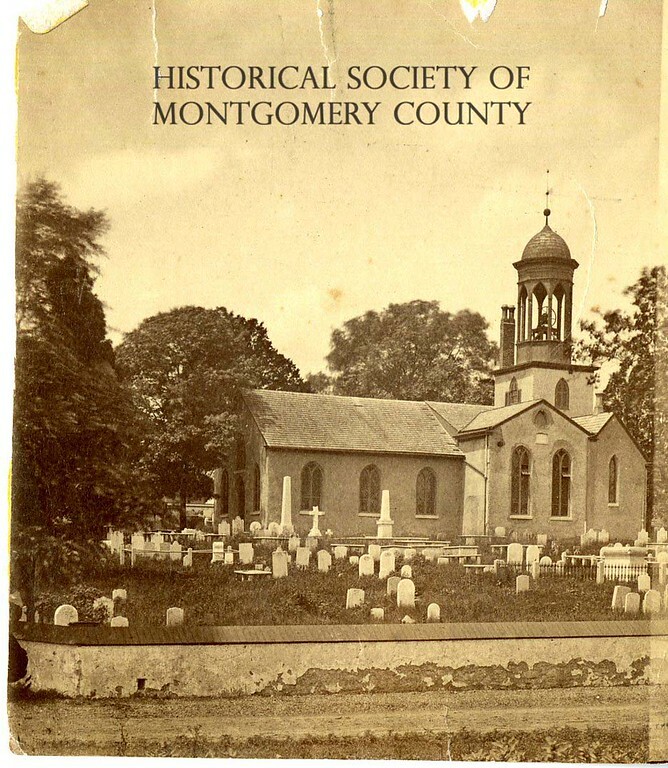 This undated photo from the Historical Society of Montgomery County shows Old Swedes’ Episcopal Church in Bridgeport. 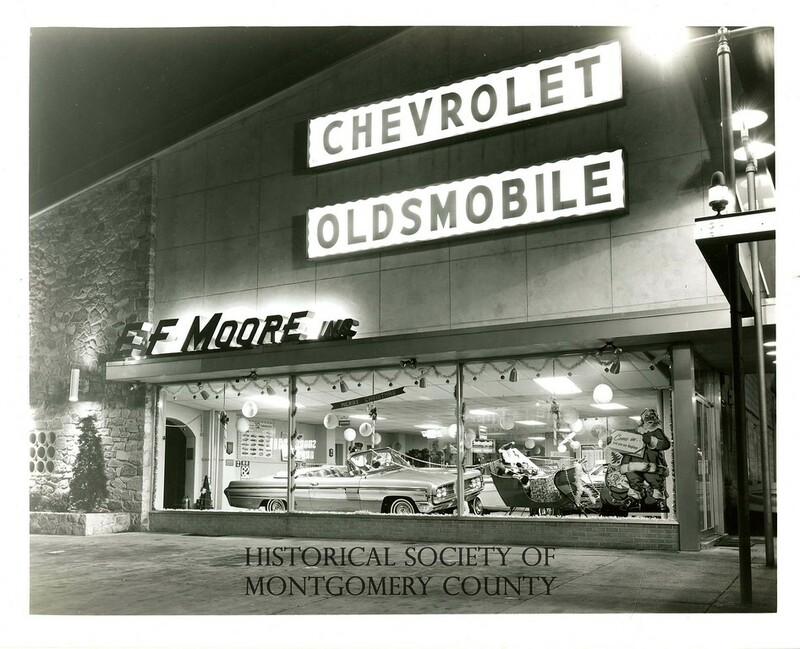 This undated photo from the Historical Society of Montgomery County shows E.F. Moore in Conshohocken. 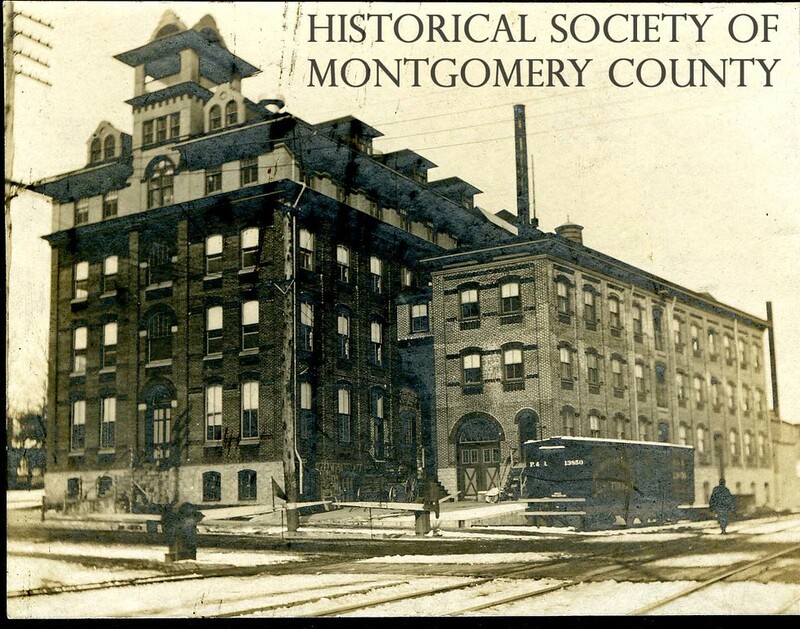 This undated photo from the Historical Society of Montgomery County shows the Gresh Cigar Factory in Norristown. It was located at Corson and Marshall streets. 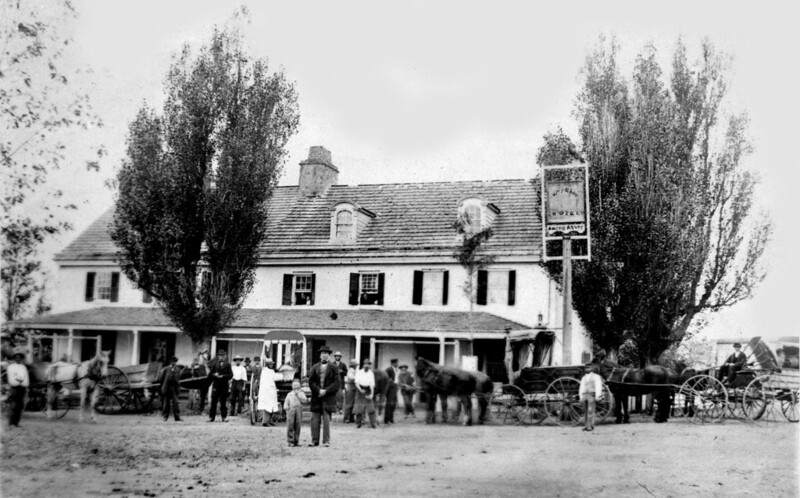 This photo from the William Penn Inn shows the location in the 1880s. A release from the William Penn Inn says its roots date back to 1714, when it was opened as a public house providing food, drink and lodging to travelers between Philadelphia and the many small towns and hamlets scattered throughout the north and west of the city. 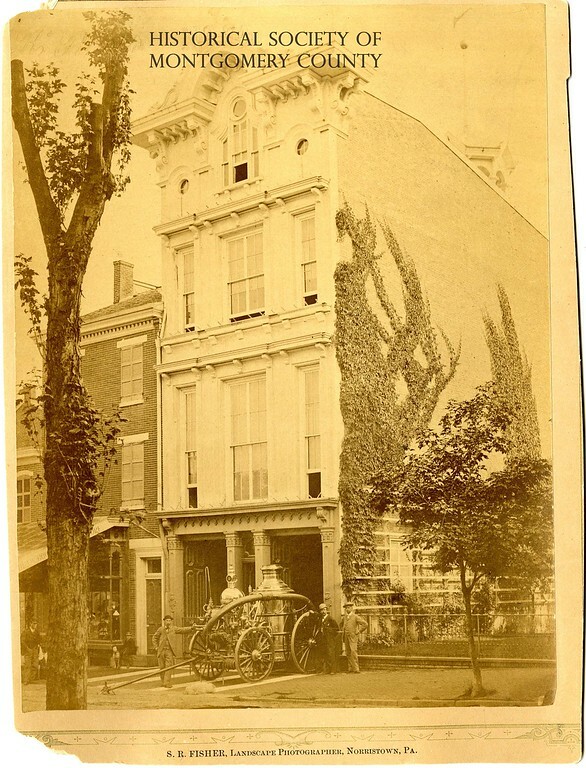 It was licensed as a formal tavern in 1827 and named the “William Penn Hotel” by its then owner David Acuff, in honor of the Quaker founder of Pennsylvania while serving as governor. 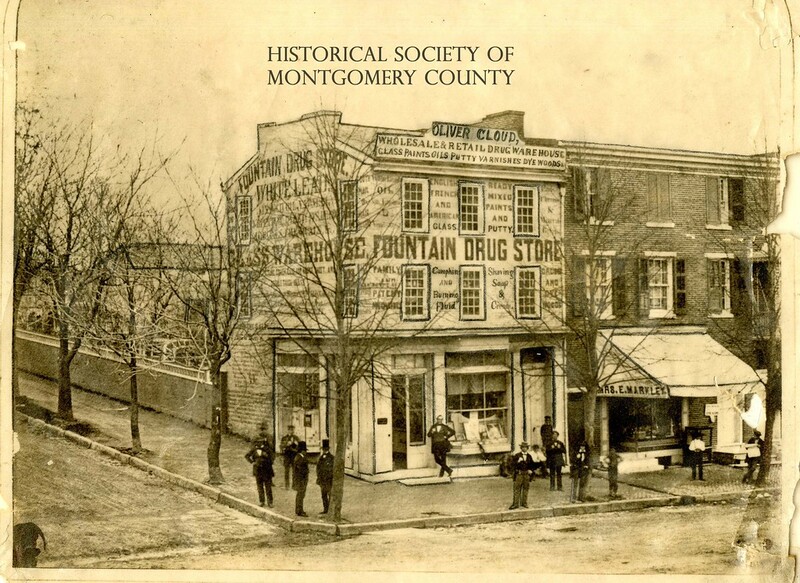 This photo from the Historical Society of Montgomery County shows the Fountain Drug Store in 1912. 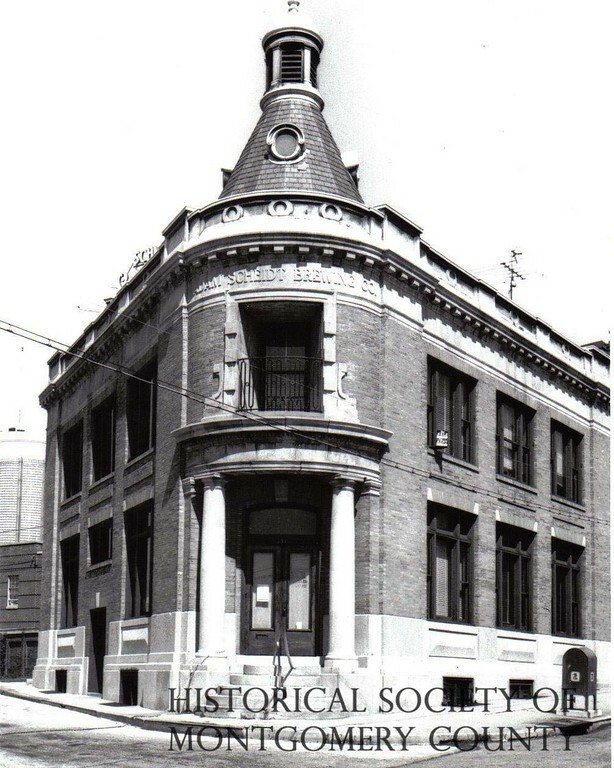 It was located on the northeast corner of Main and DeKalb streets. 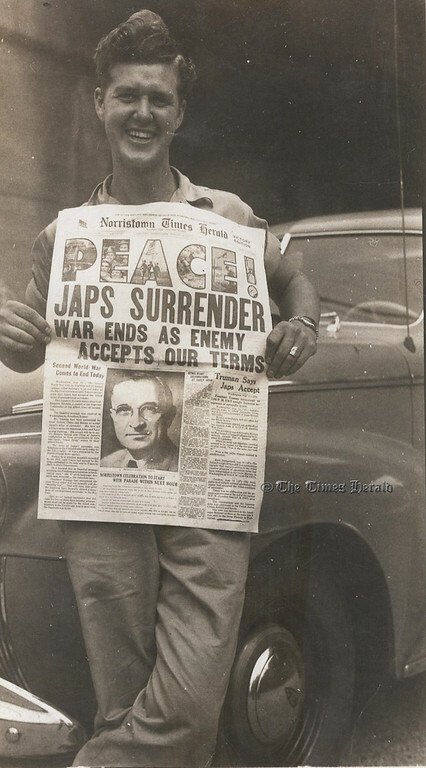 This Times Herald file photo shows a local resident holding The Times Herald in 1945 when World War II ended with the surrender of Japan. 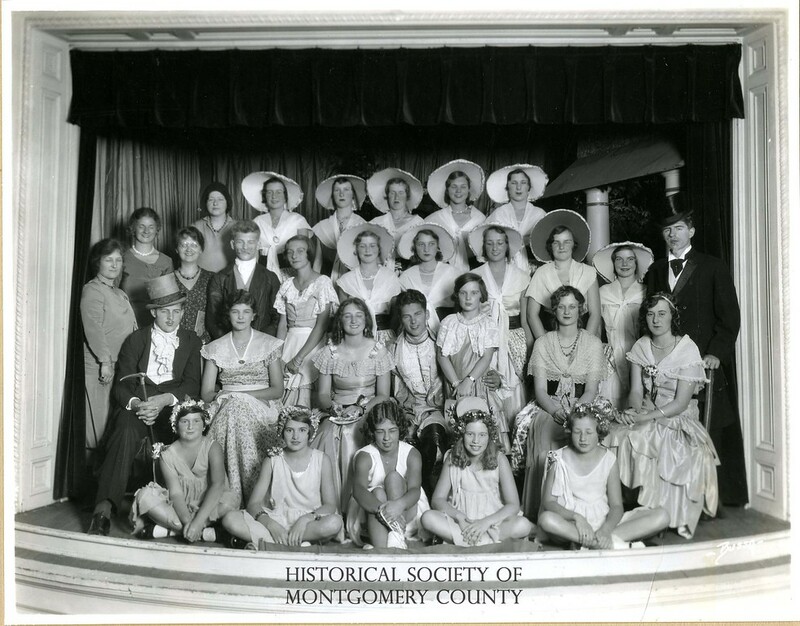 This photo from the Historical Society of Montgomery County shows Norristown's Junior Octave Club at their 1930 production of The Wishing Well. 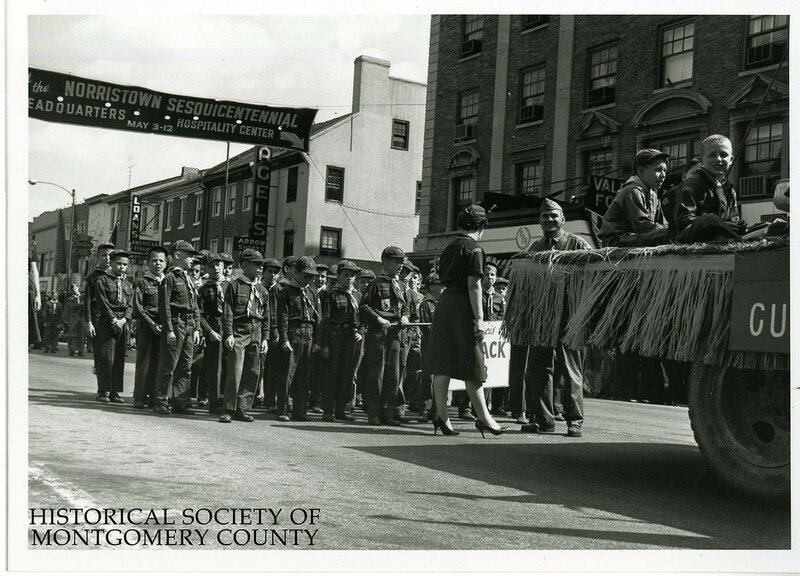 This photo from the Historical Society of Montgomery County shows the Sesqui Boy Scouts during the 1962 Sesquicentennial Parade in Norristown. 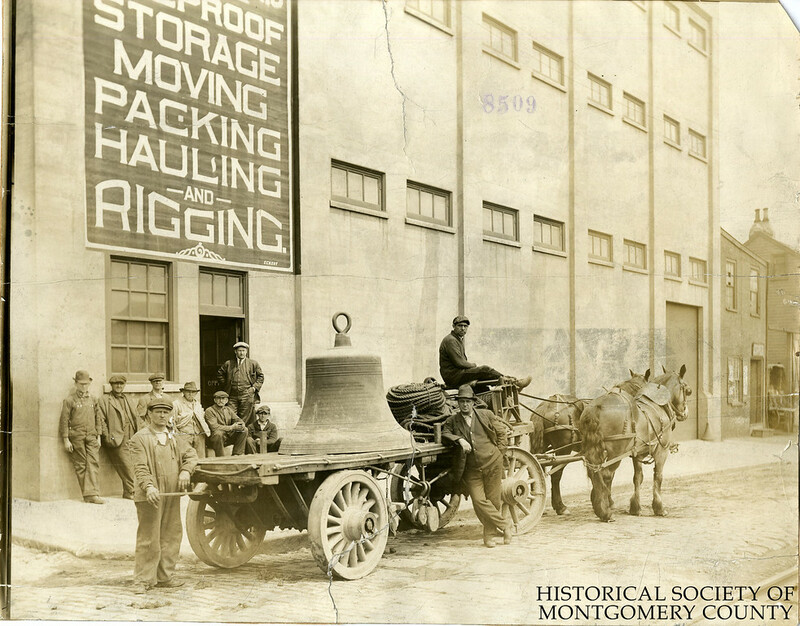 This photograph from the Historical Society of Montgomery County shows the City Hall bell c. 1890. According to the label on the back of the photograph, the bell was used for fires and was later sold for scrap. 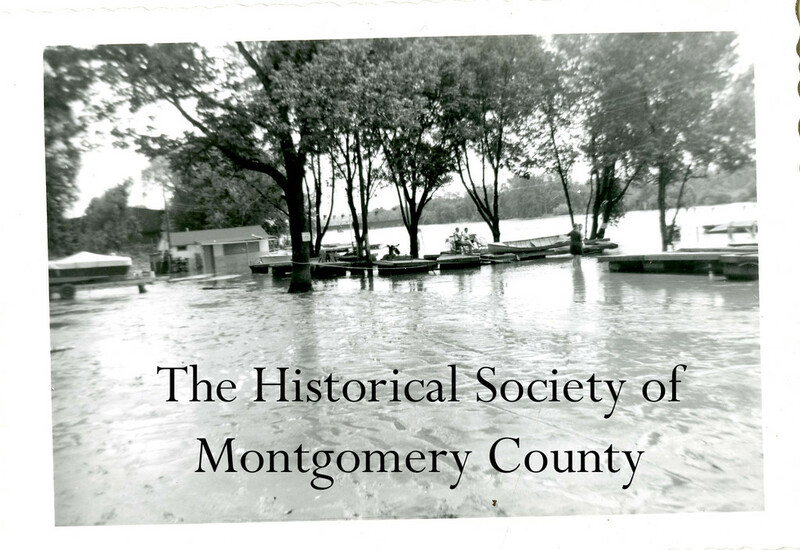 This photo from the Historical Society of Montgomery County shows flooding in 1933. The location is not known. 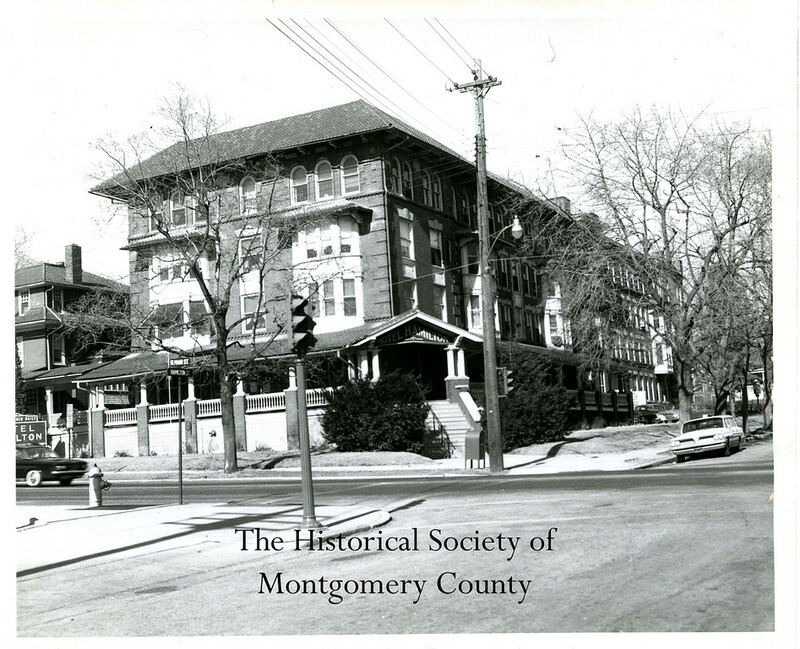 This undated photograph from the Historical Society of Montgomery County shows the Lincoln Hotel in Norristown. It was on the corner of West Main and Barbadoes streets. 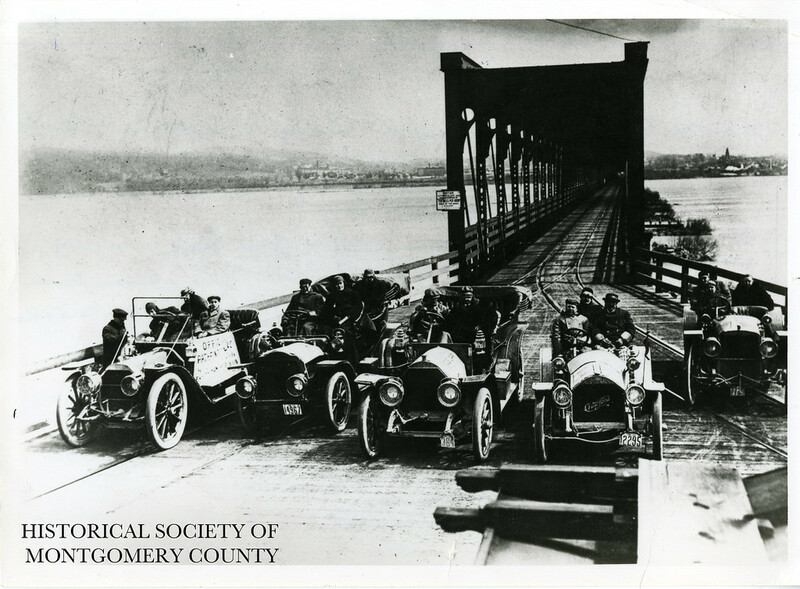 This photo from the Historical Society of Montgomery County shows the 1909 Automobile Club of Norristown at the Columbia, Pa. bridge during the start of a “Pathfinder Run.” The 1st and 3rd cars are Chadwicks, which were producing in Pottstown. 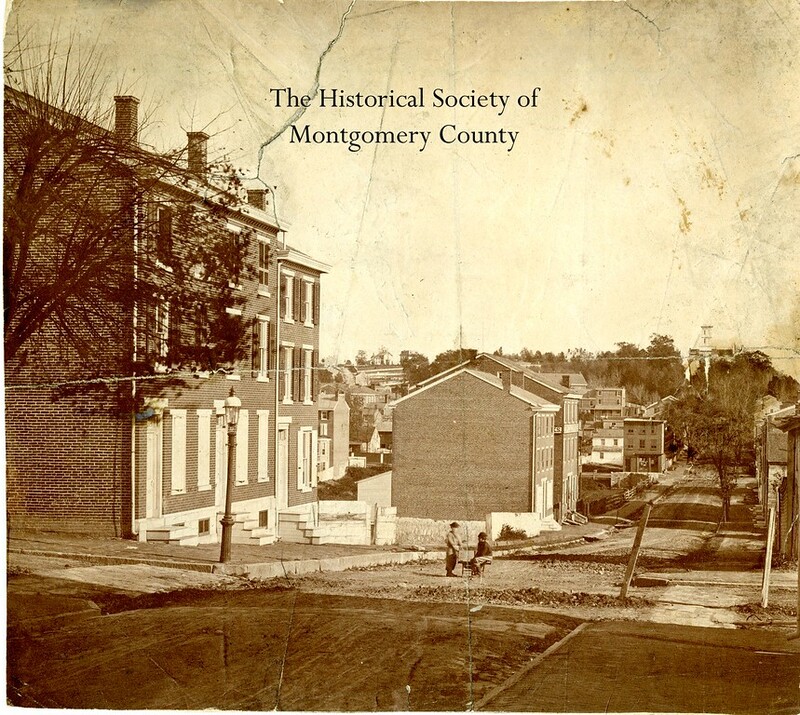 This photo from the Historical Society of Montgomery County shows downtown Norristown circa 1890. 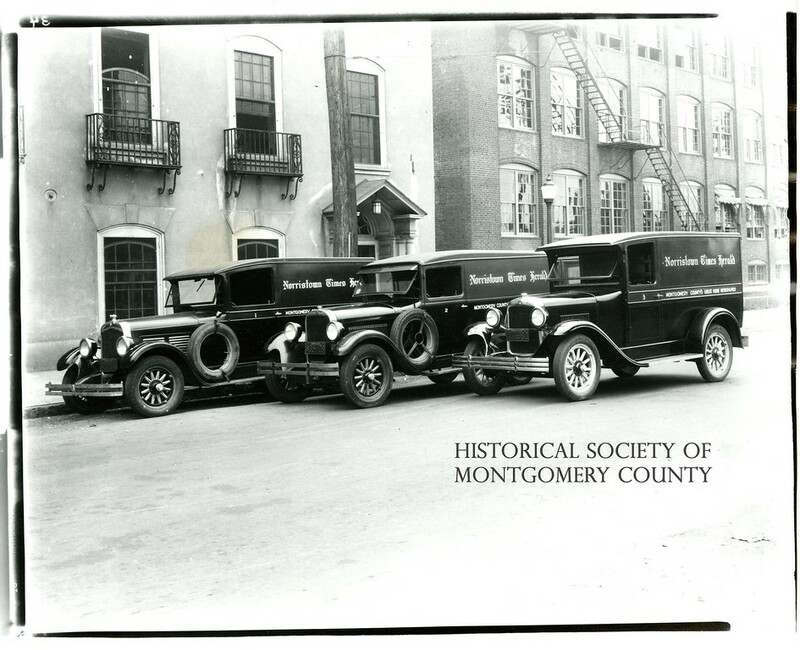 This undated photograph from the Historical Society of Montgomery County shows what The Times Herald's delivery trucks used to look like. 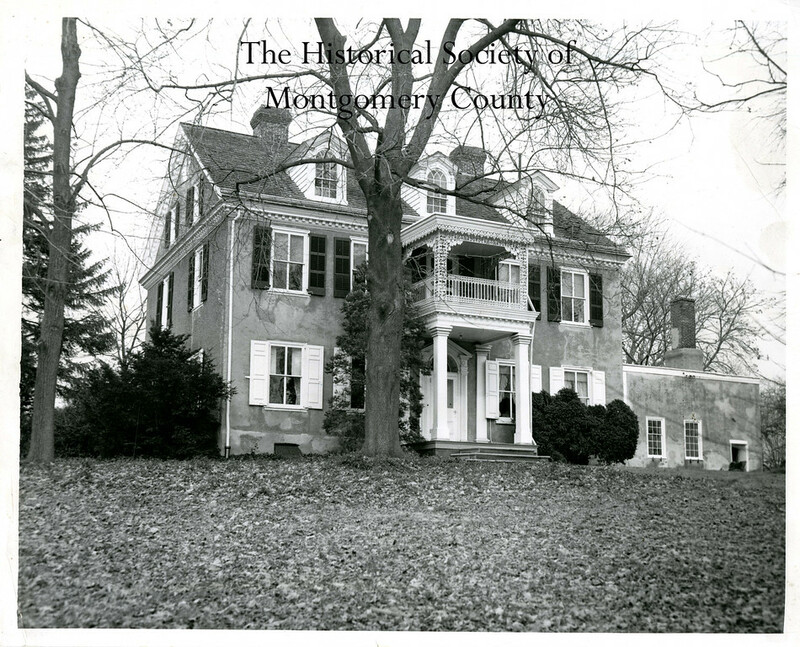 This undated photo from the Historical Society of Montgomery County shows the Jefferson House in East Norriton. The building is located at 2519 DeKalb Pike and used to be a restaurant. It has since been turned into a housing development. 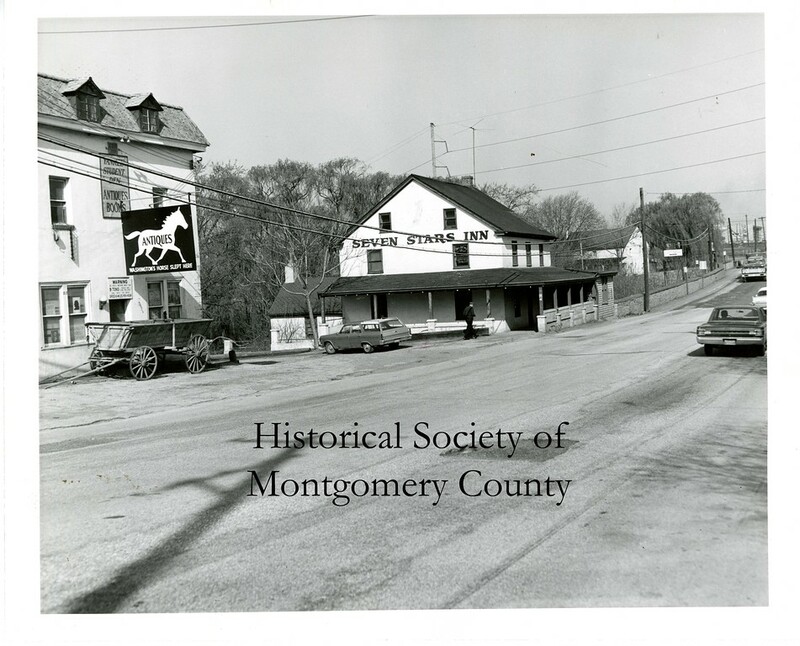 This photograph from the Historical Society of Montgomery County shows Scheidt Brewing Company in Norristown in 1975. 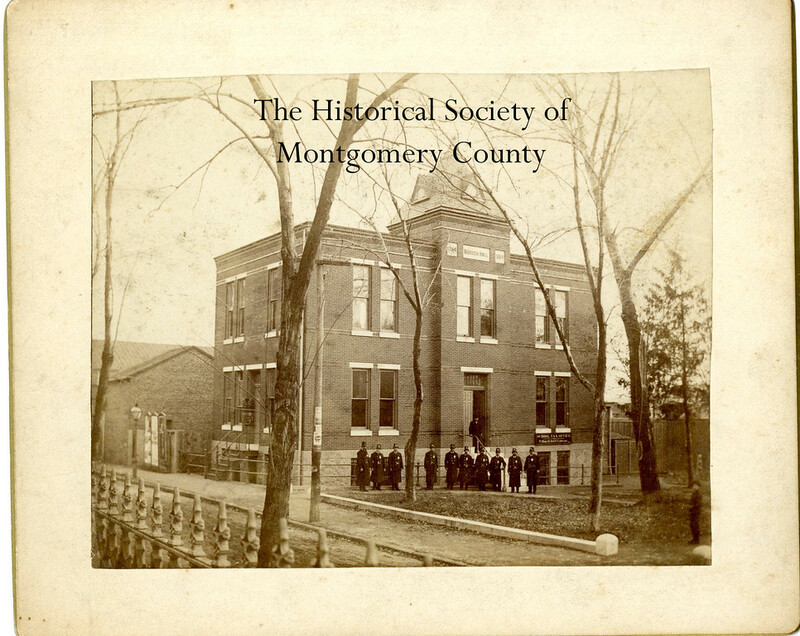 This photograph from the Historical Society of Montgomery County shows City Hall in Norristown in 1896. 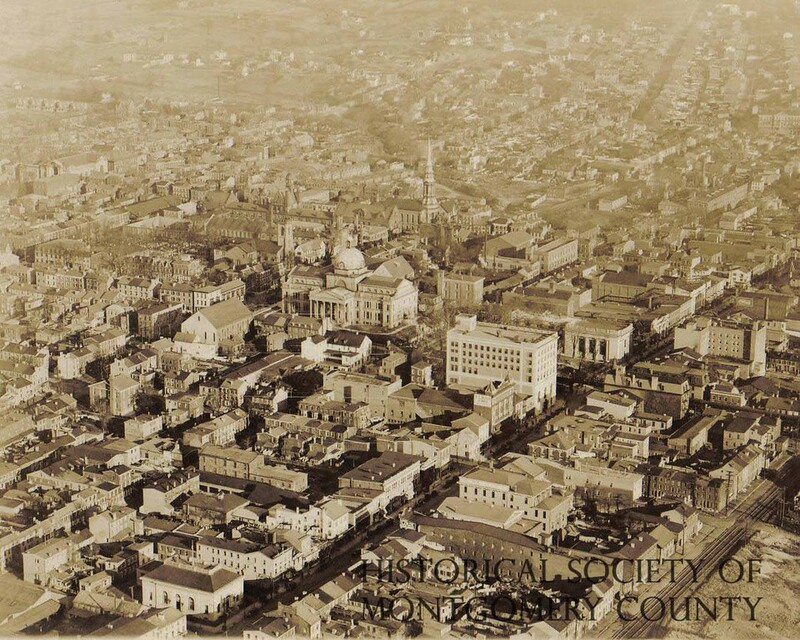 This photo provided by the Historical Society of Montgomery County shows an aerial view of downtown Norristown circa 1930. 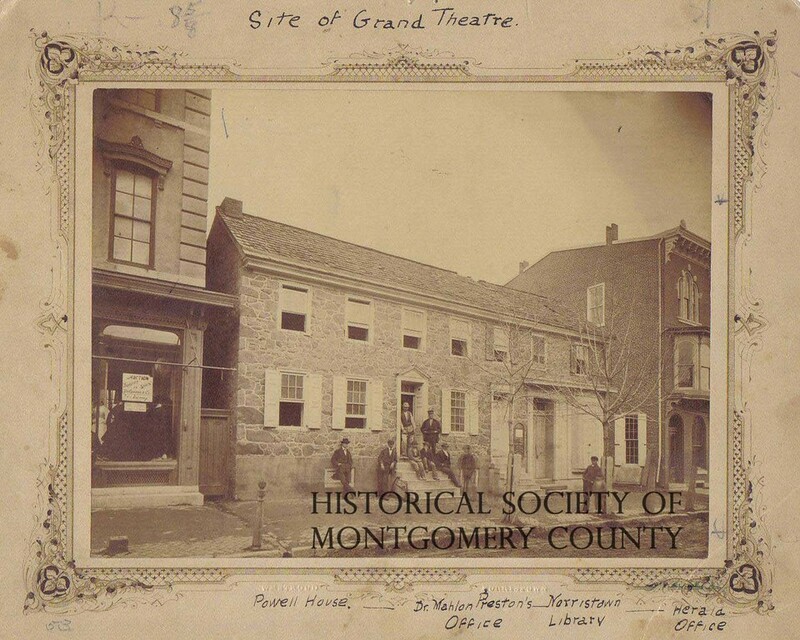 This photograph from the Historical Society of Montgomery County shows the site of the Grand Theater on East Main Street in Norristown circa 1860. This was also the early Times Herald office. The theater — originally the Grand Opera House — was built here in 1871. 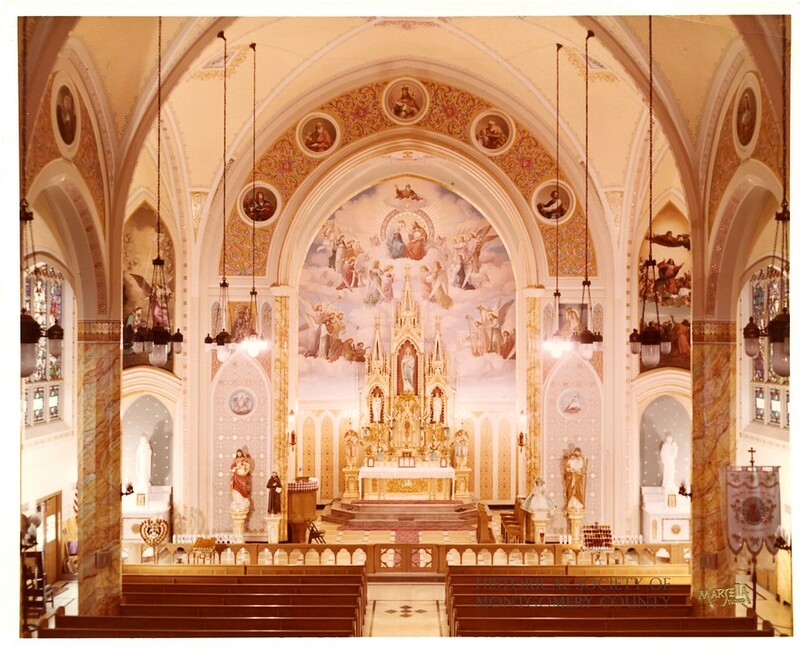 This photo from the Historical Society of Montgomery County shows the interior of St. Mary's Church in Conshohocken. The Historical Society believes it is from the 1950s. 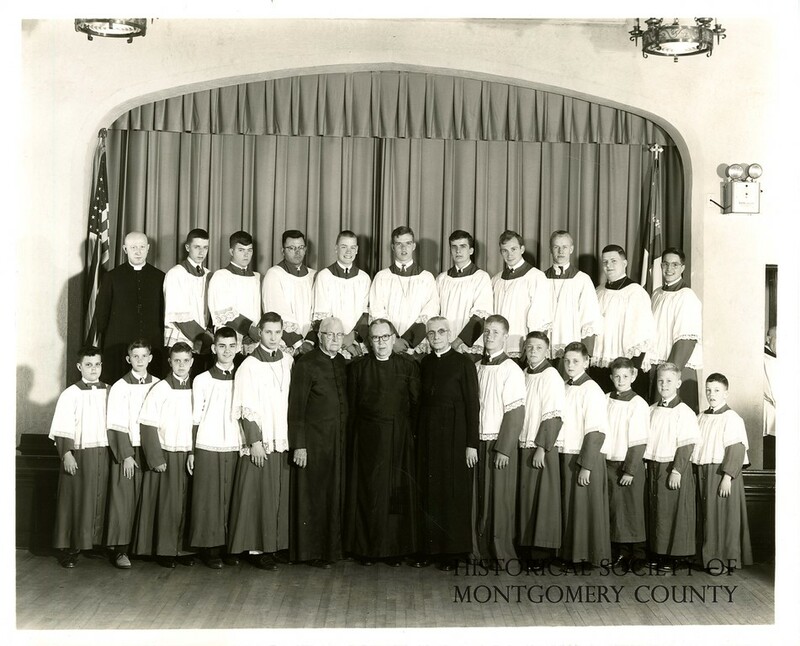 This photo from the Historical Society of Montgomery County is a group picture taken at St. John's Episcopal Church in Norristown in 1964. 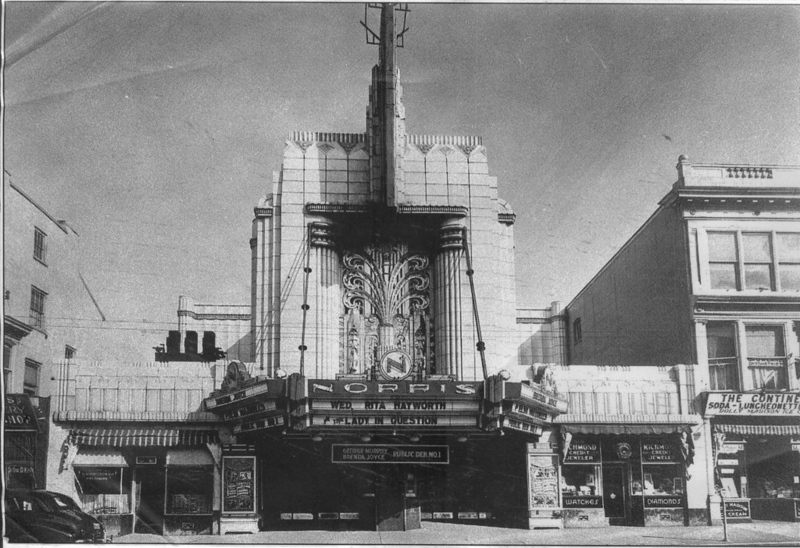 This Times Herald file photo shows the Norris Theatre at 125 W. Main Street in Norristown circa 1940. 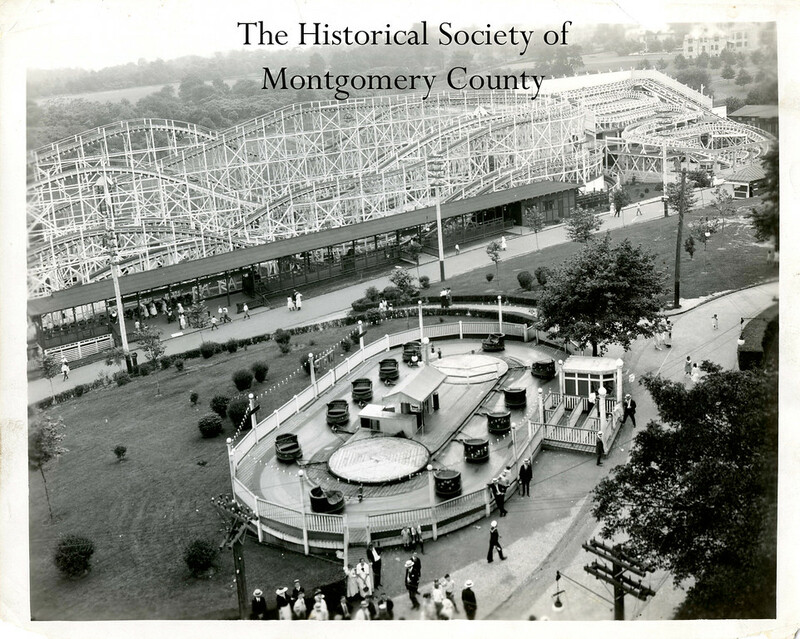 It opened on Dec. 22, 1930 and was demolished in March 1983. It is now a public parking garage. 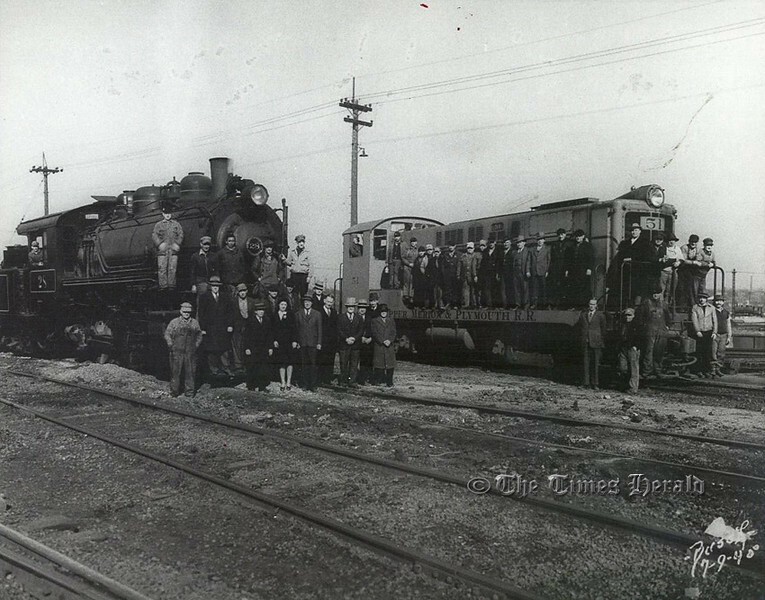 This Times Herald file photo dated July 9, 1940 shows two train cars. One of the trains has “Upper Merion & Plymouth R.R.” written on the side. 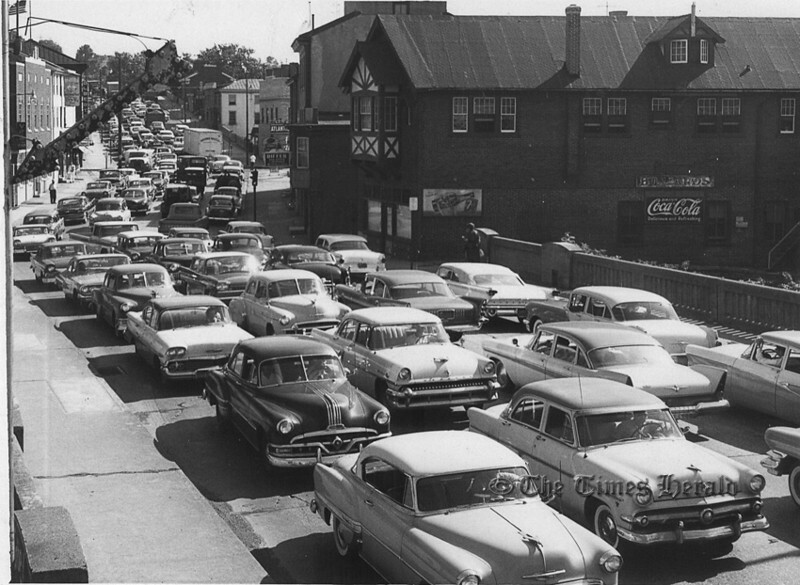 This undated Times Herald file photo shows traffic in Bridgeport. 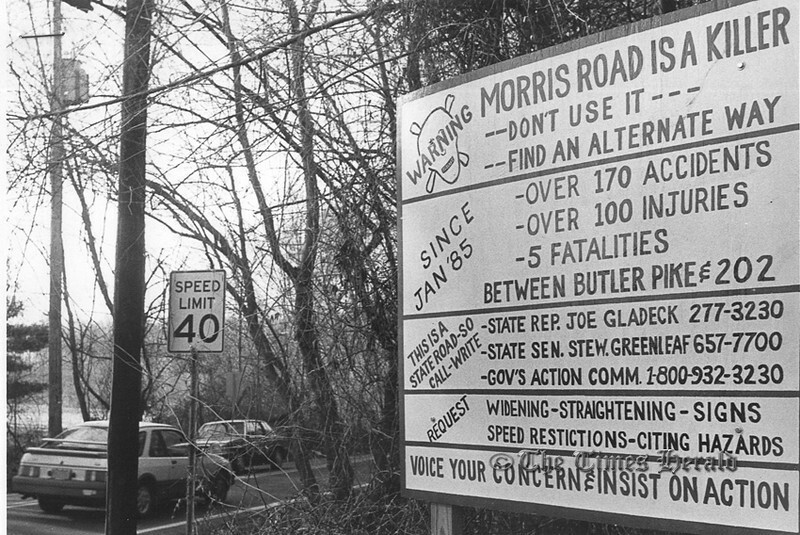 This Times Herald file photo from Feb. 8, 1988, shows a sign in Whitpain warning motorists about Morris Road. 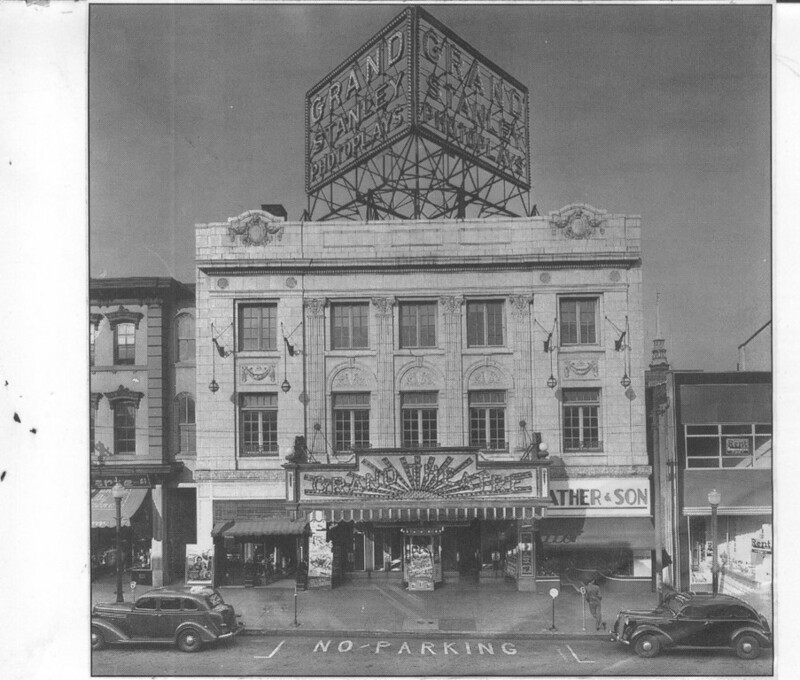 This undated Times Herald file photo shows the Grand Theatre, once located between Swede and DeKalb streets on Main Street in Norristown. It was knocked down May 18, 1976 and is now a public parking lot. 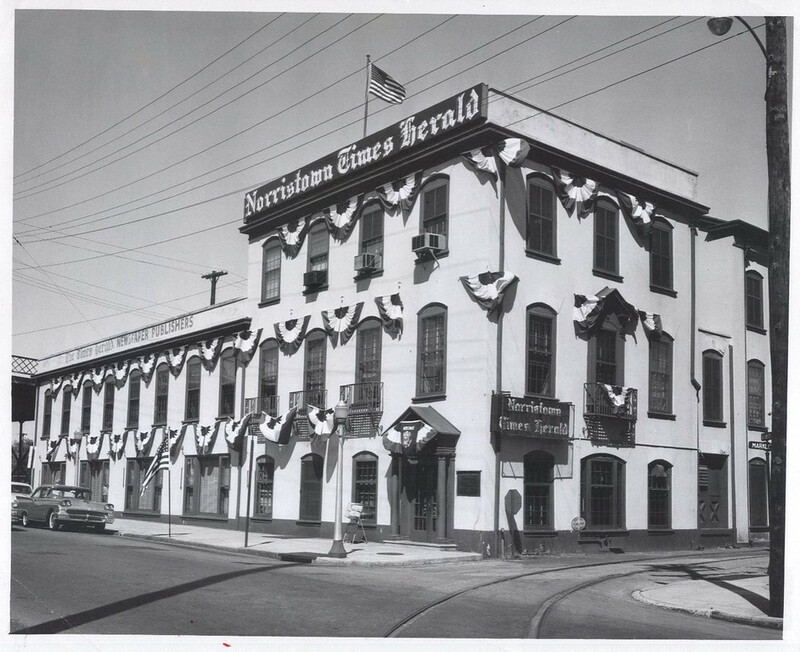 This undated file photo shows what The Times Herald building — located at 410 Markley Street in Norristown — used to look like. 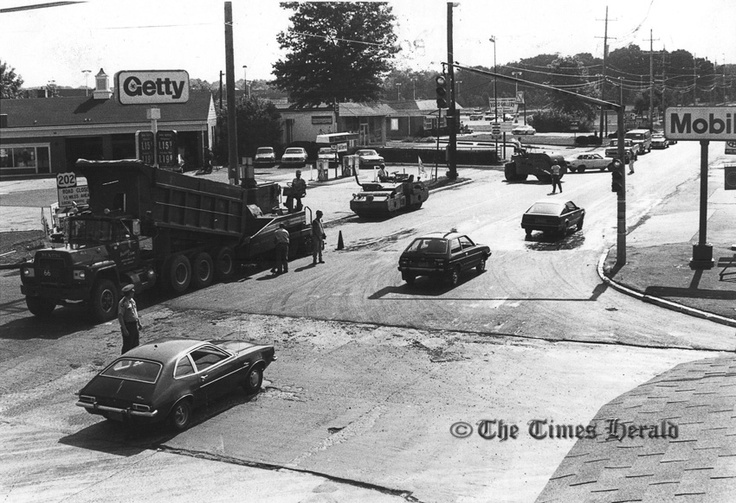 This Times Herald file photo dated Sept. 1, 1983 shows traffic moving cautiously on eastbound Route 73 in Whitpain Township as workmen completed resurfacing its intersection with route 202. The $748,000 project, in two phases, also included installing a box culvert across the Stoney Creek on Route 202 south of Montgomery County Community College and new drainage and widening of Route 202 at Morris road. 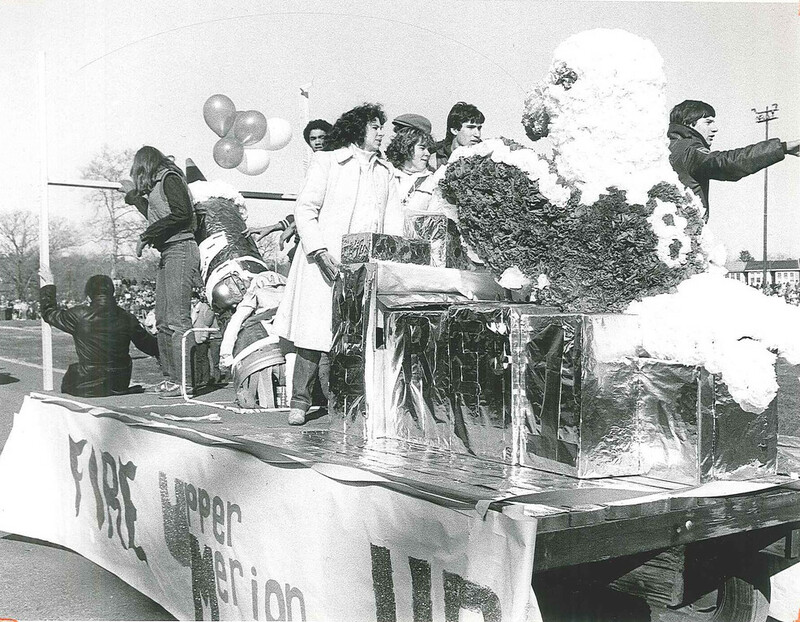 A two-week detour ' Route 202 between Morris road and Route 73 began Aug. 27, 1983. 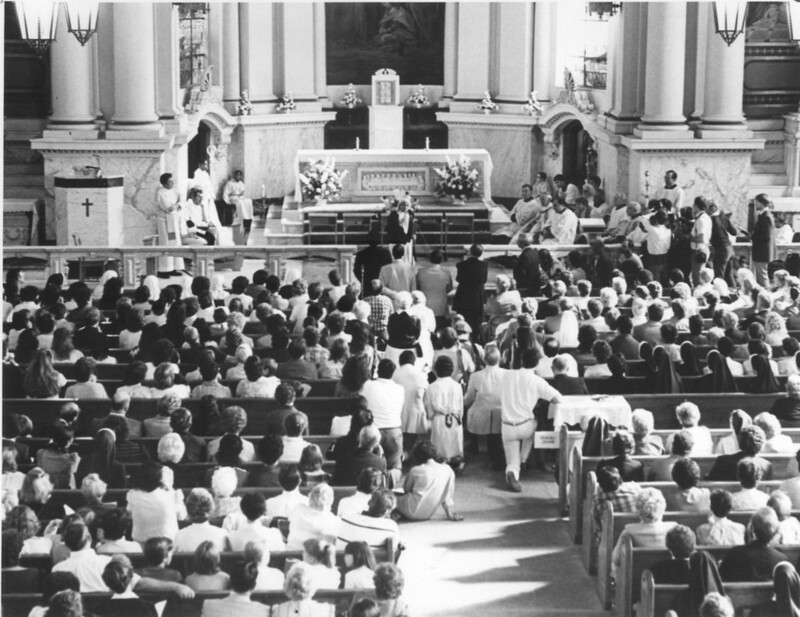 This Times Herald file photo shows Mother Teresa addressing a standing-room-only crowd at St. Patricks’s Church in Norristown that gathered for mass Oct. 29, 1984. Mother Teresa was in Norristown for the newly opened convent of the Missionaries of Charity, which was established by members of the order she founded in 1950. 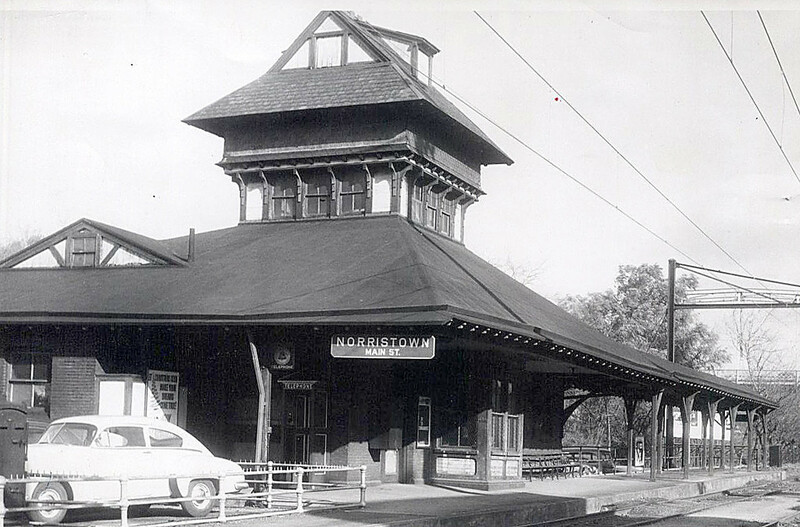 This undated Times Herald file photo shows the Main Street Station at the corner of Main and Markley streets in Norristown. 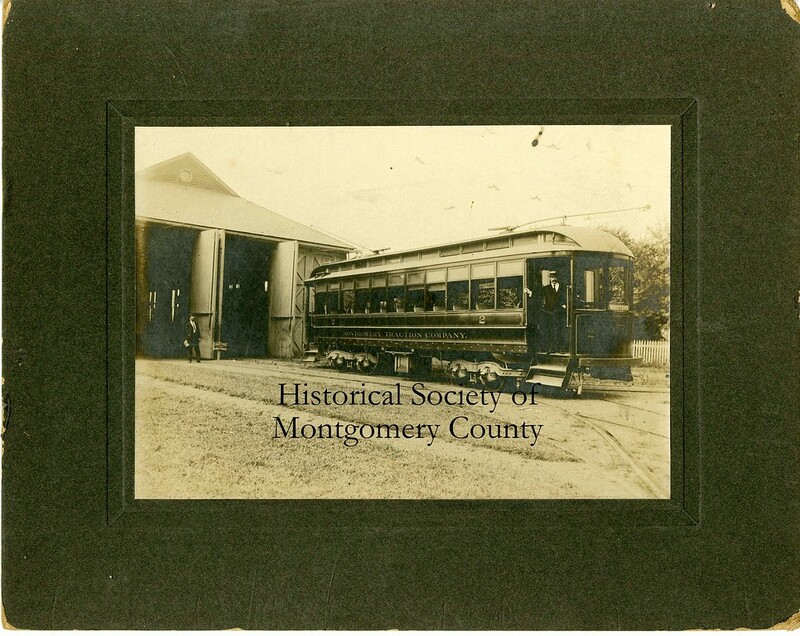 This photo from about 1900 shows a trolley from the Montgomery Traction Company. 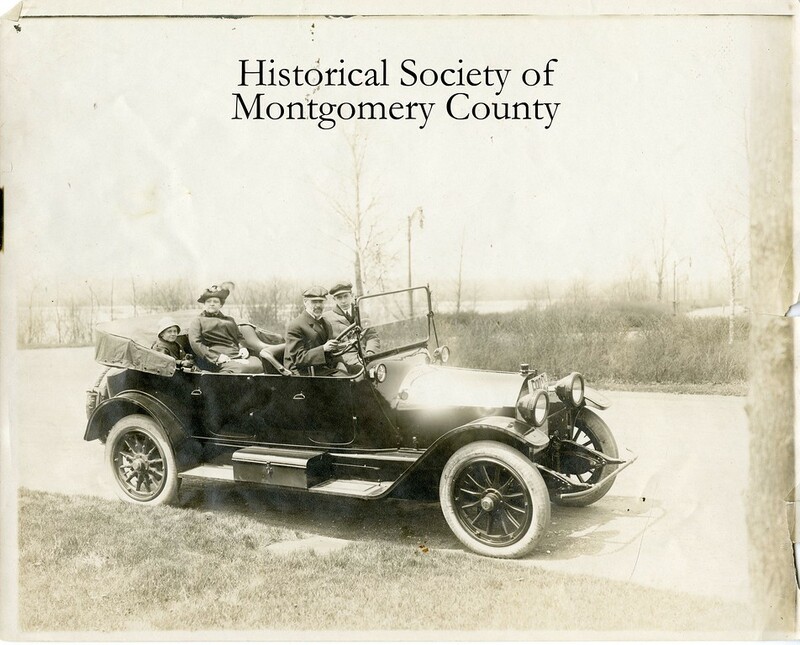 Herman T. Lukens and family take a drive in this undated Historical Society of Montgomery County photo. 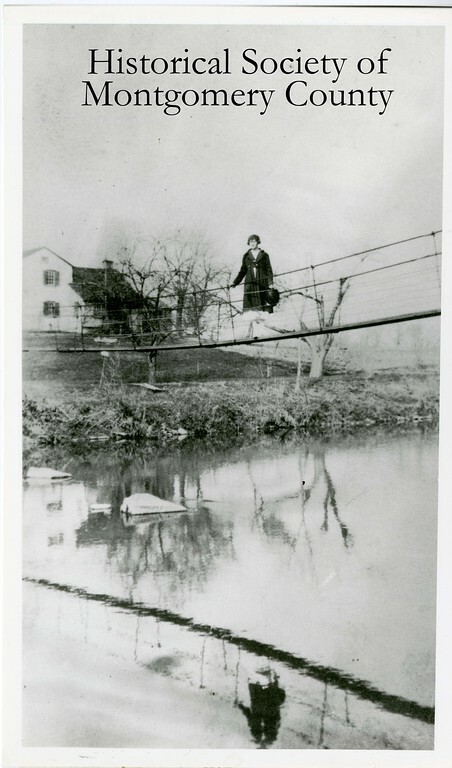 Grace Swartley, later known as Mrs. Samuel Bean, is seen on the Evansburg Swinging Bridge in this undated photo from the Historical Society of Montgomery County. 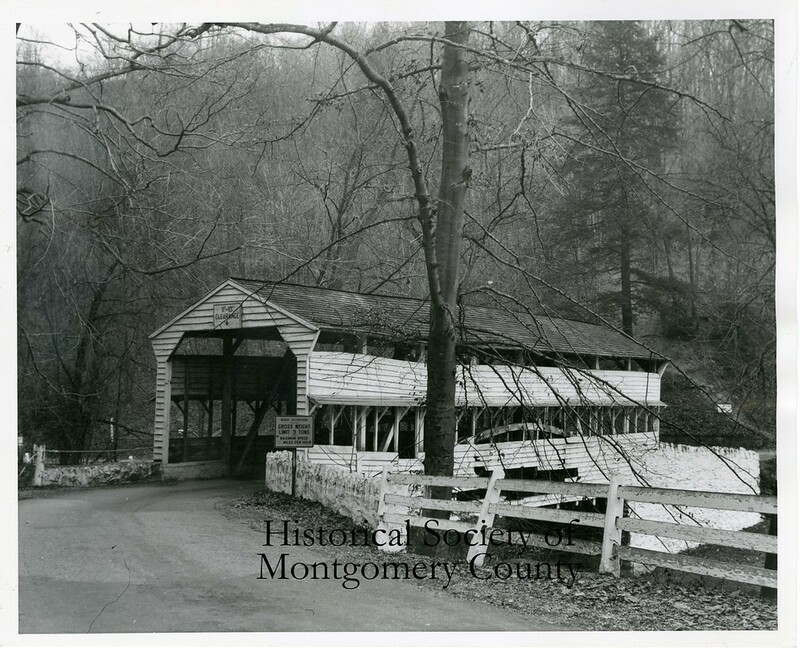 The bridge was destroyed in a 1935 flood. 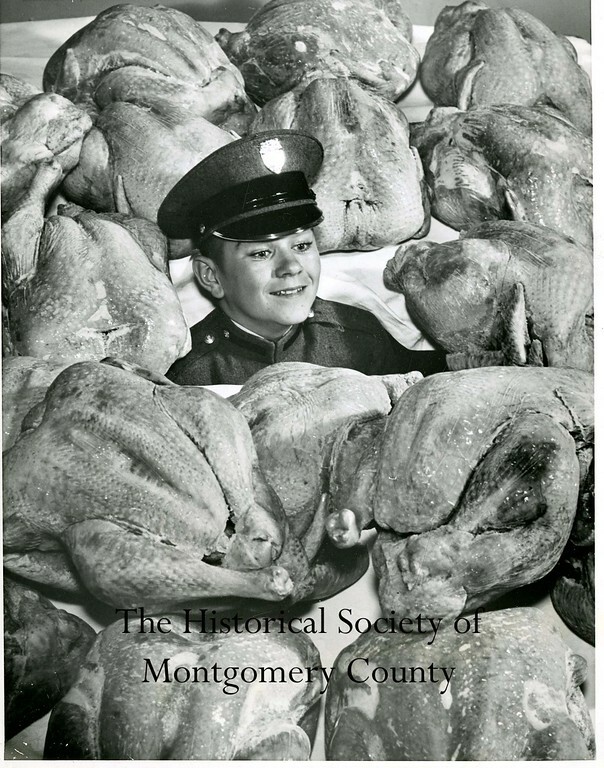 "Days Gone By" features old photographs from the Historical Society of Montgomery County's archives. 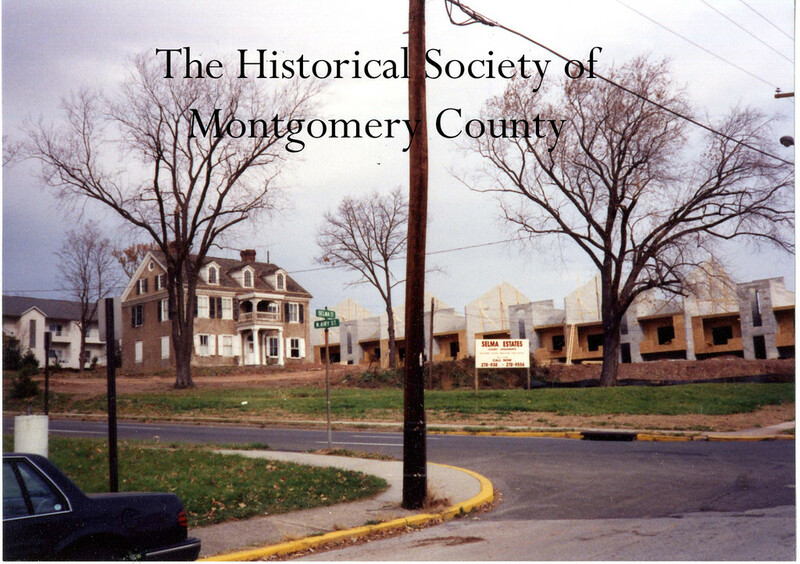 Interested in purchasing a photograph marked with "Historical Society of Montgomery County?" 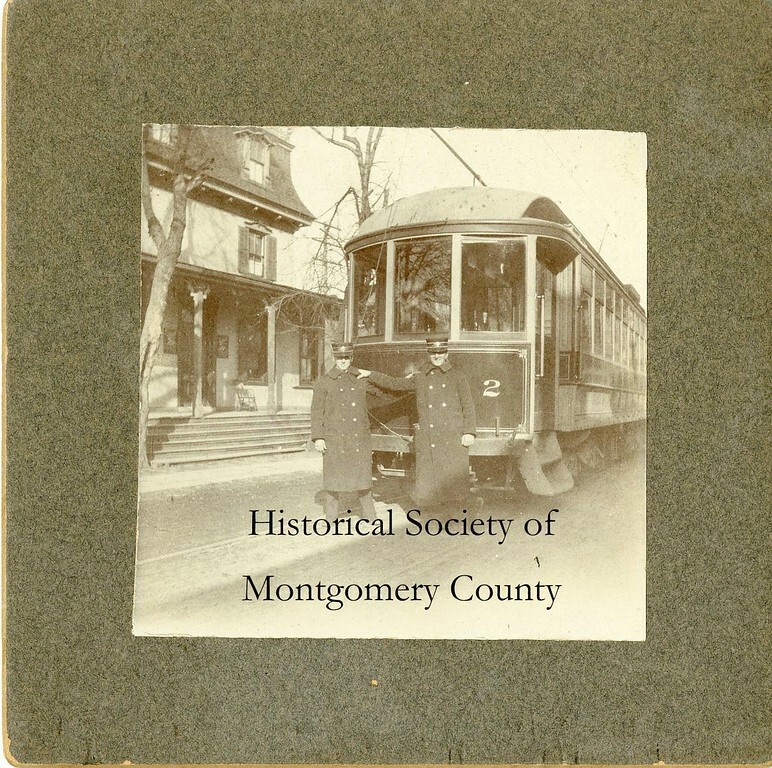 The Historical Society of Montgomery County sells reproductions of their photos. For more information email contact@hsmcpa.org or call 610-272-0297.